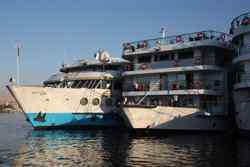 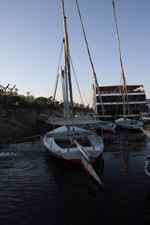 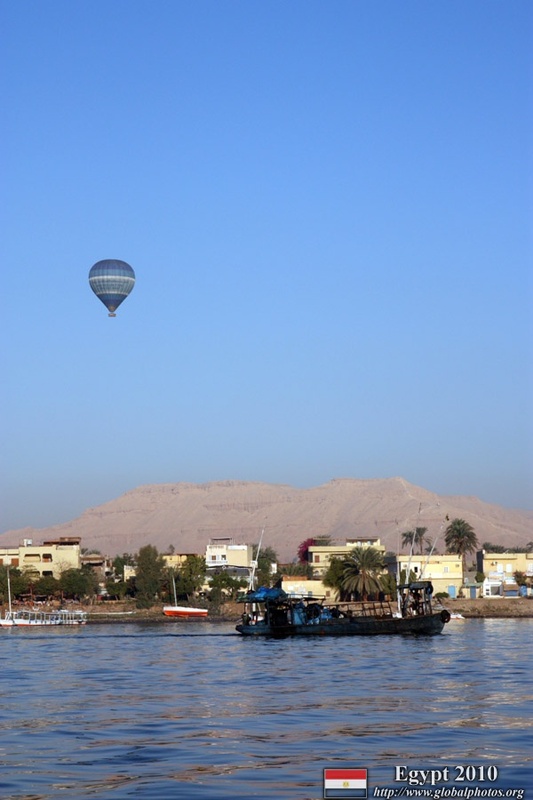 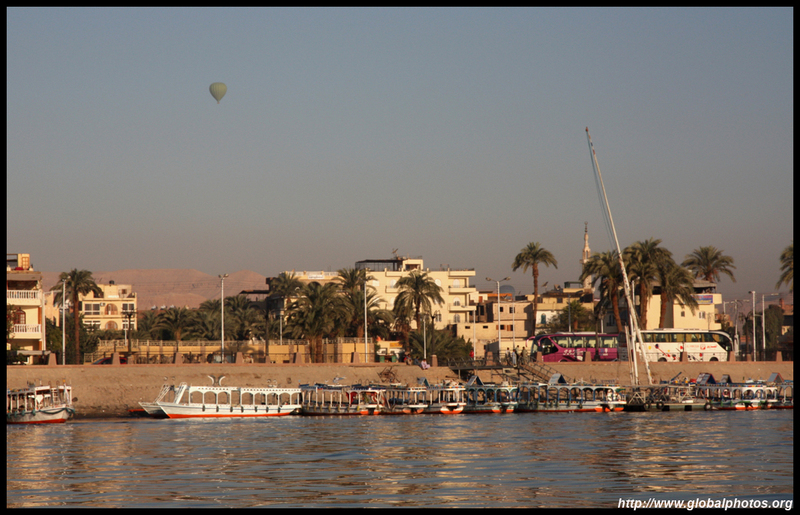 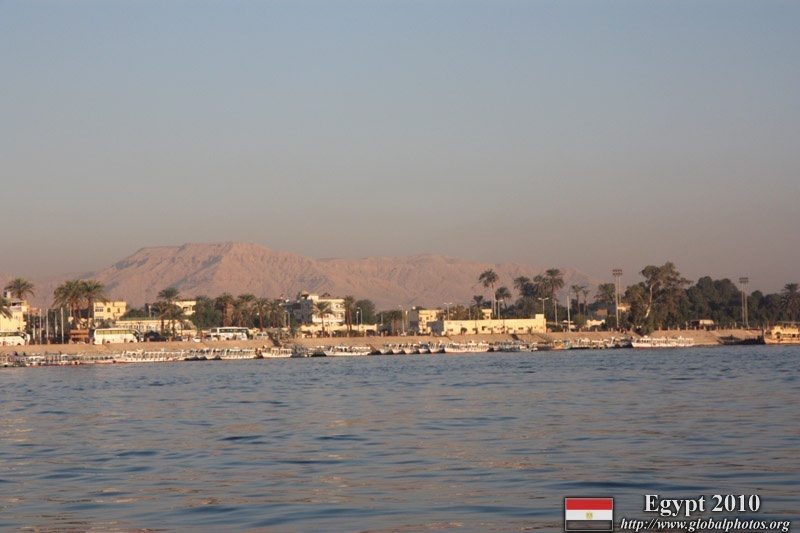 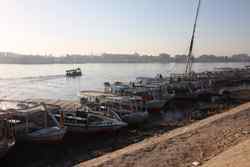 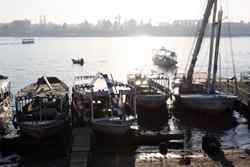 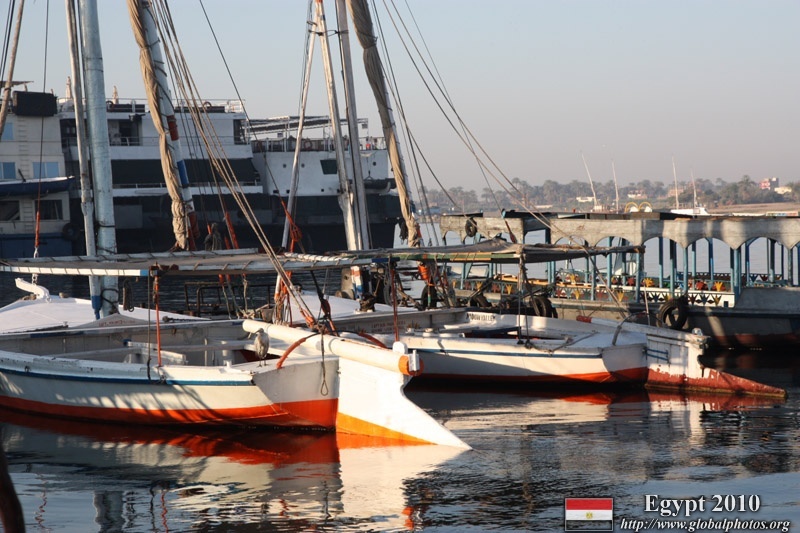 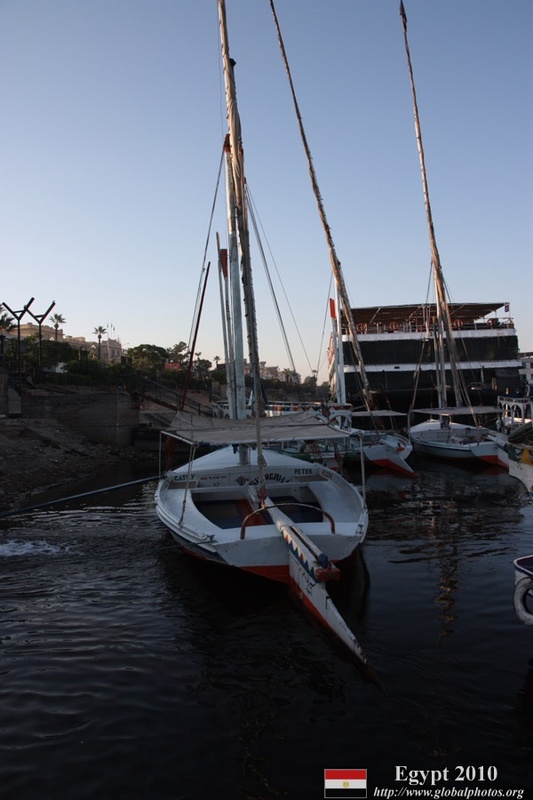 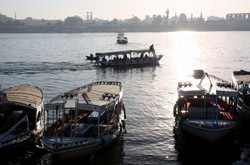 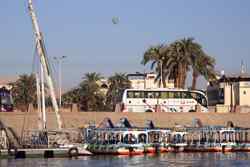 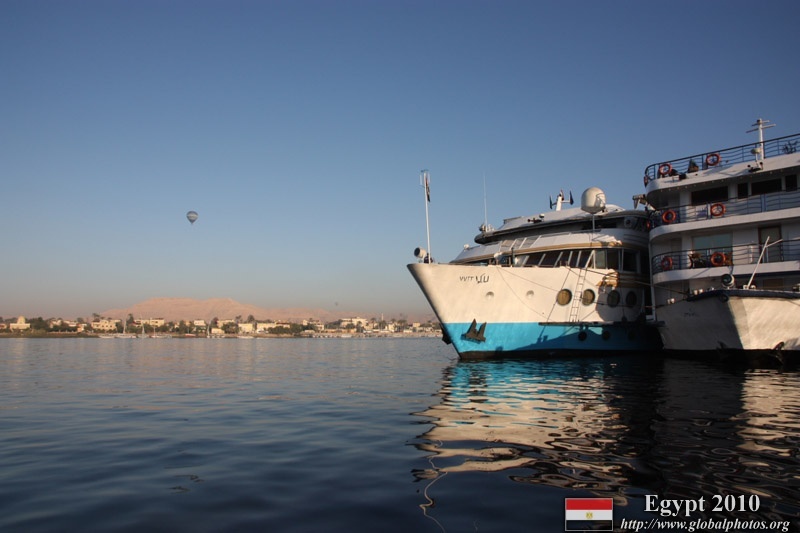 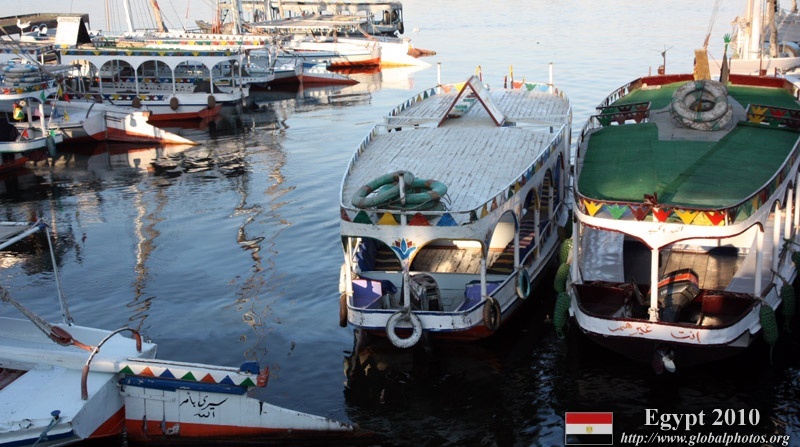 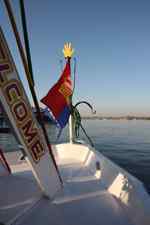 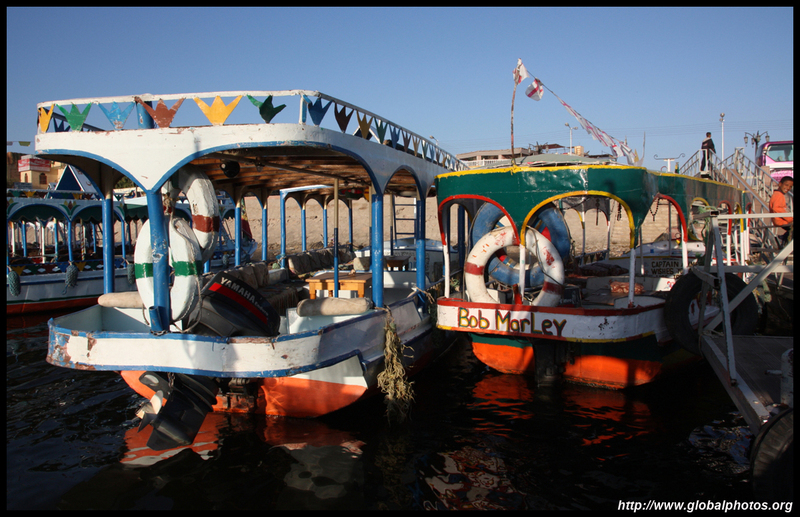 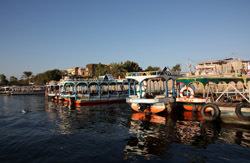 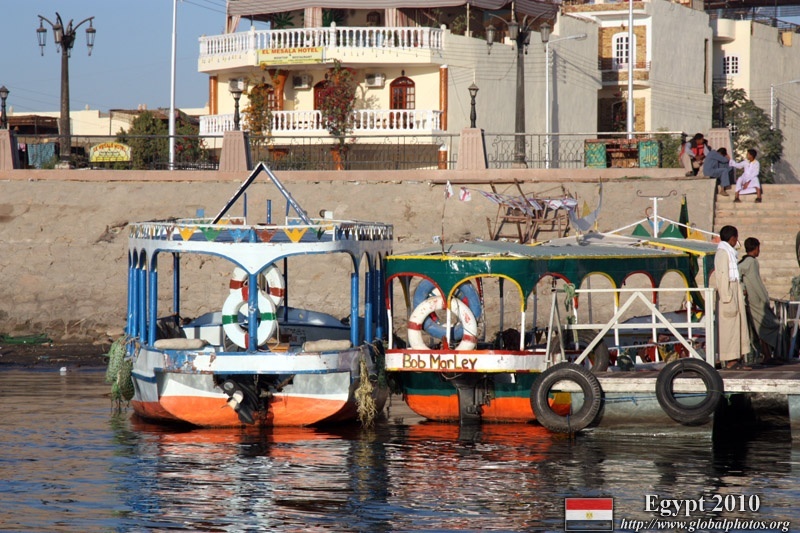 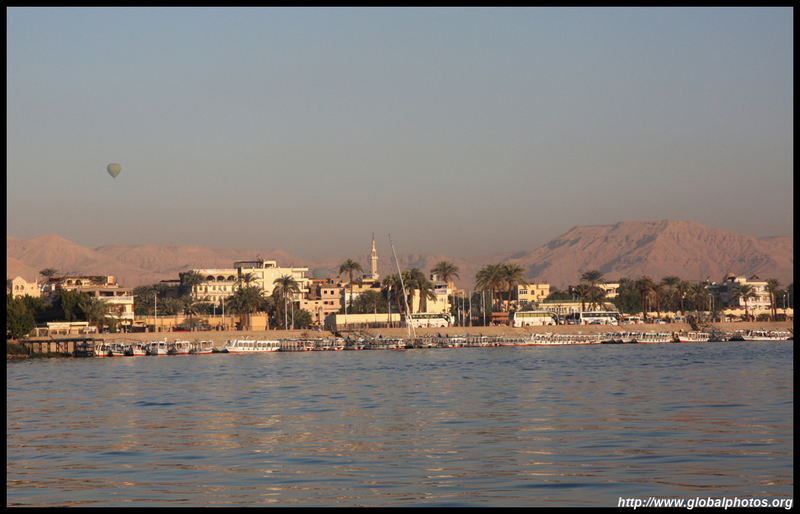 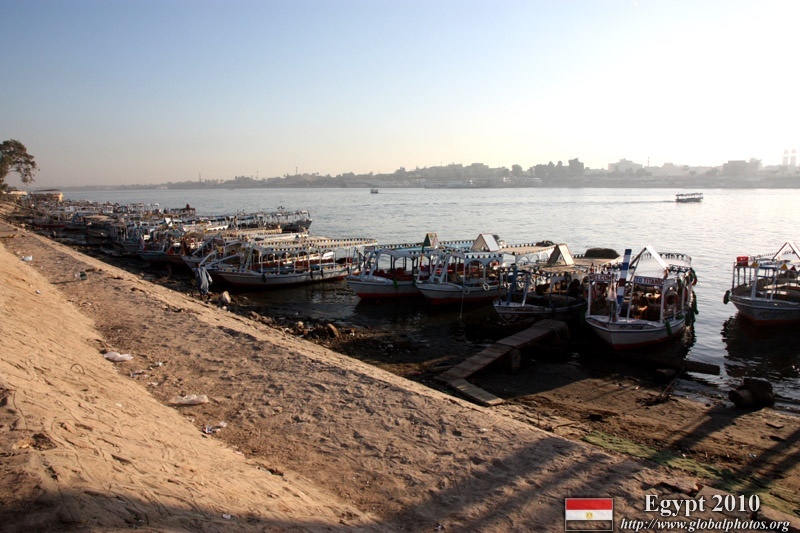 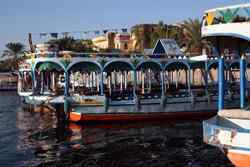 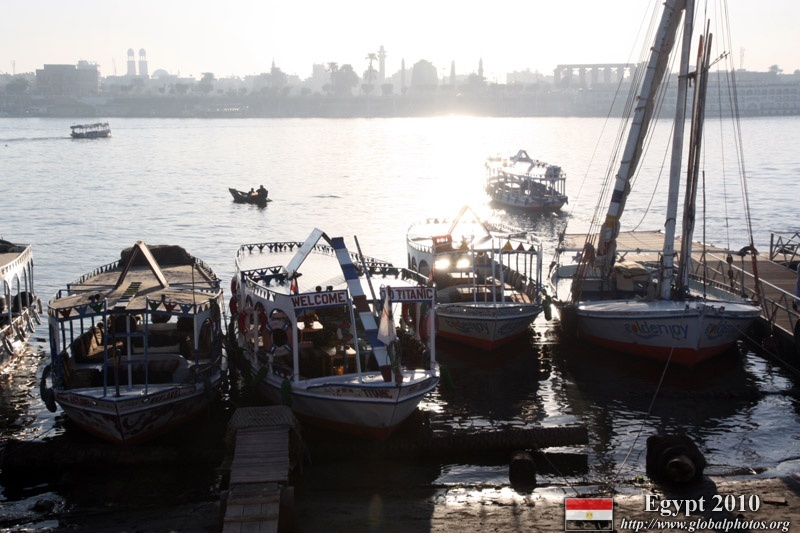 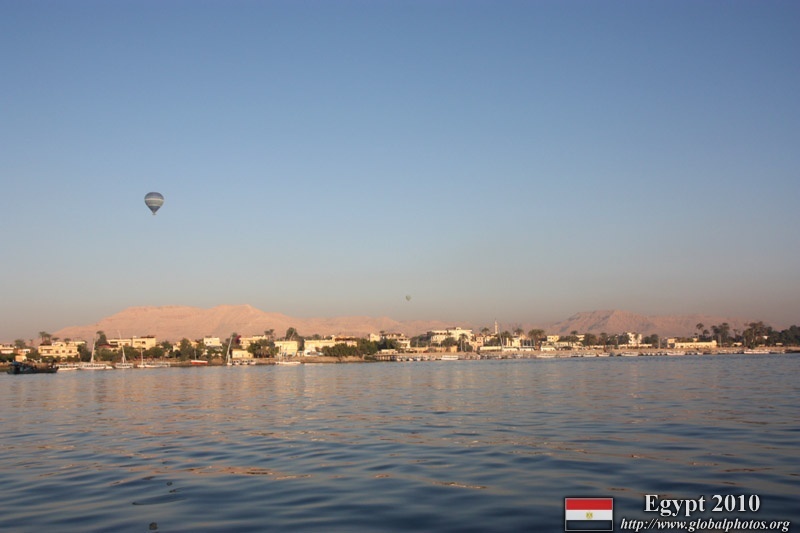 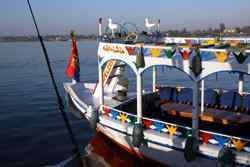 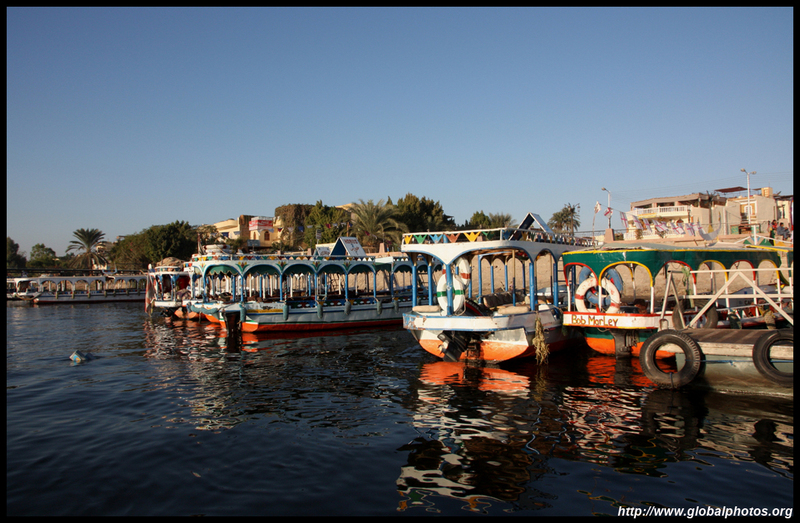 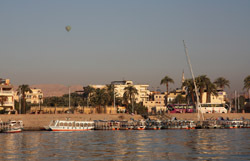 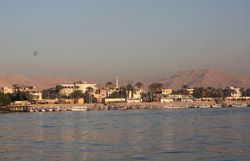 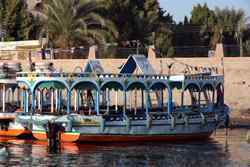 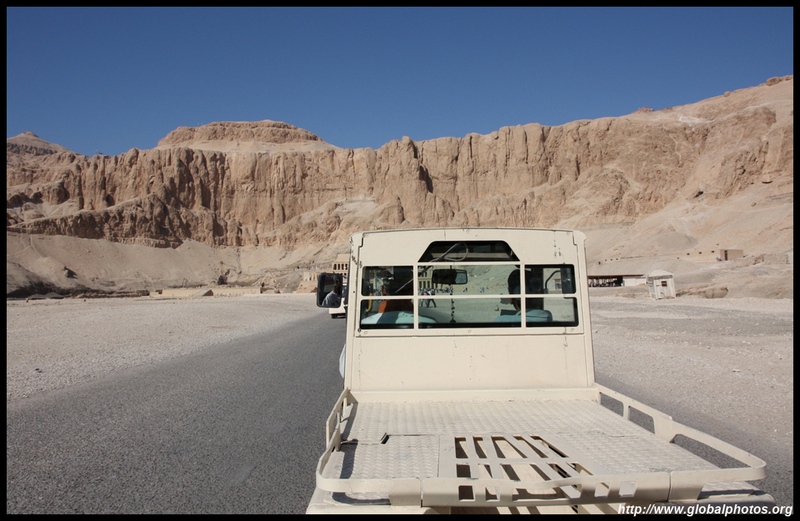 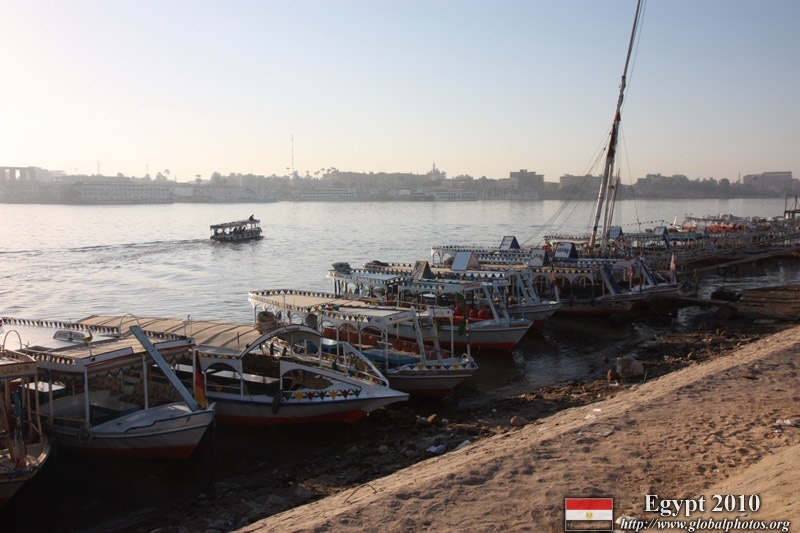 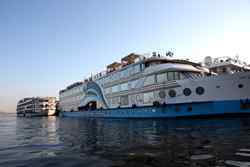 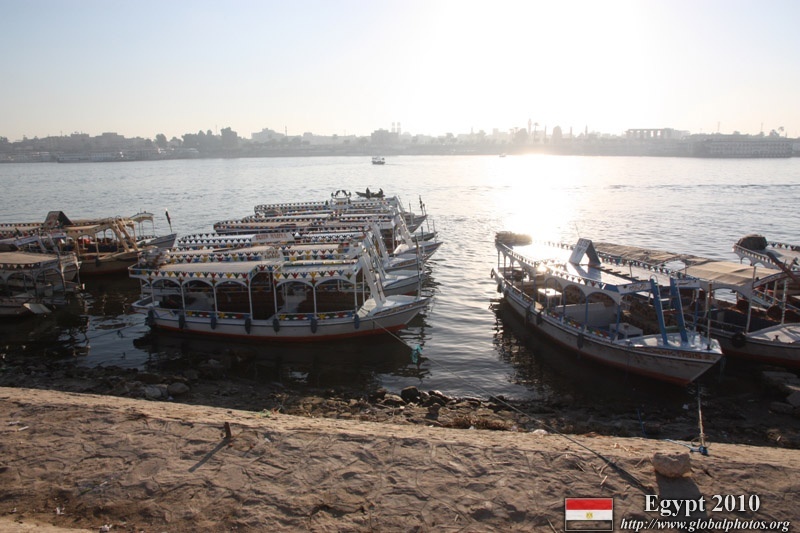 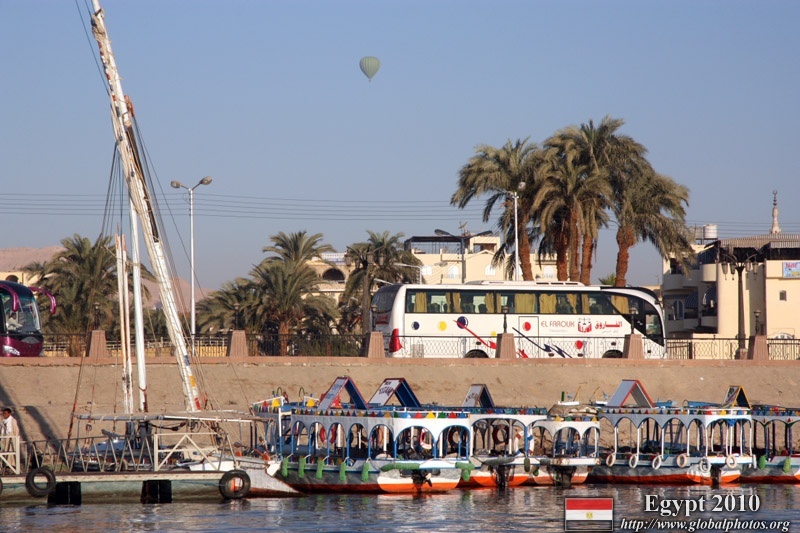 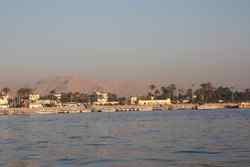 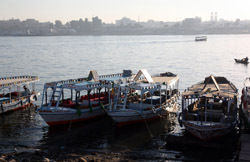 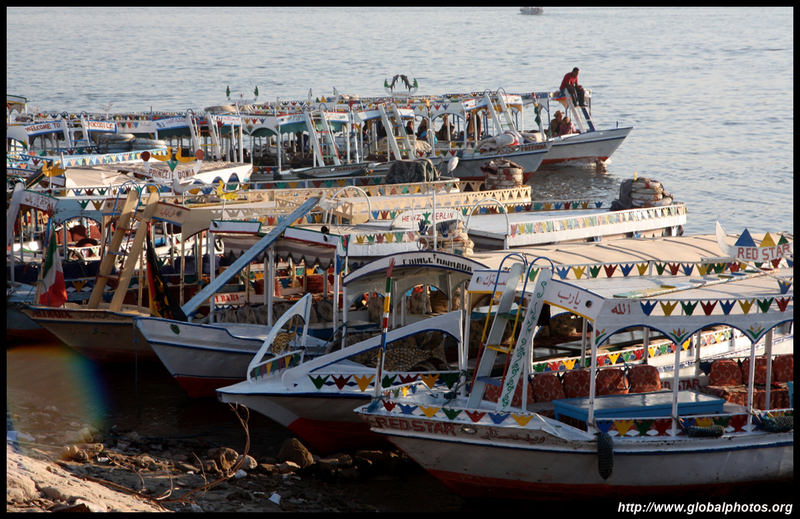 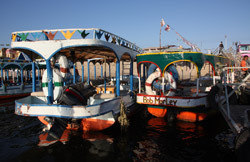 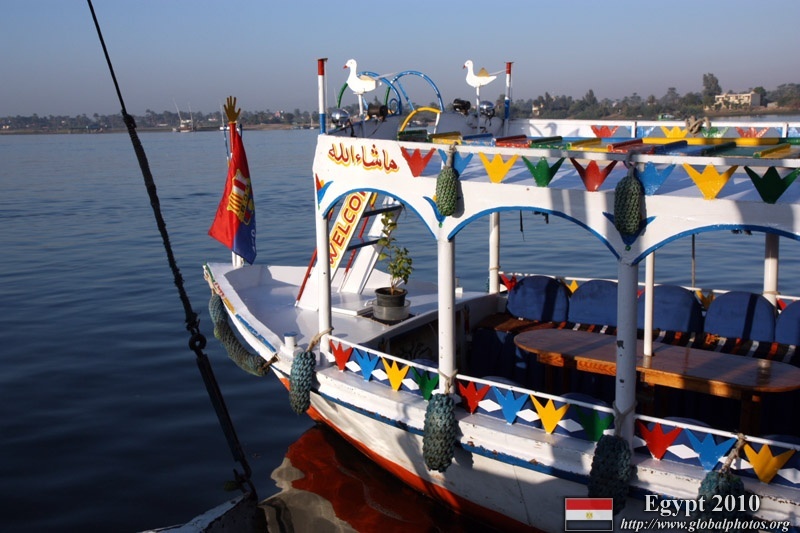 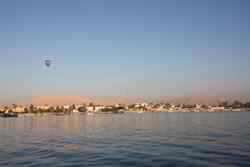 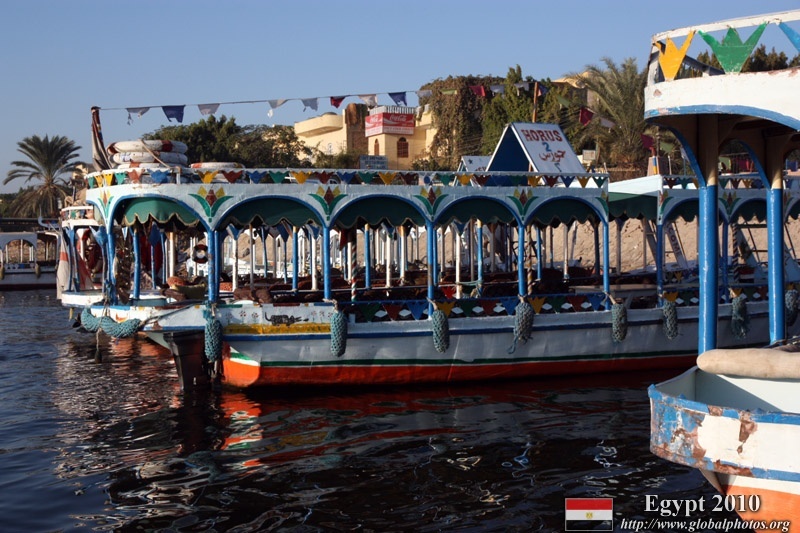 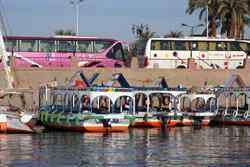 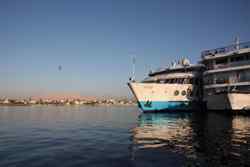 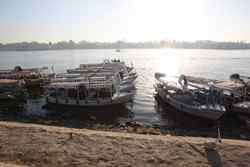 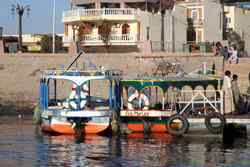 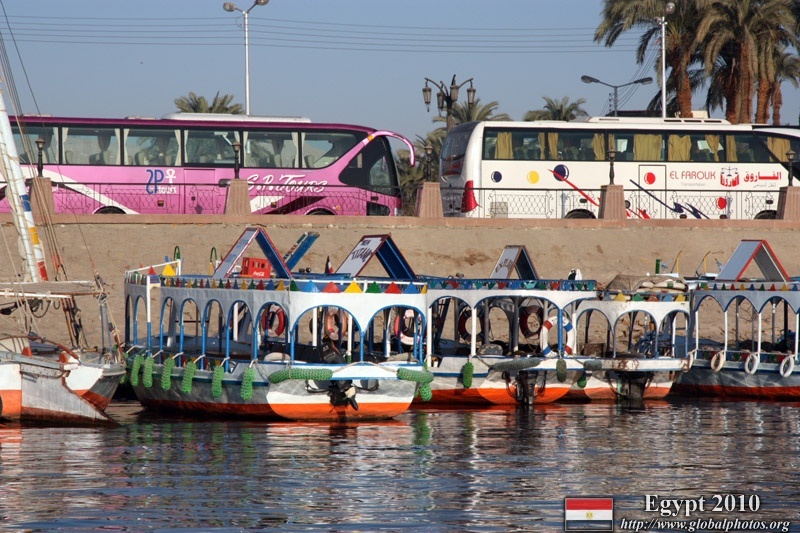 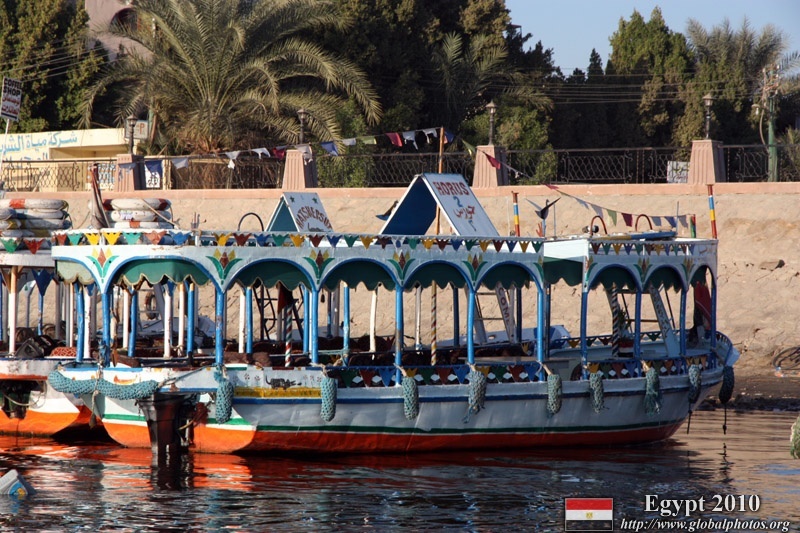 There are no bridges in the heart of Luxor, so to get to the West Bank, I had to take a small boat. 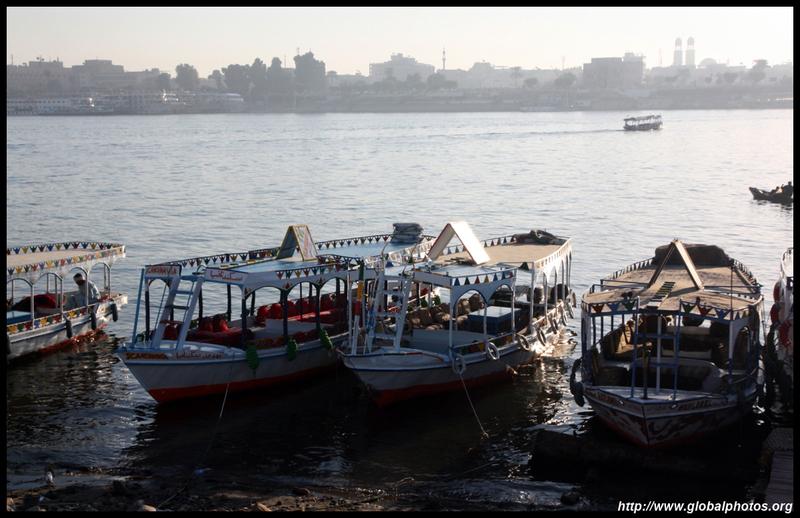 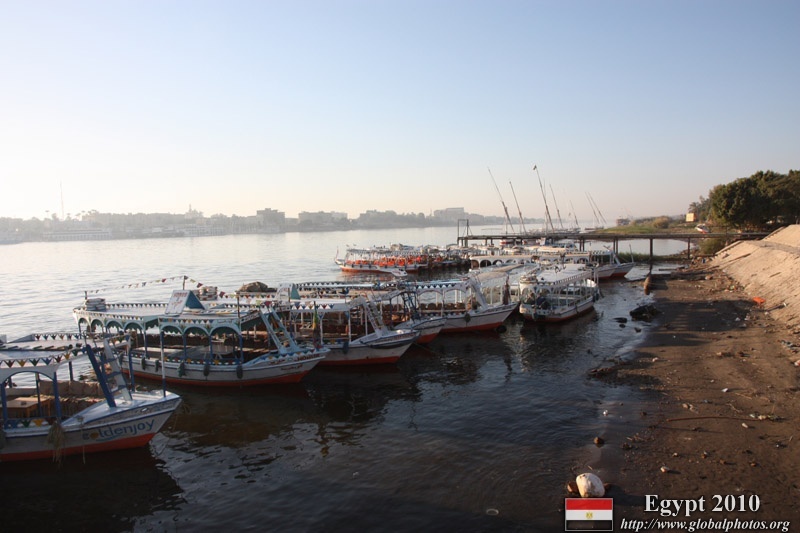 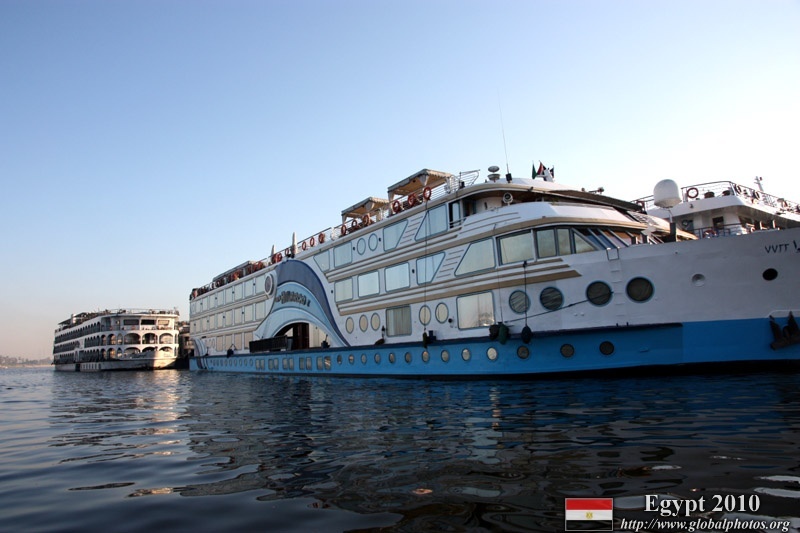 It was a short ride, and the Nile was very calm. 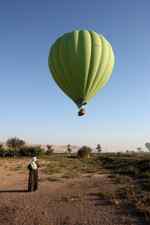 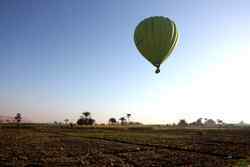 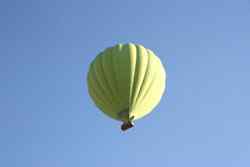 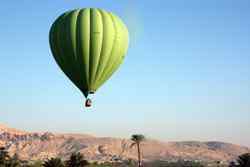 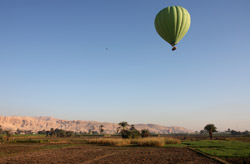 The hot air balloons were descending from their sunrise journeys. 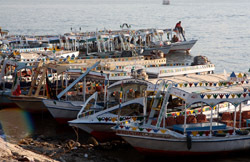 Once my feet reached the plank to shore, a legion of children trying to sell souvenirs approached. 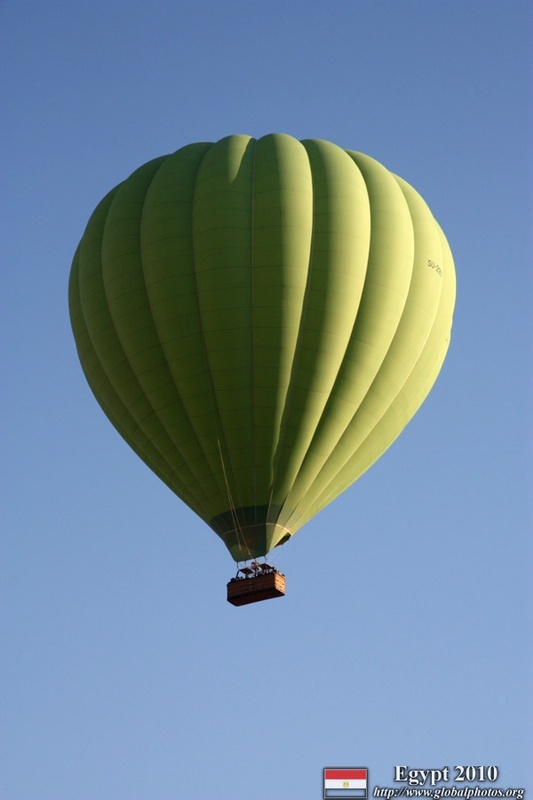 The infamous "one dollar" phrase resonated in the air. 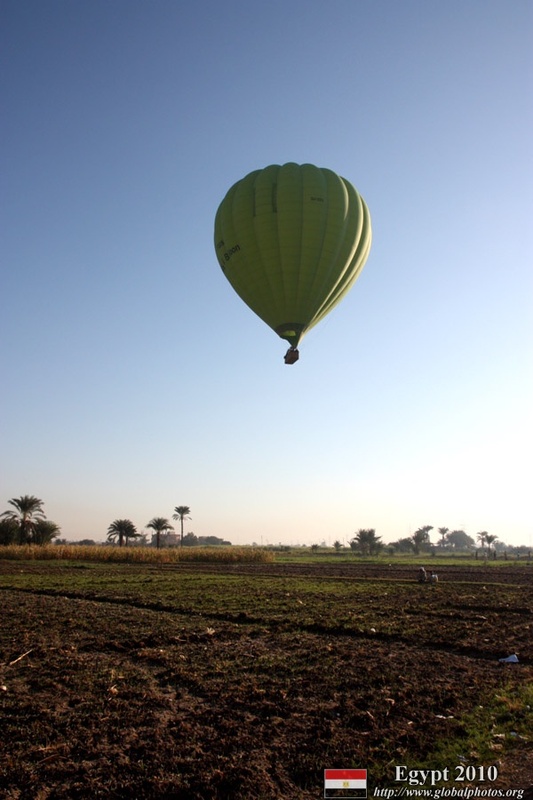 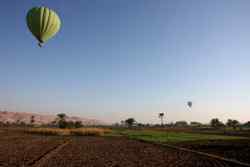 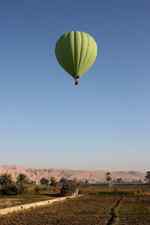 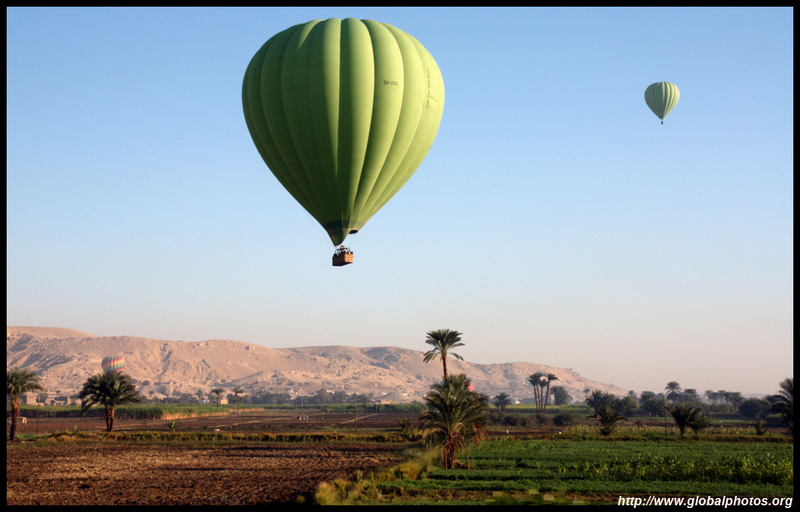 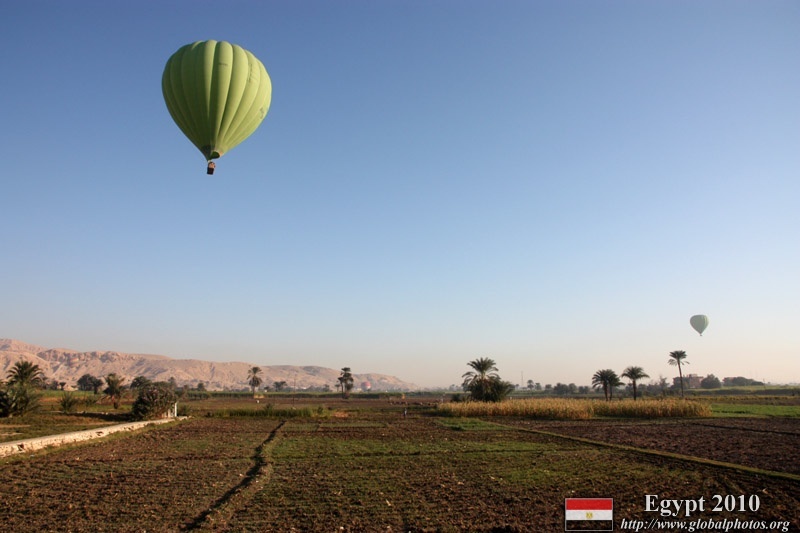 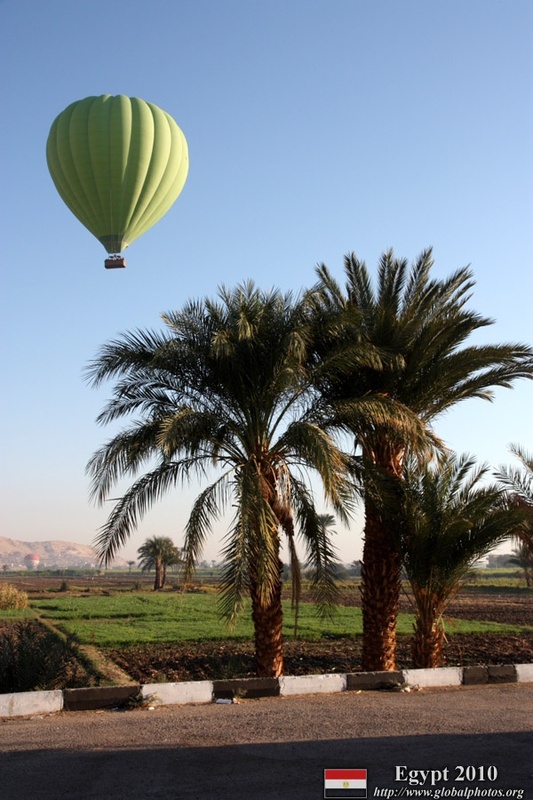 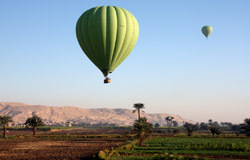 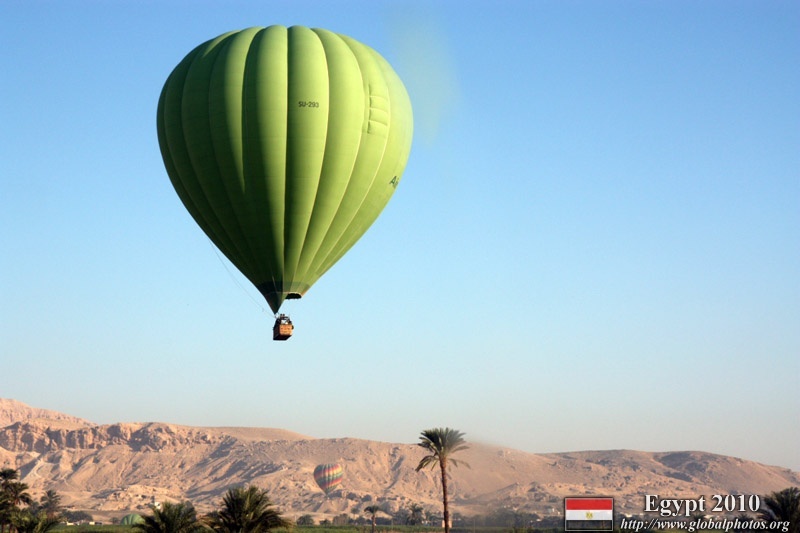 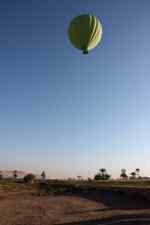 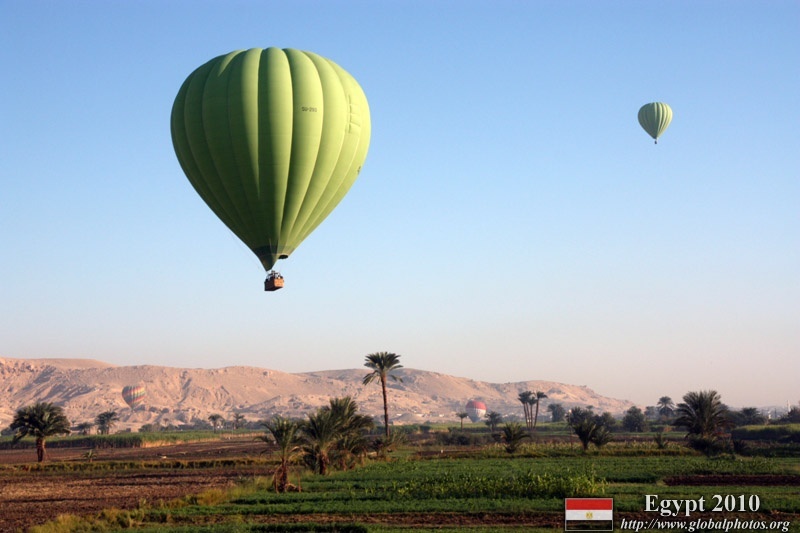 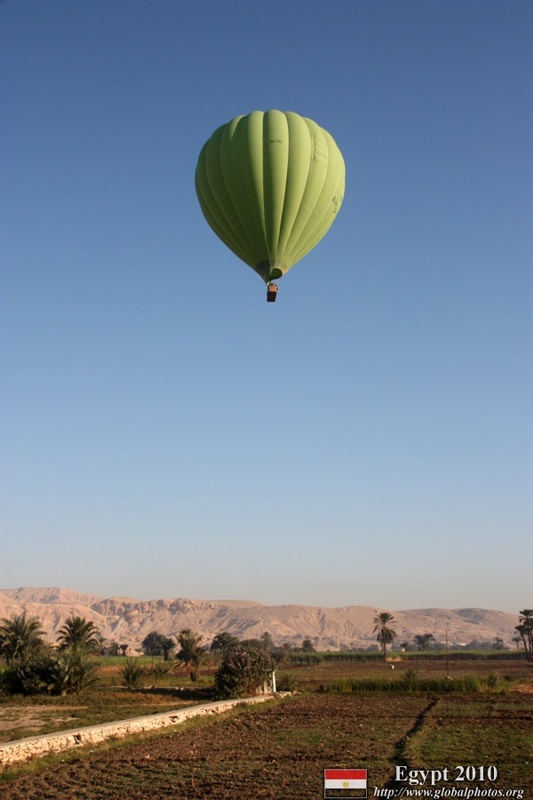 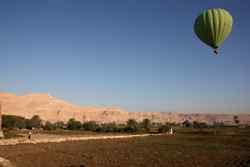 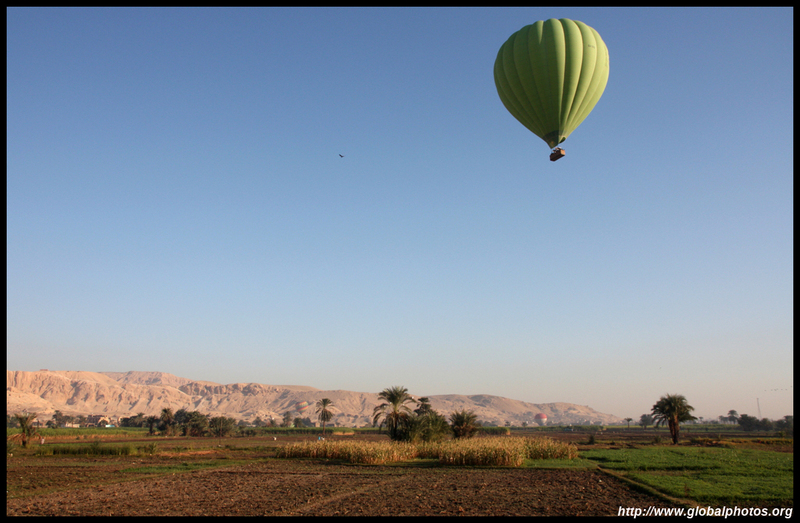 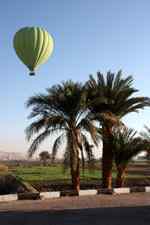 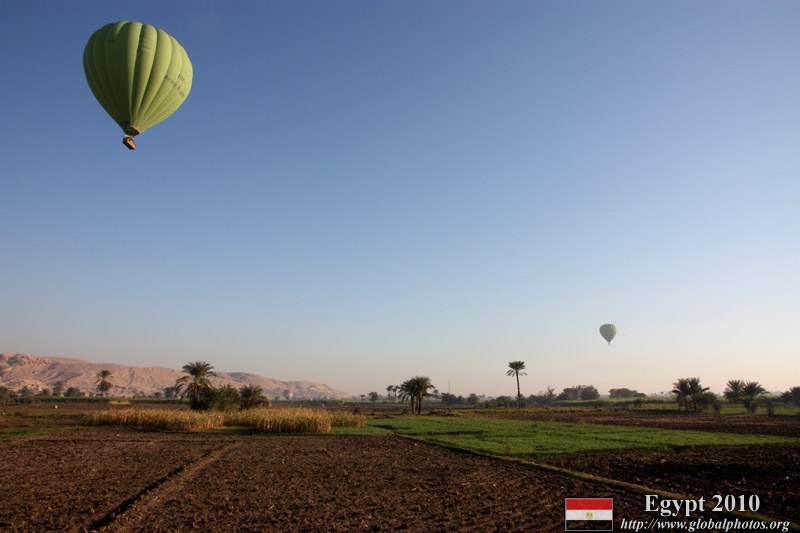 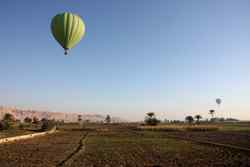 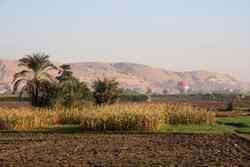 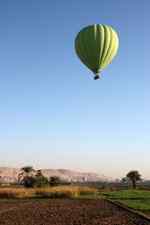 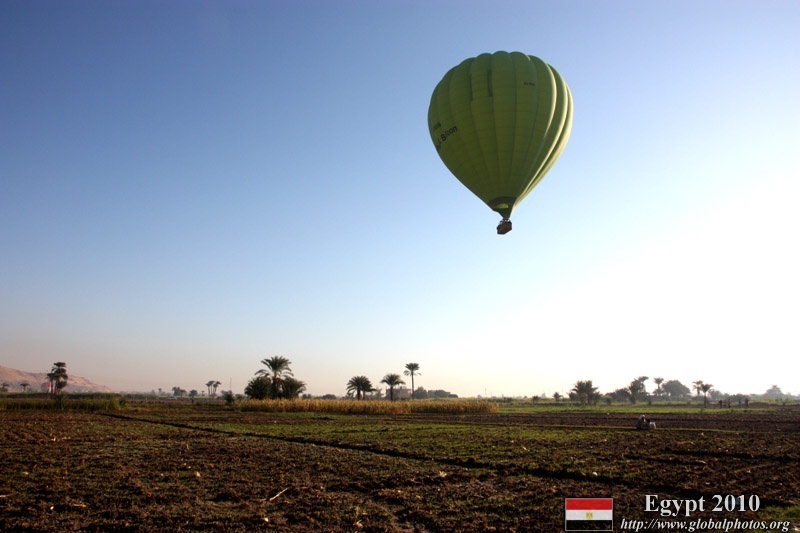 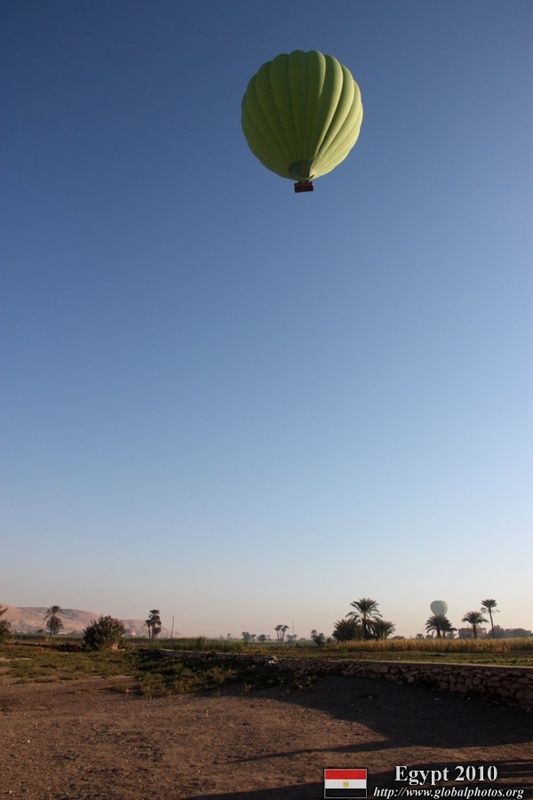 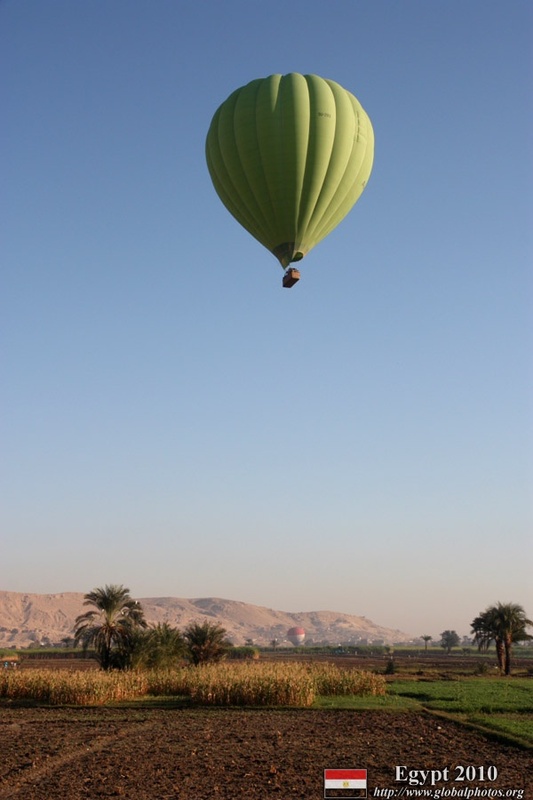 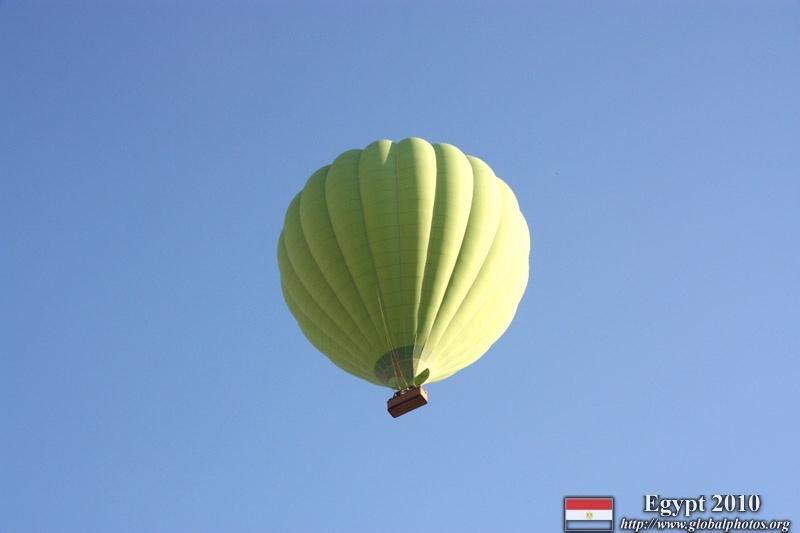 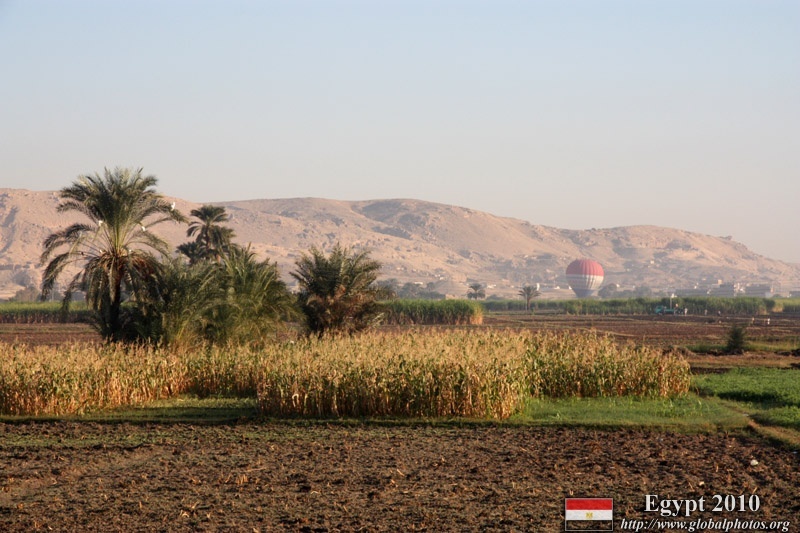 It was amazing to watch the various hot air balloons descend and land in the fields along the West Bank. 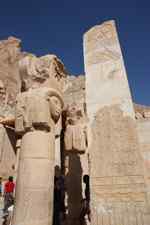 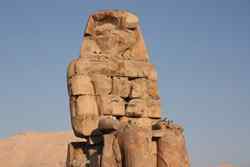 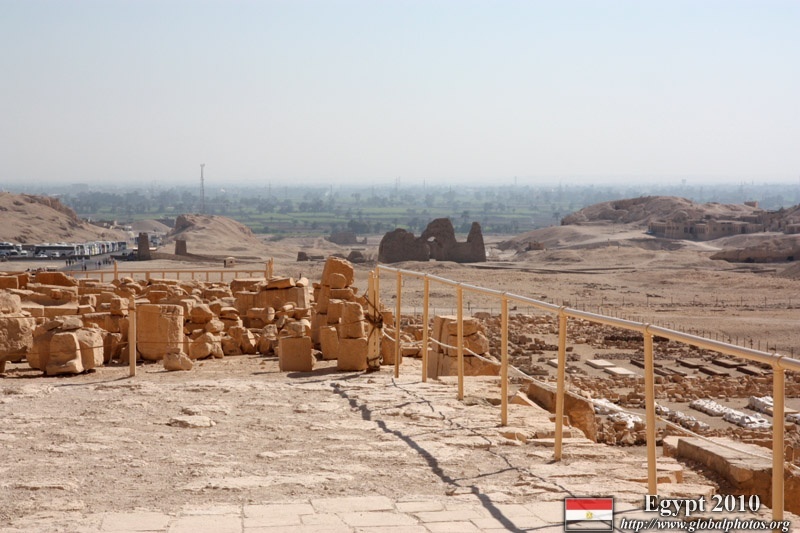 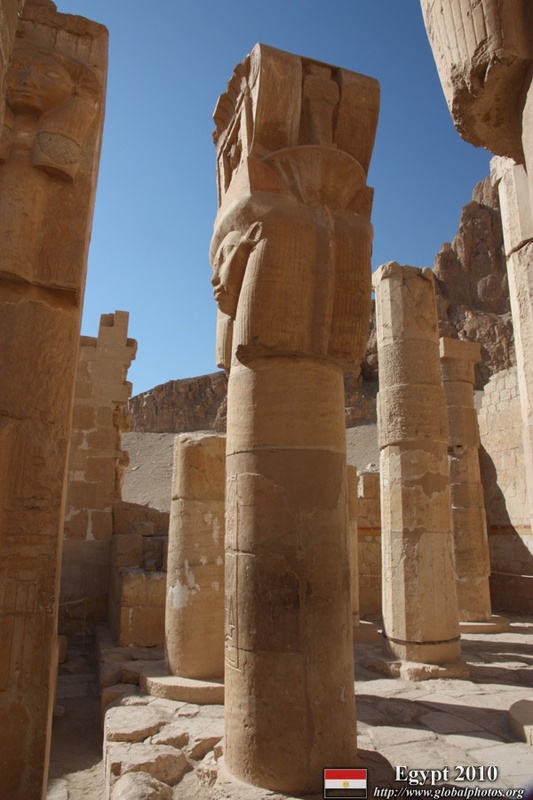 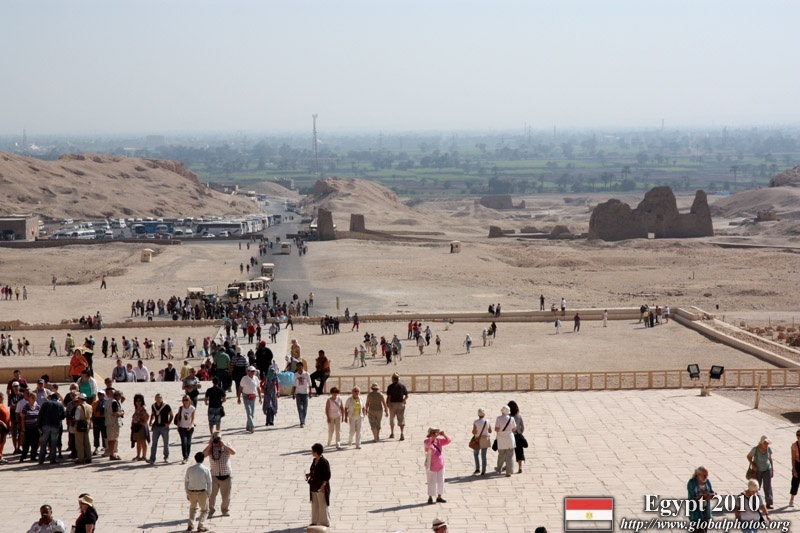 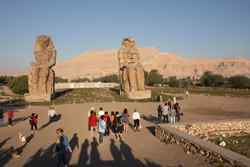 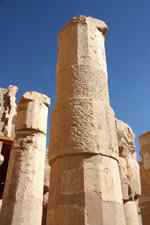 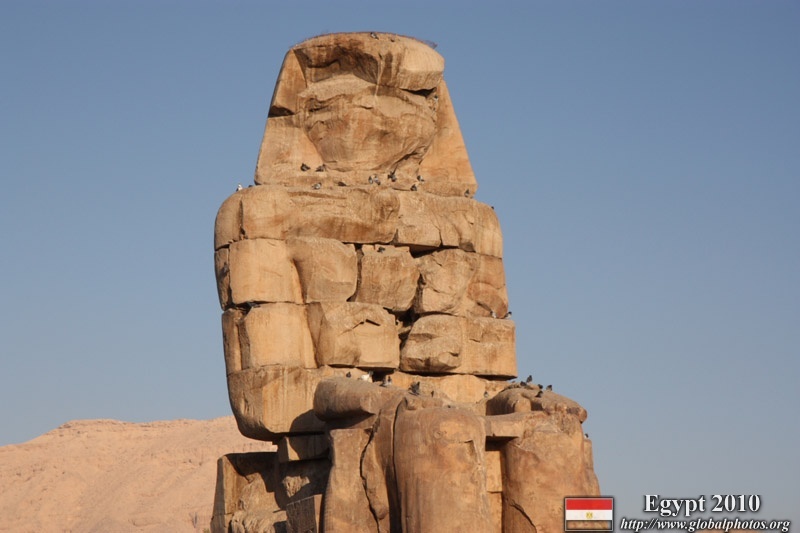 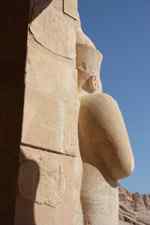 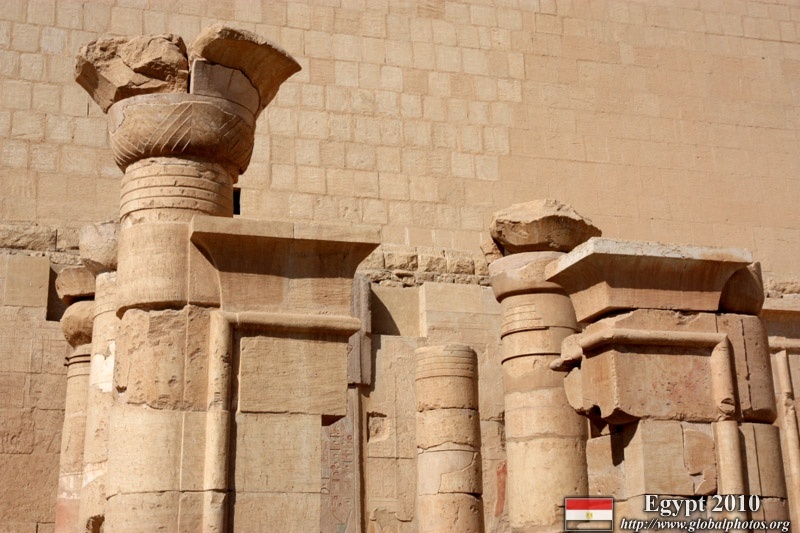 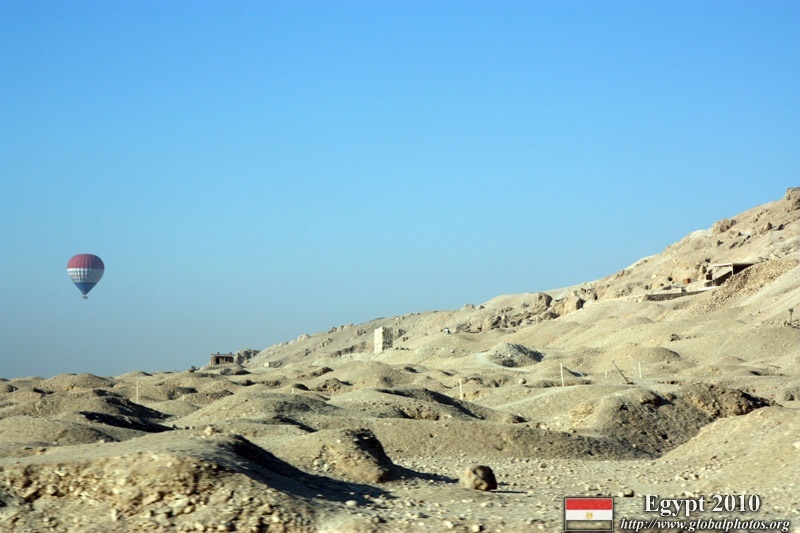 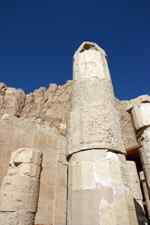 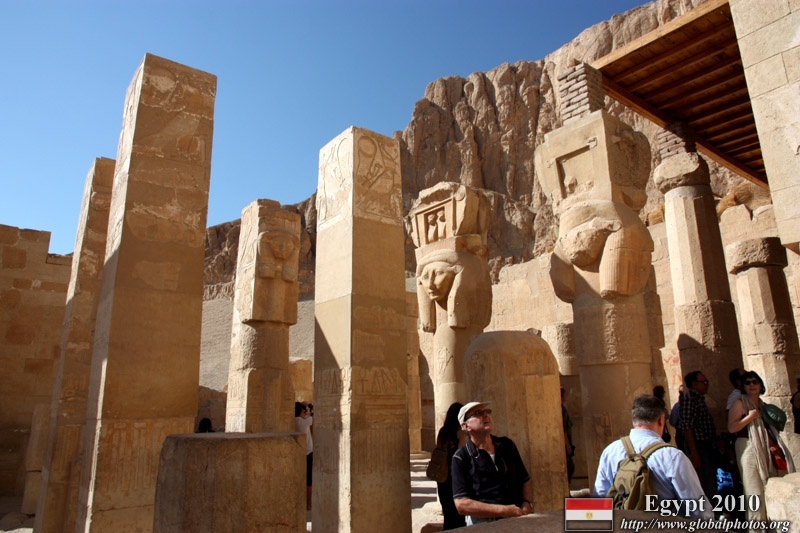 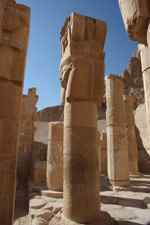 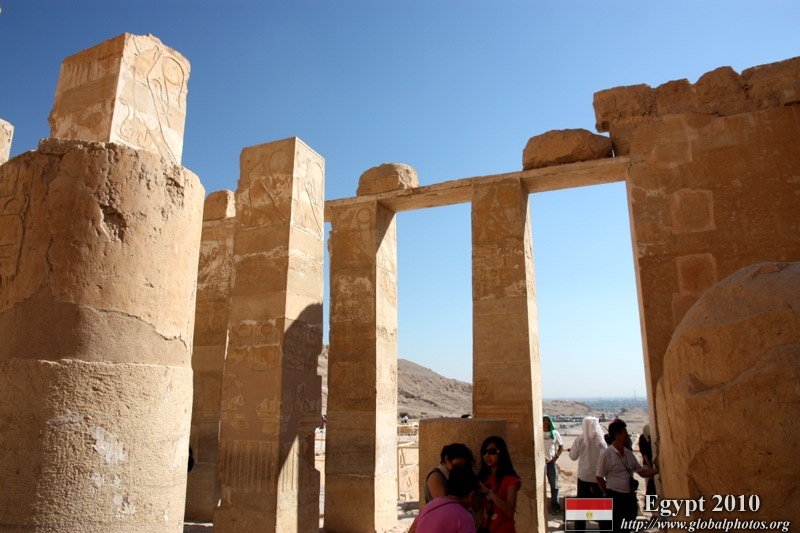 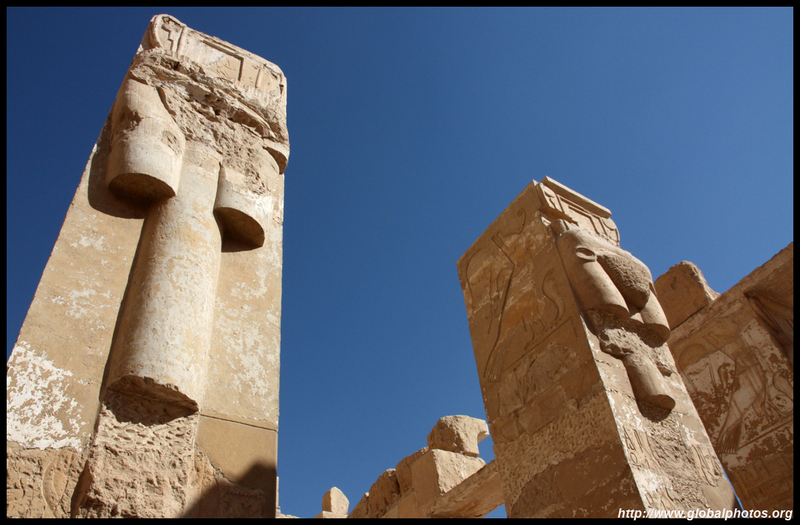 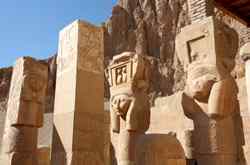 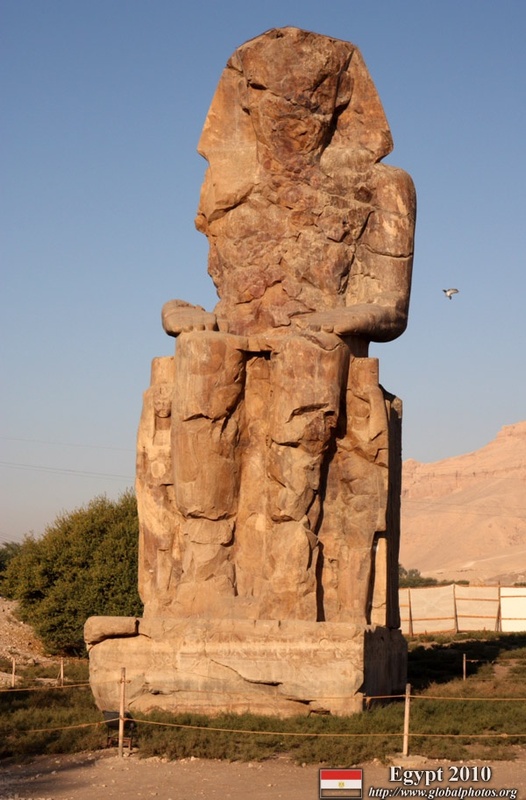 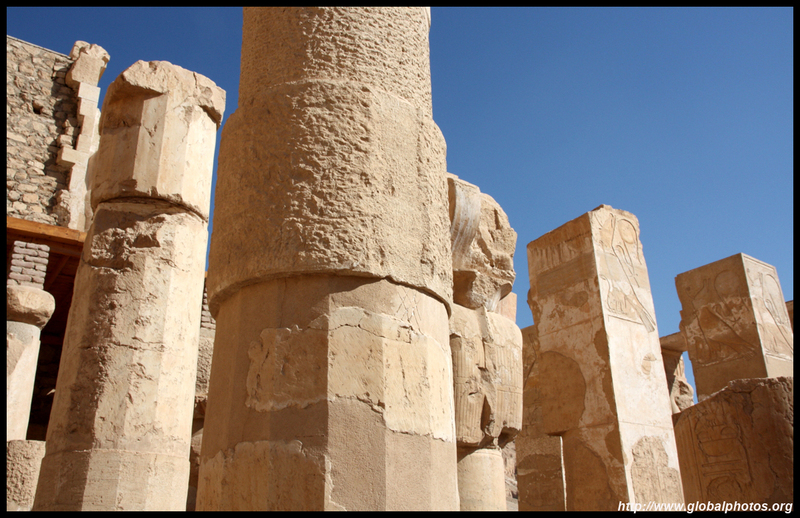 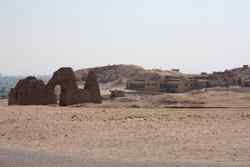 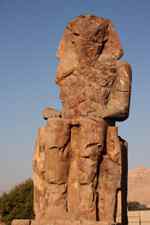 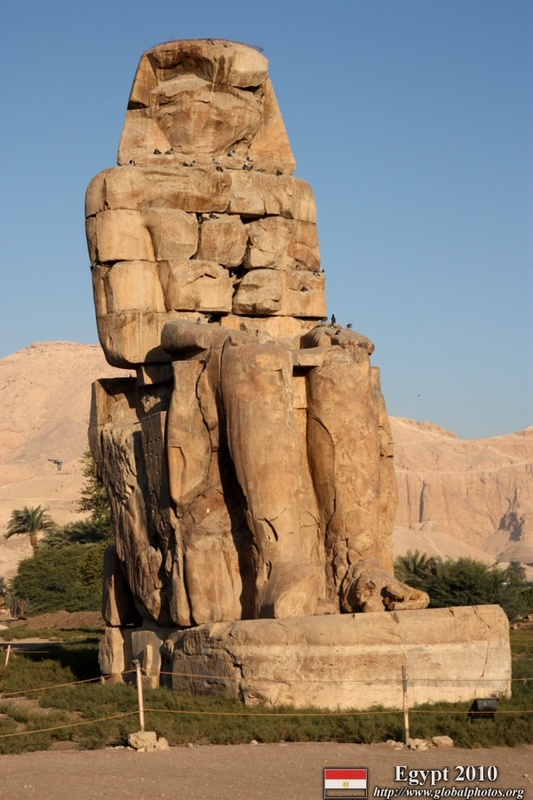 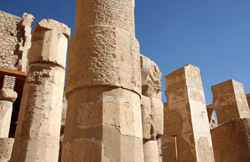 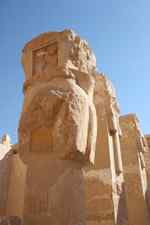 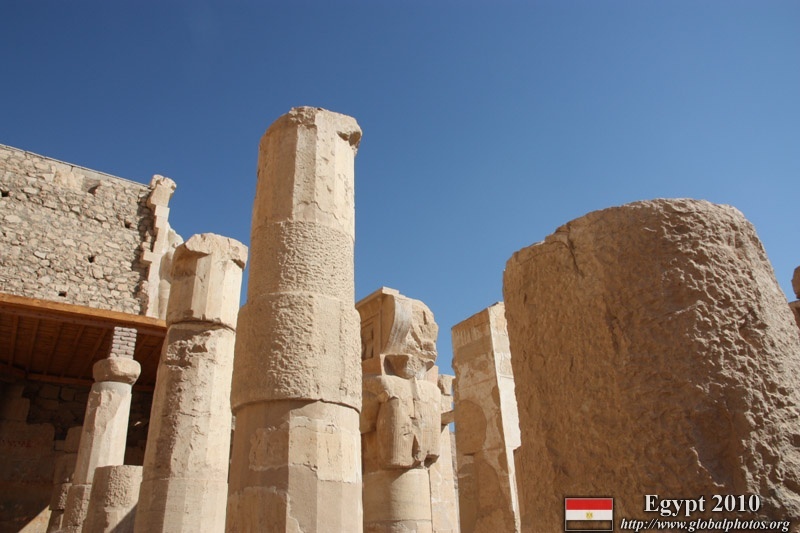 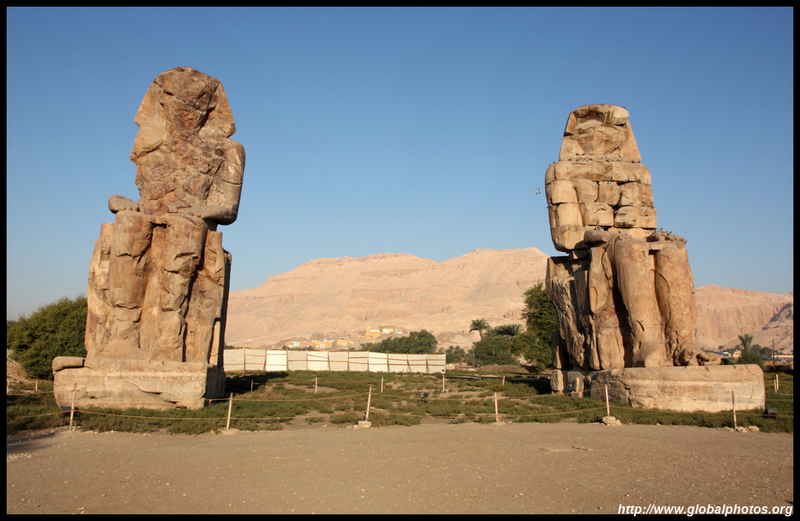 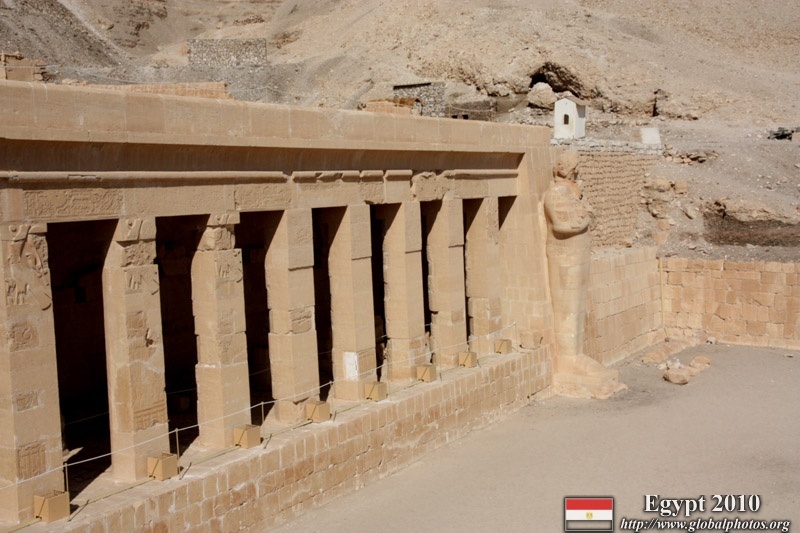 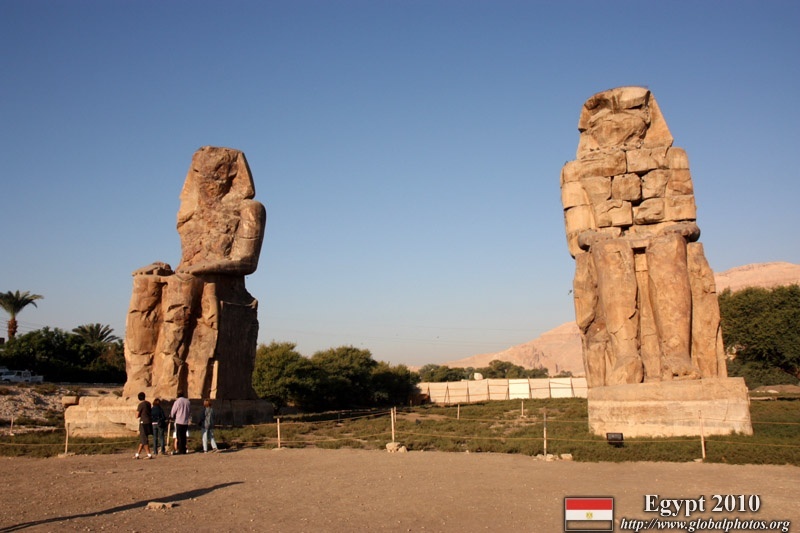 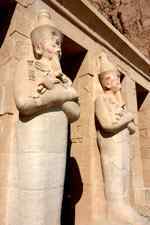 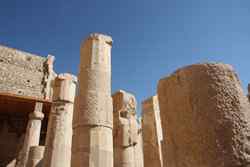 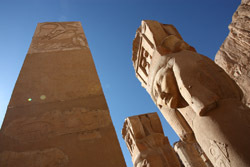 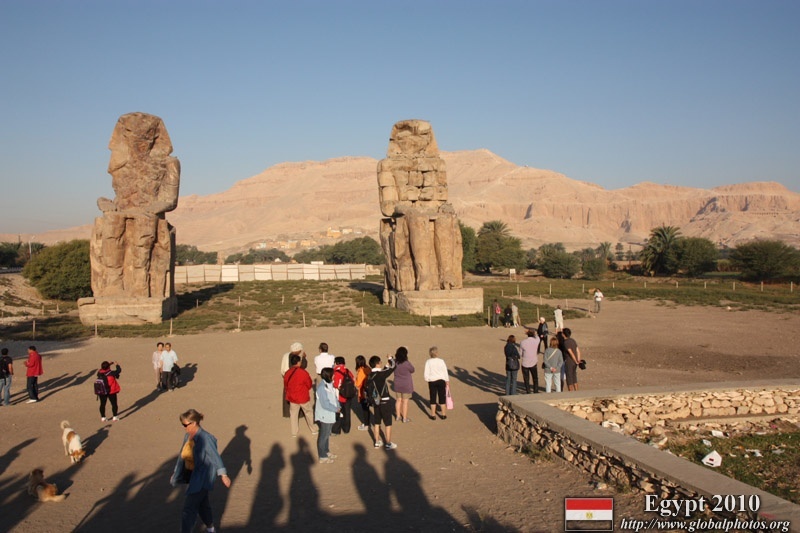 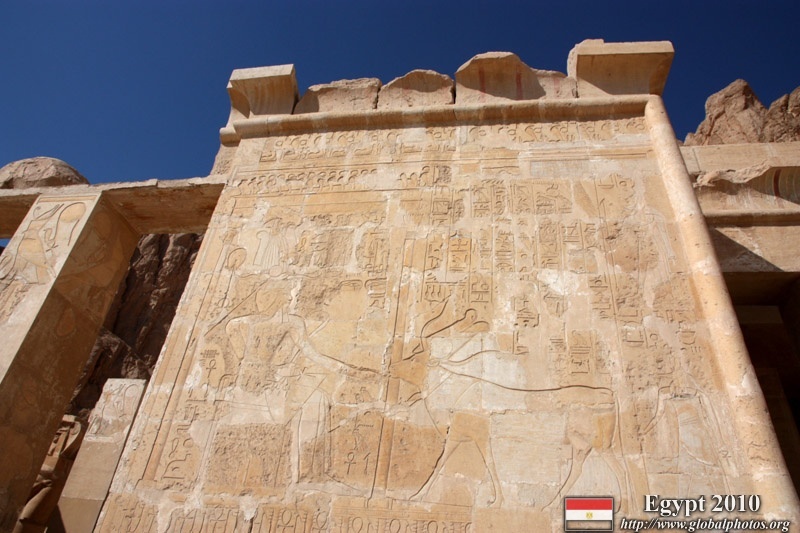 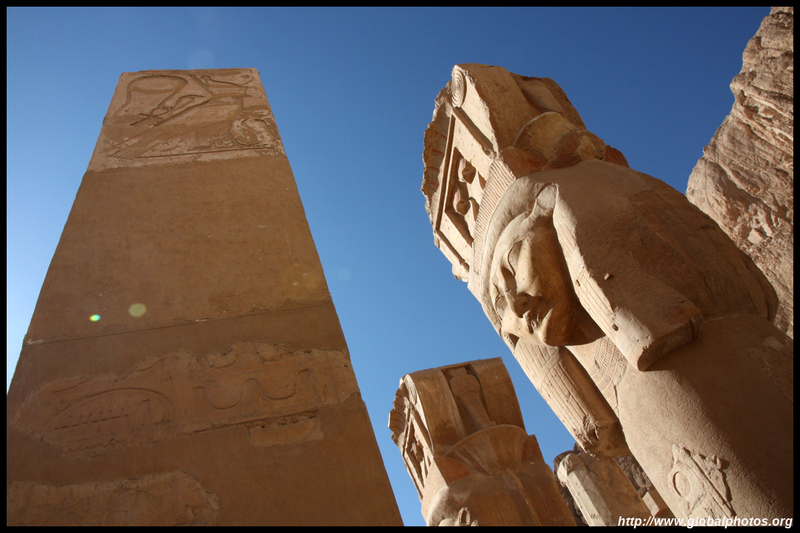 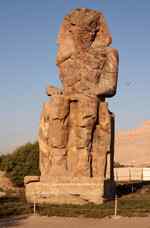 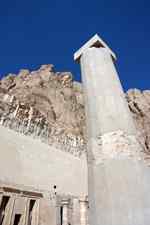 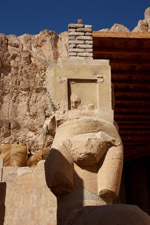 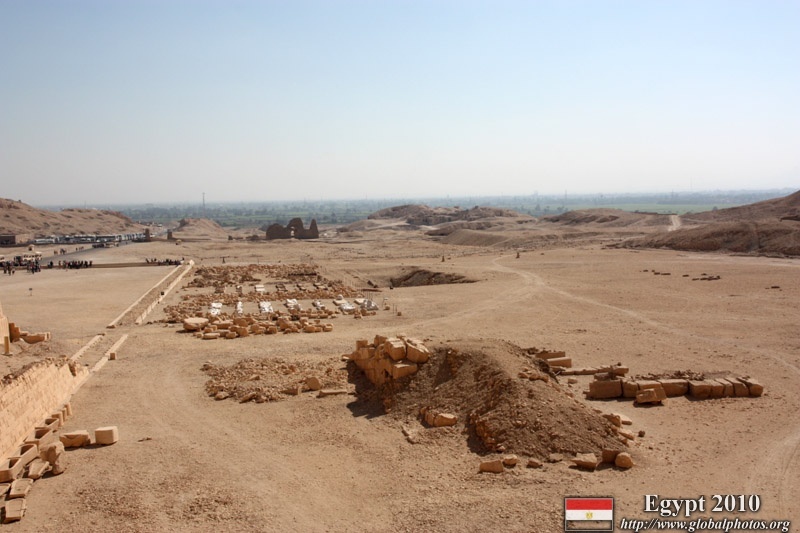 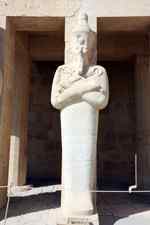 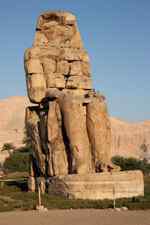 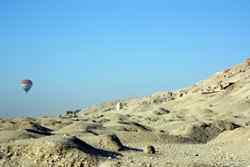 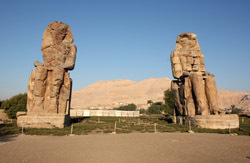 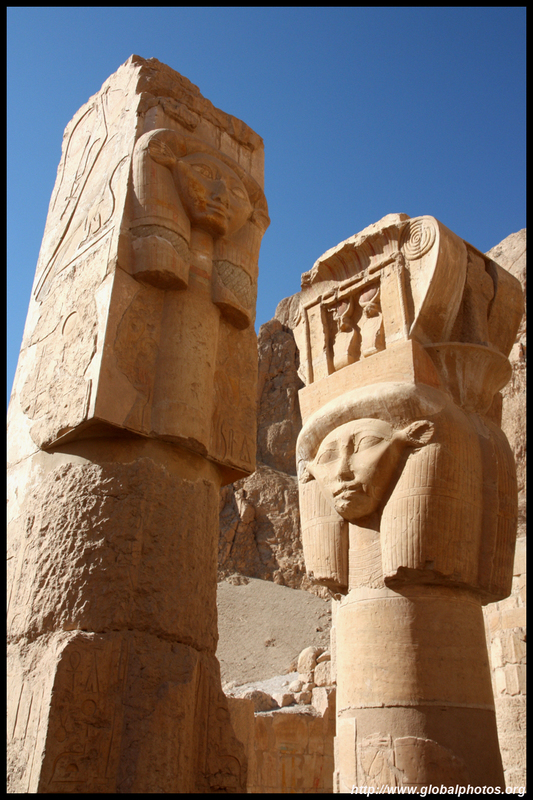 Two statues are all that remain at the Colossi of Memnon. 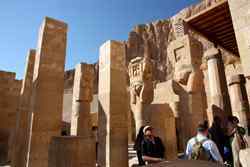 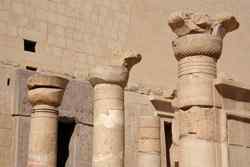 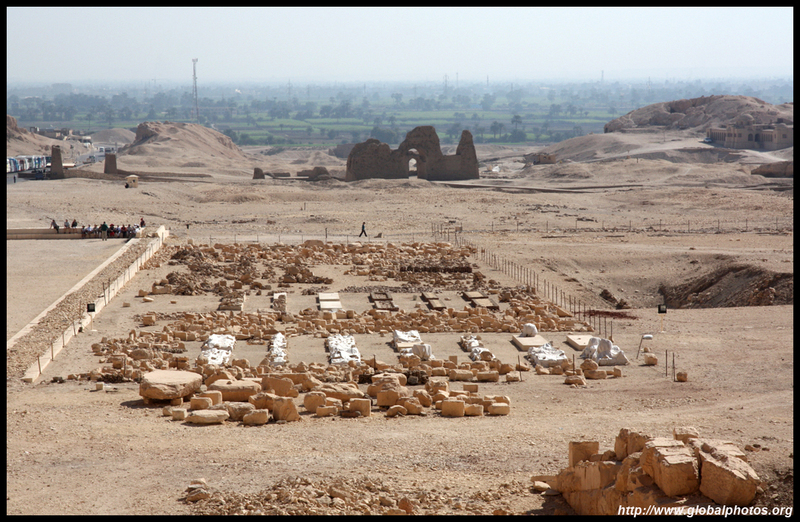 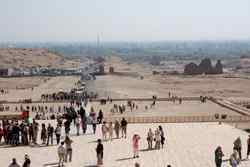 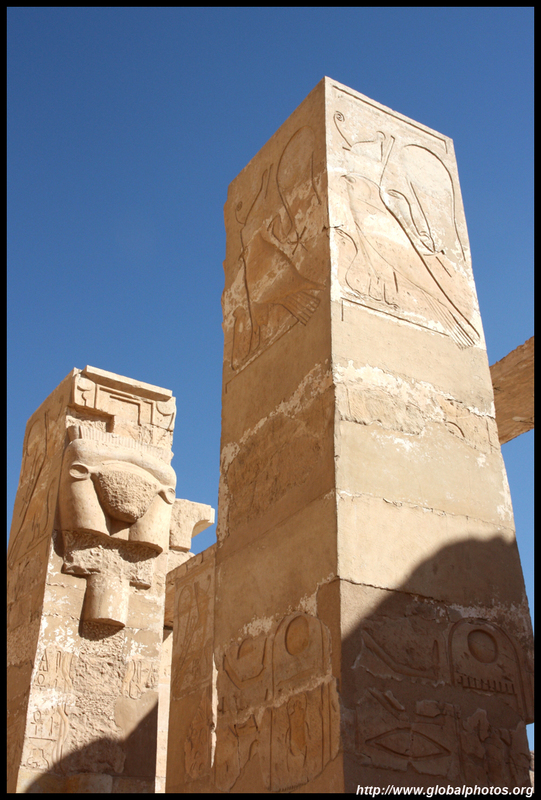 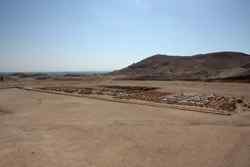 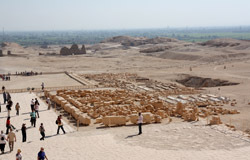 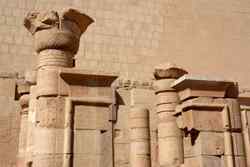 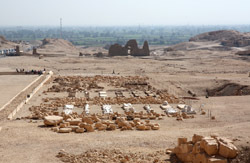 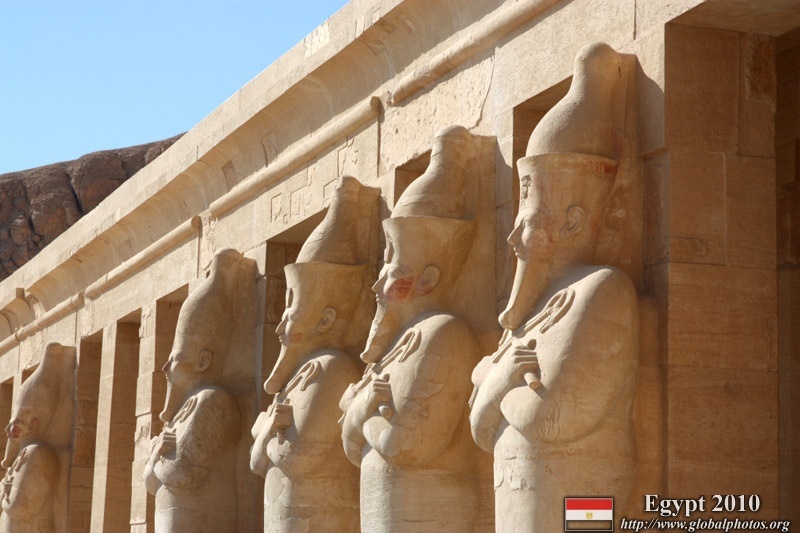 Archaeologists believed the site would have been bigger than the impressive Karnak Temple, but nevertheless, the statues were big and impressive. 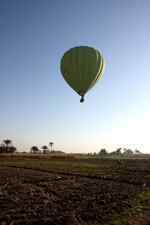 I didn't hear the wailing noise in the morning dew though. 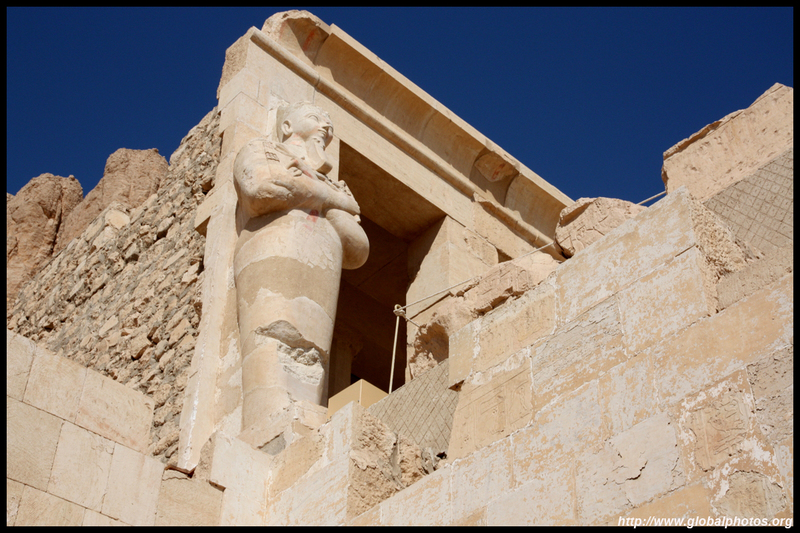 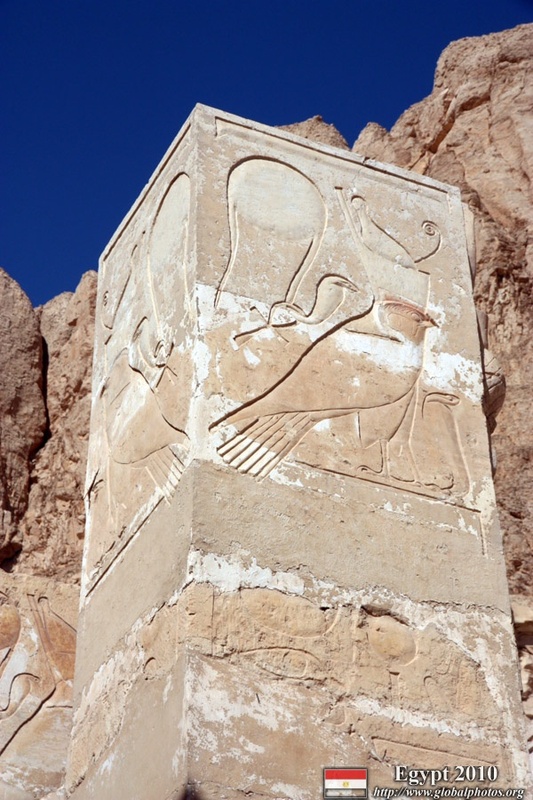 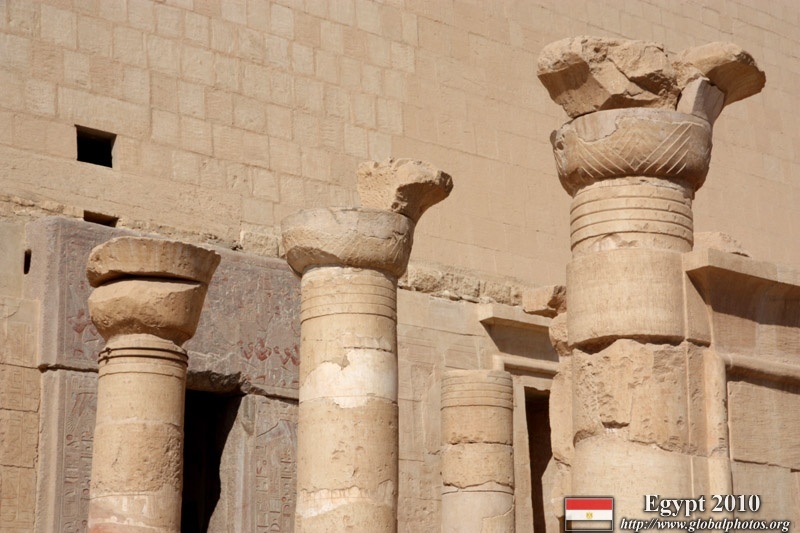 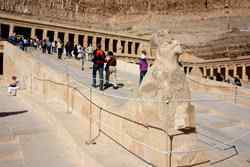 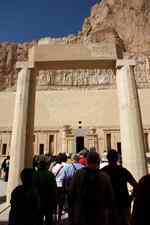 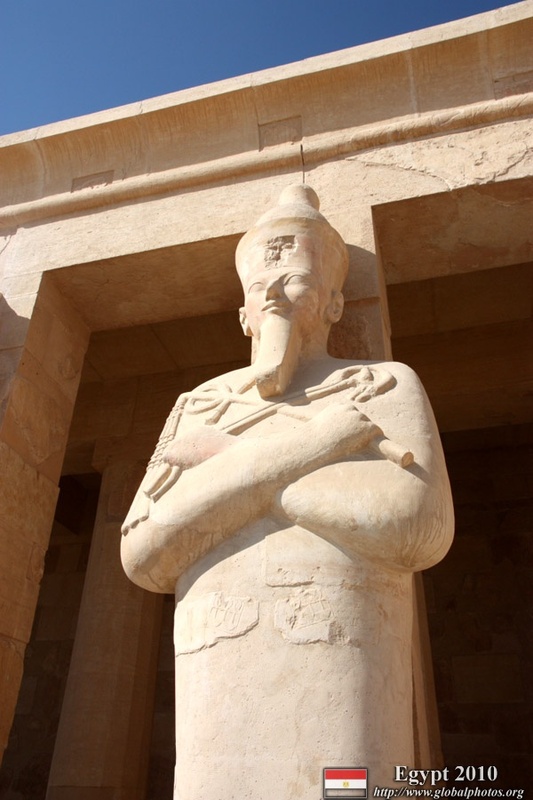 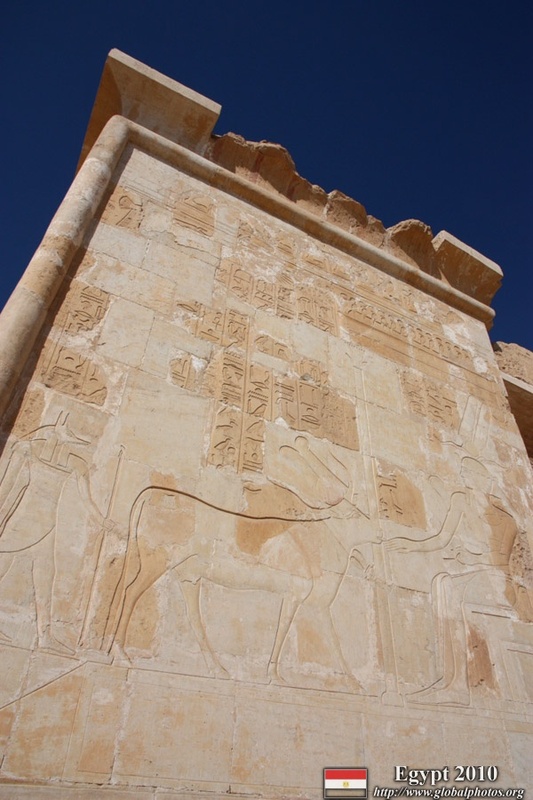 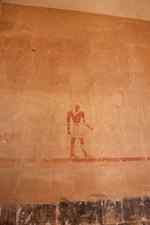 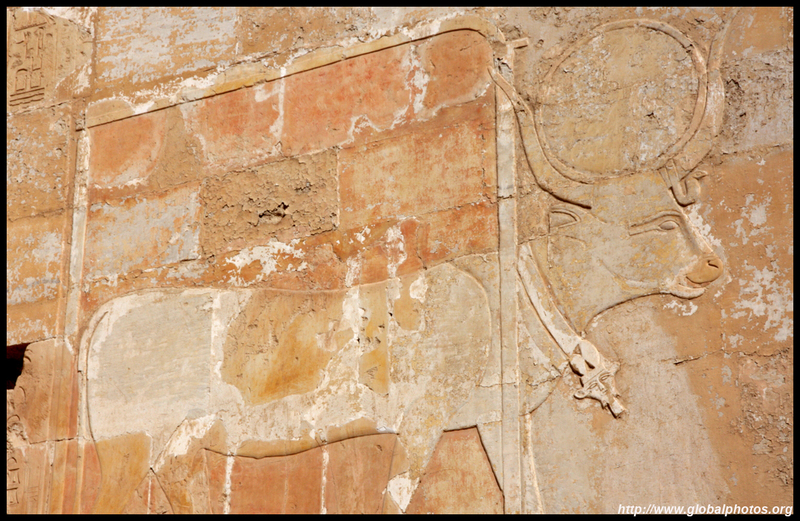 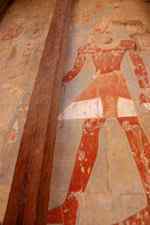 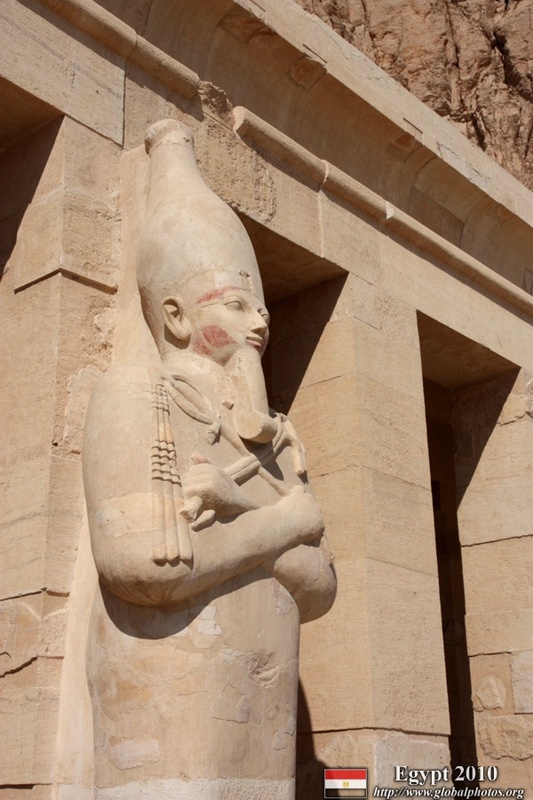 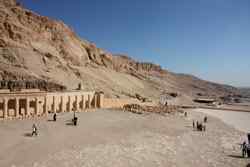 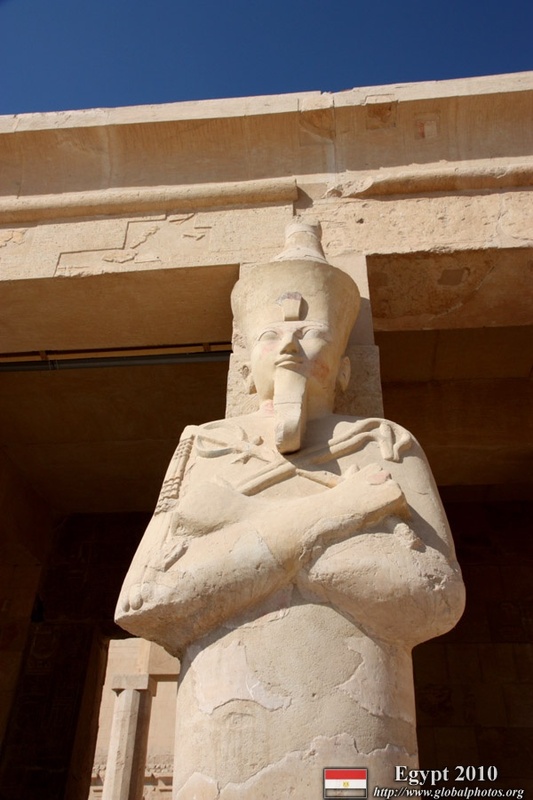 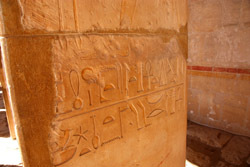 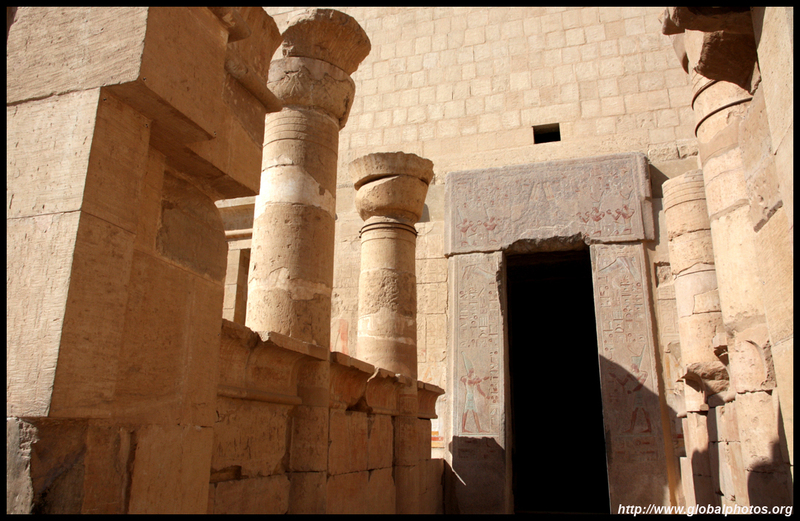 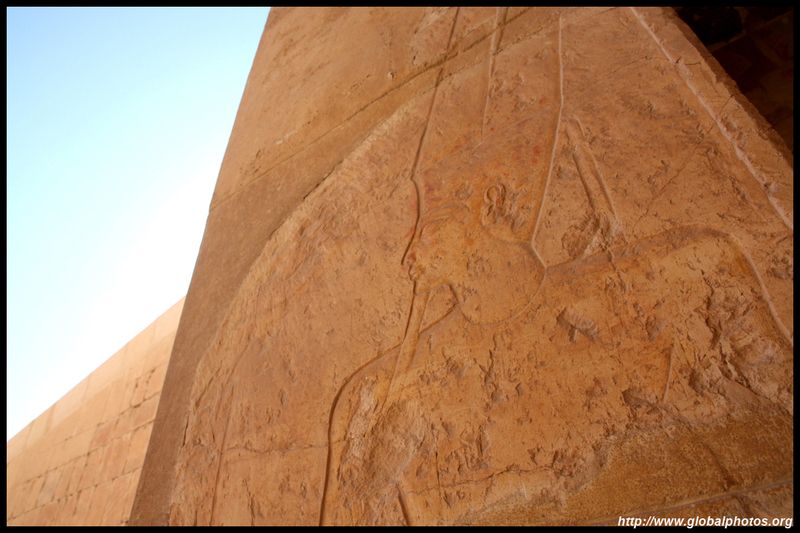 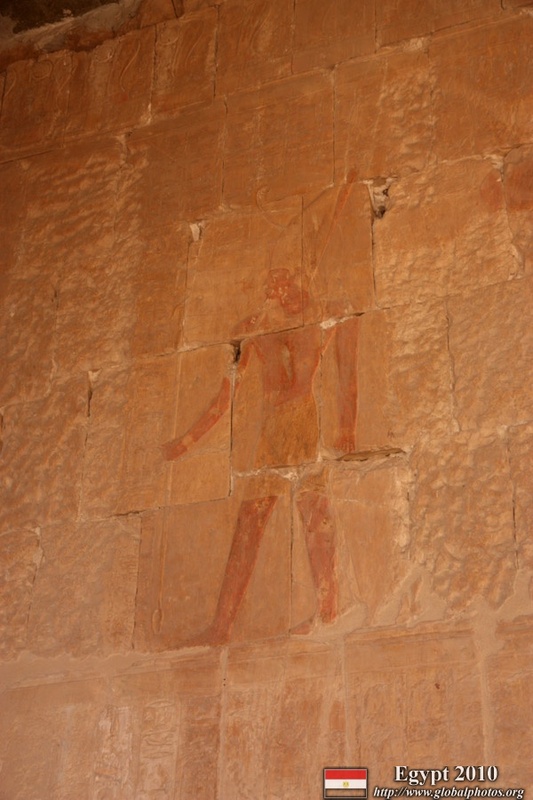 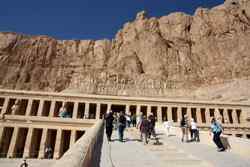 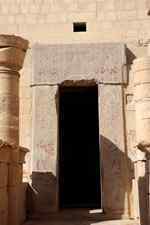 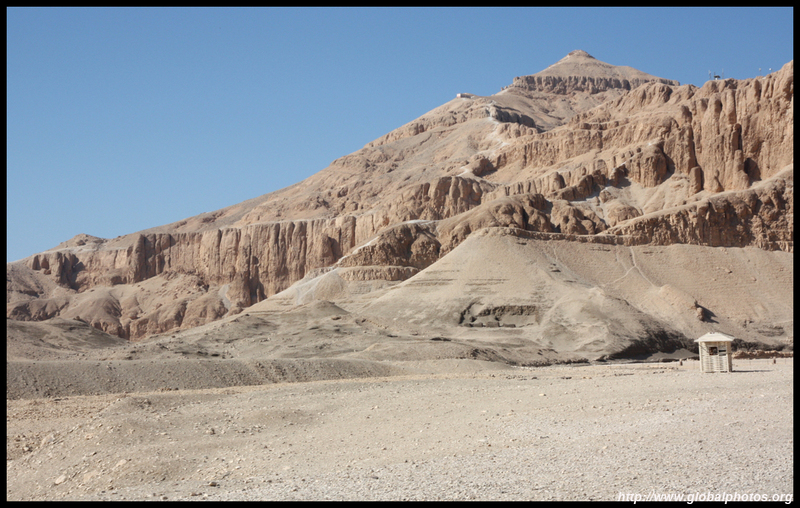 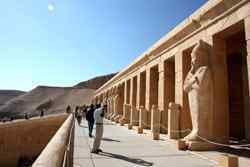 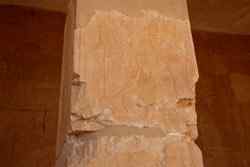 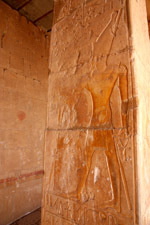 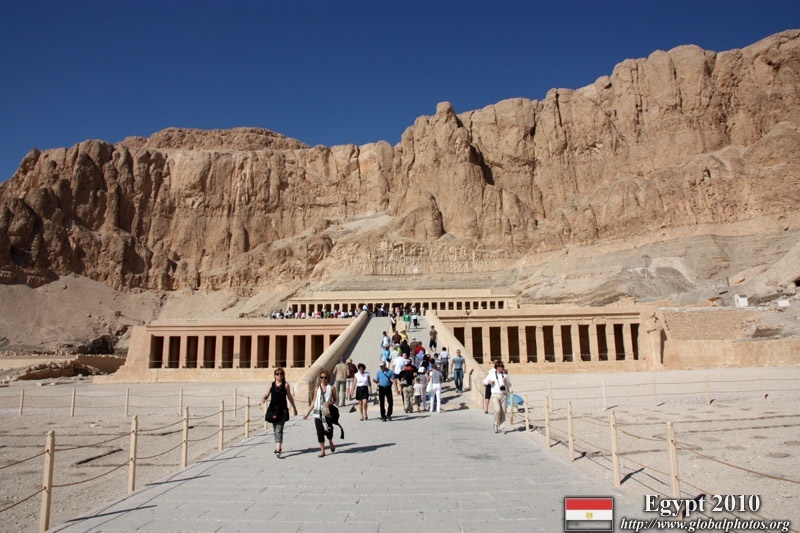 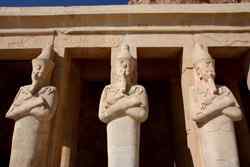 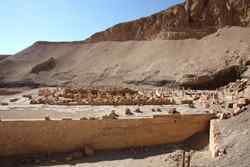 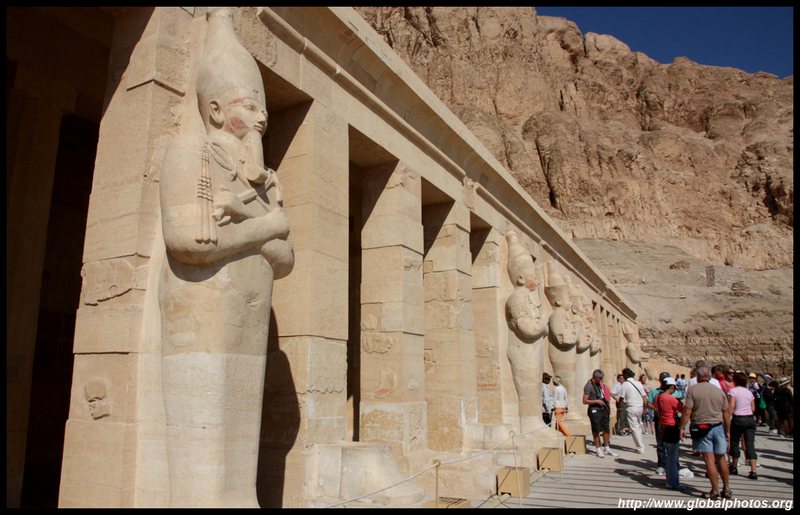 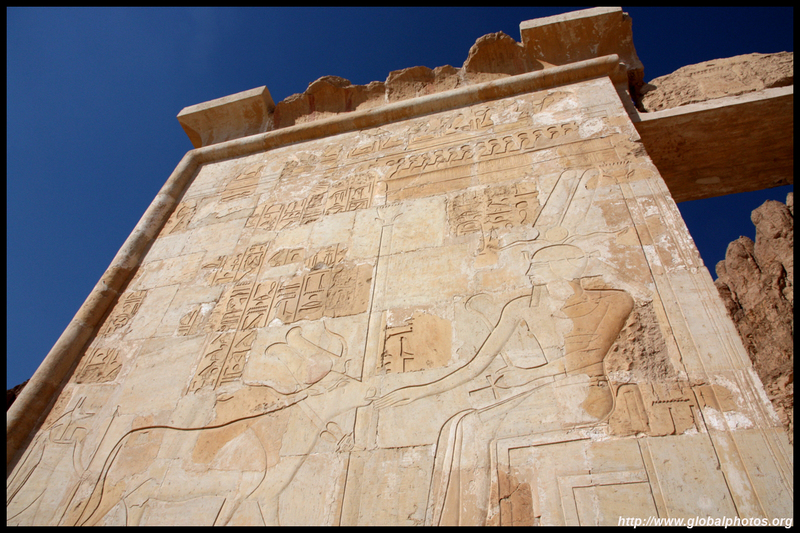 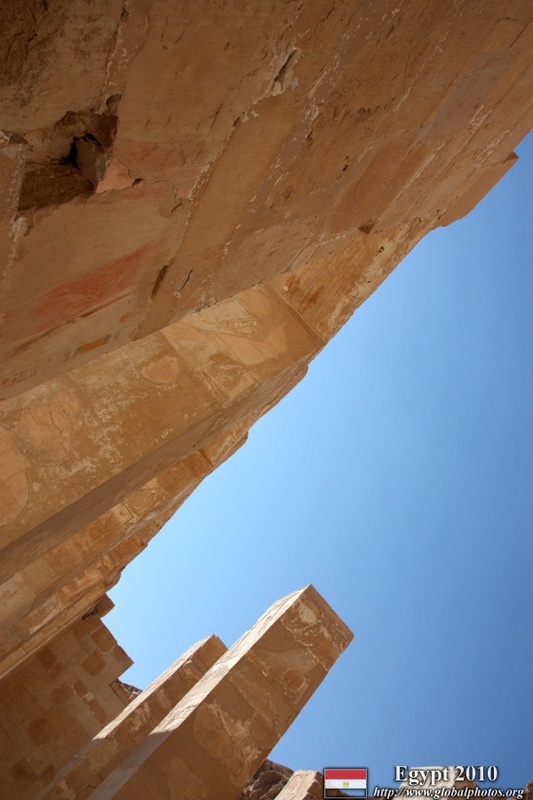 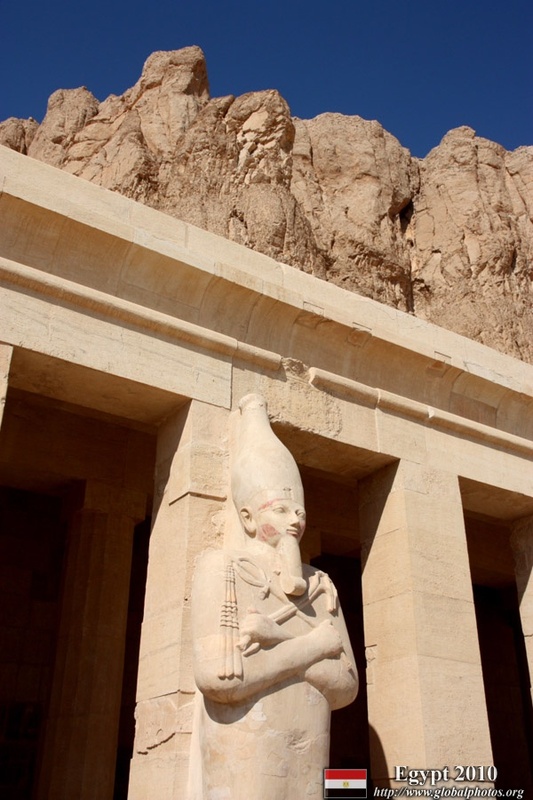 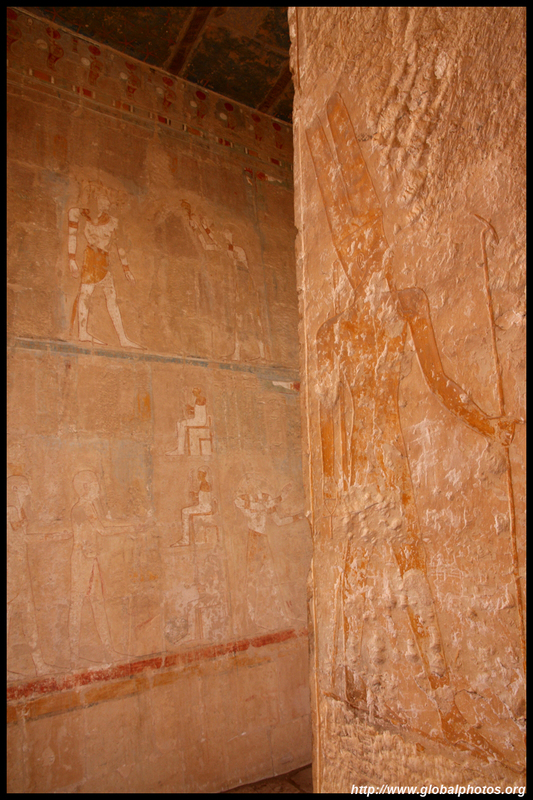 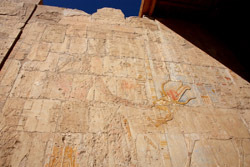 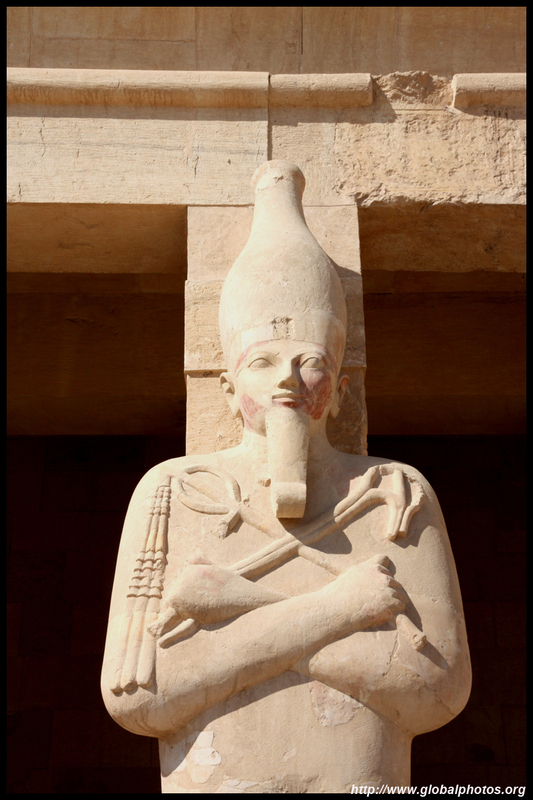 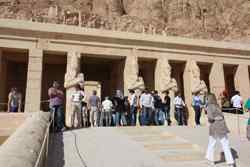 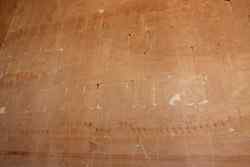 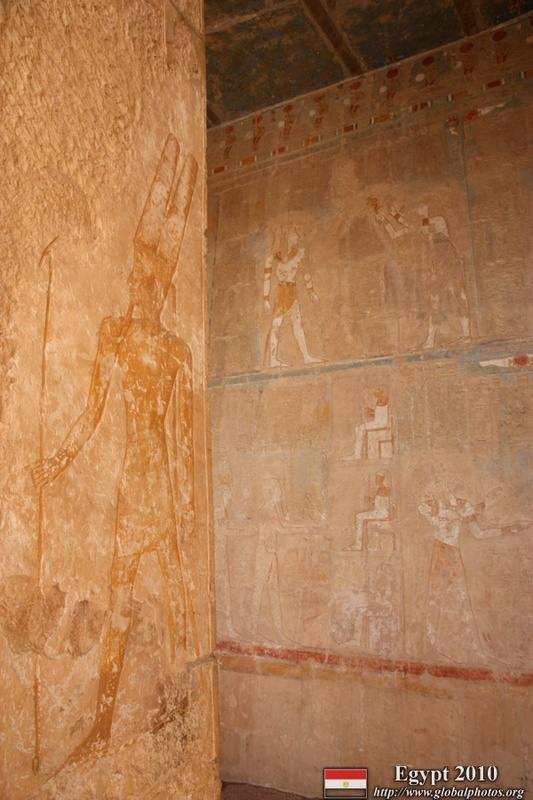 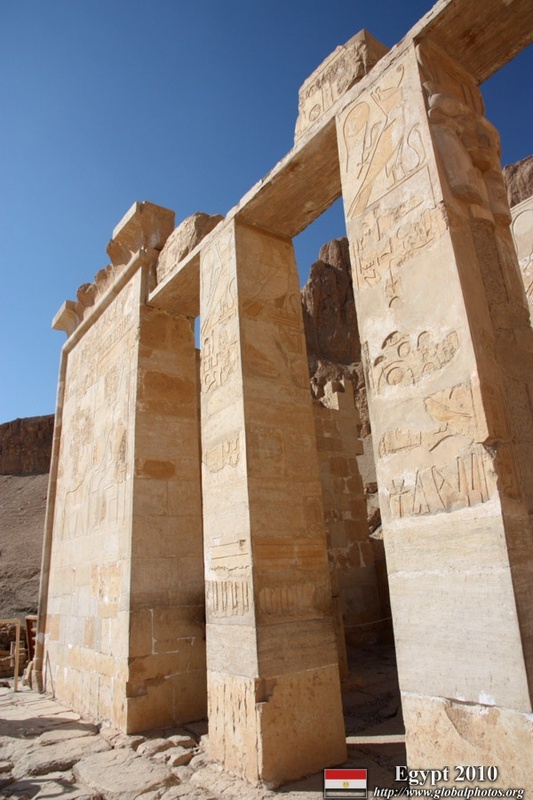 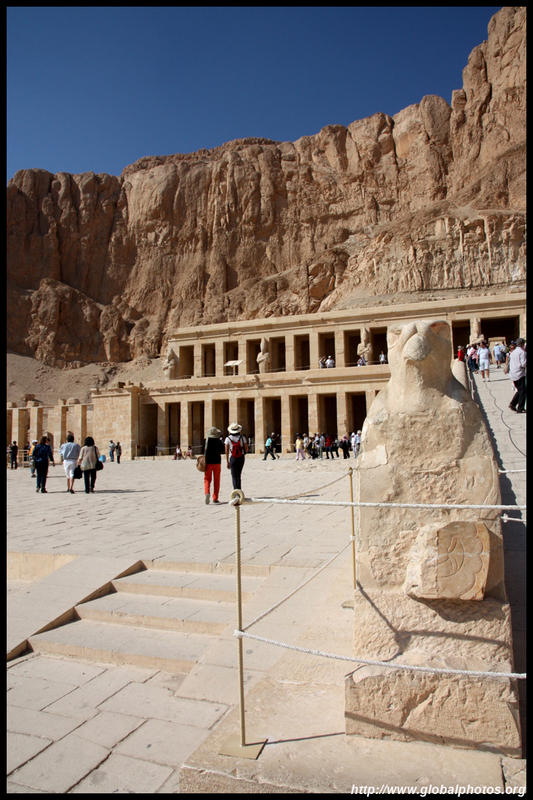 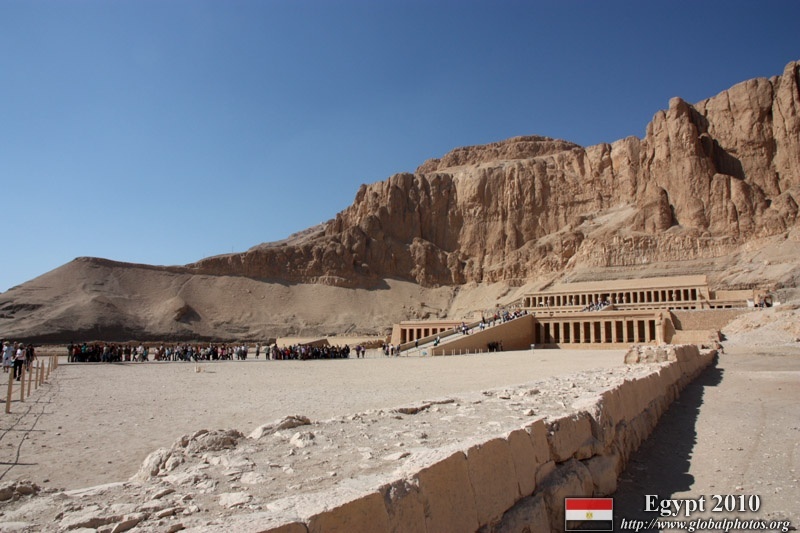 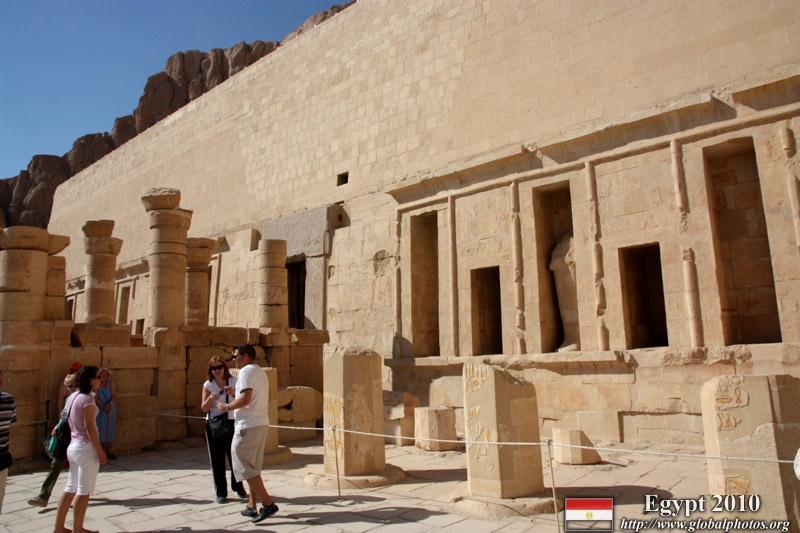 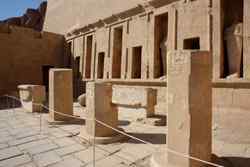 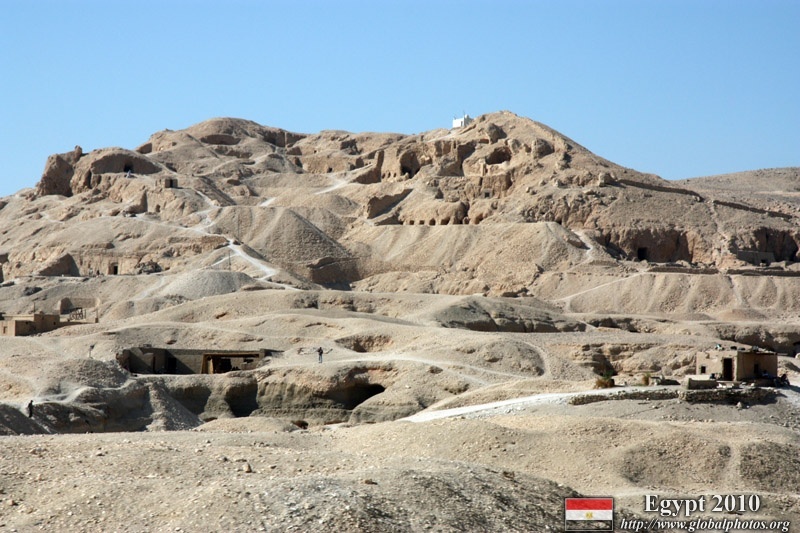 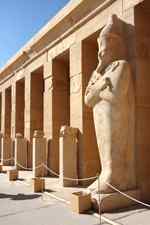 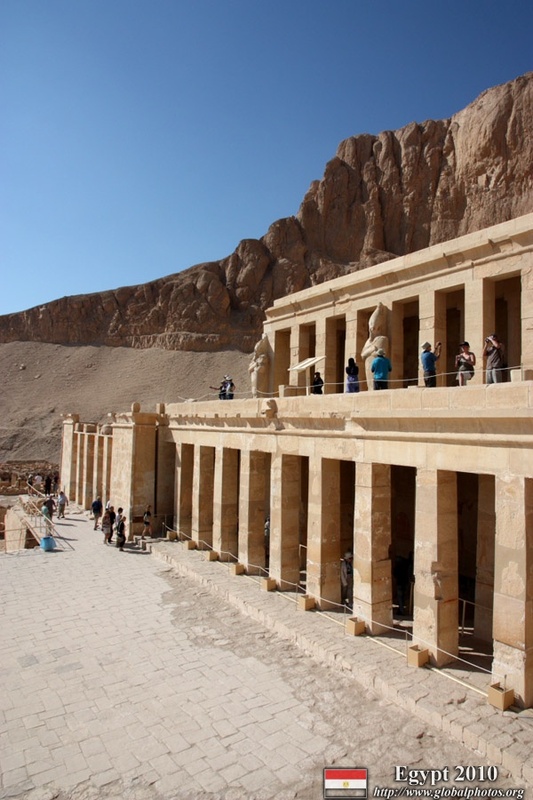 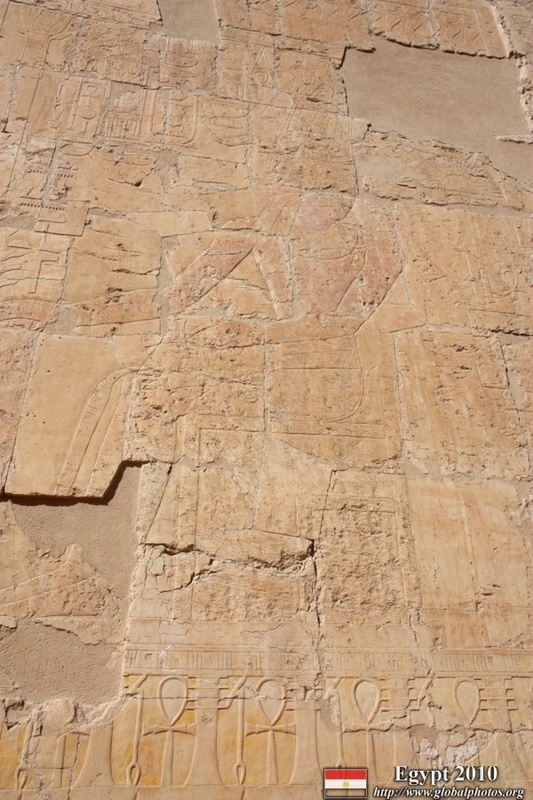 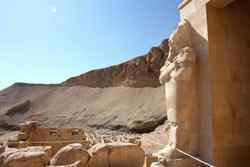 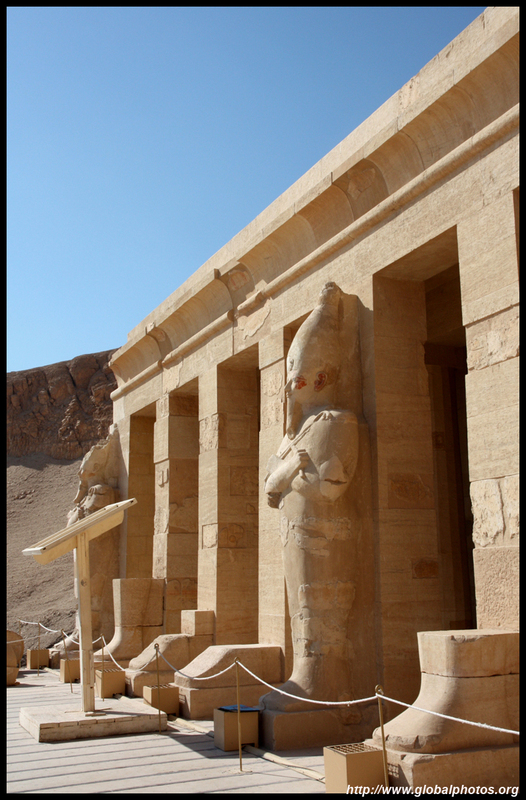 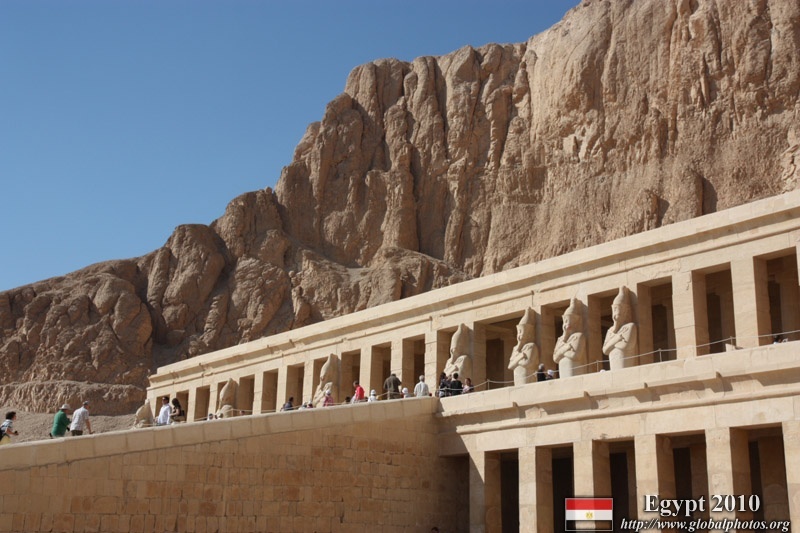 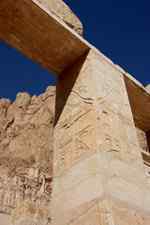 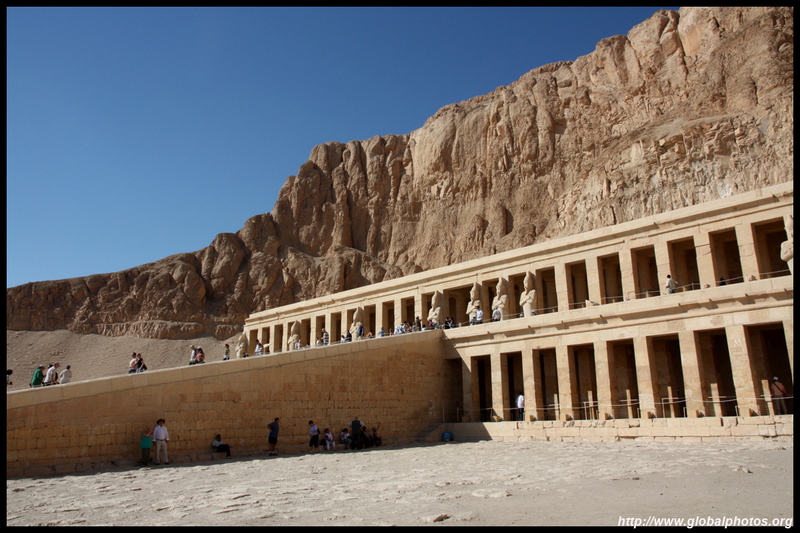 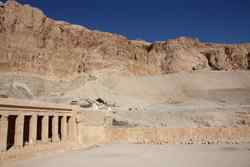 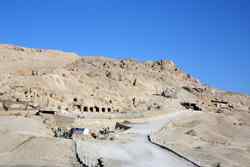 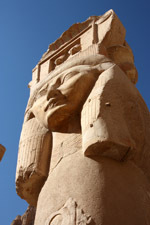 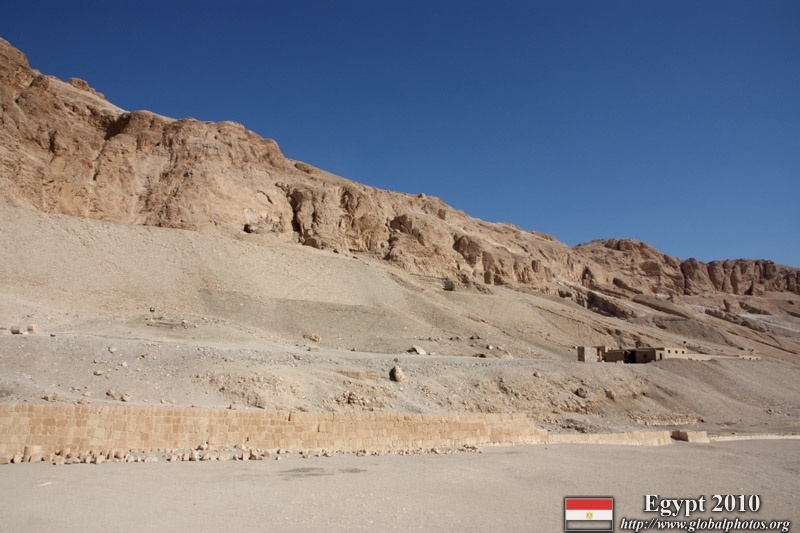 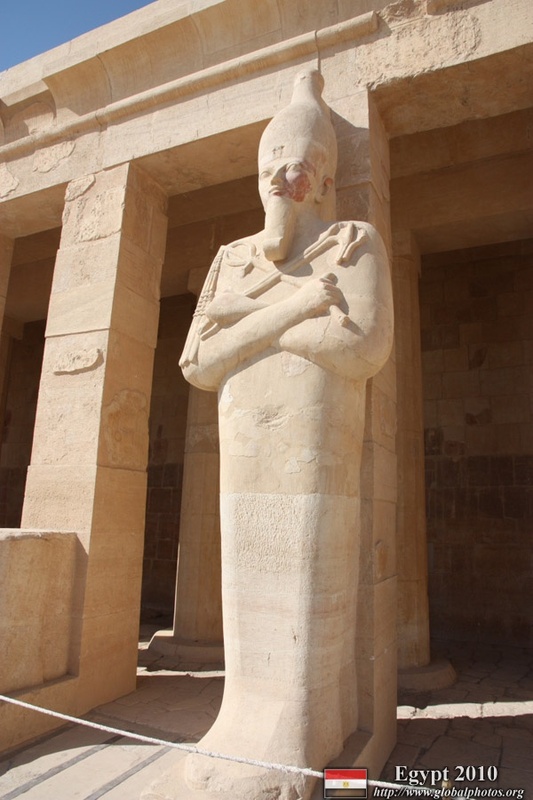 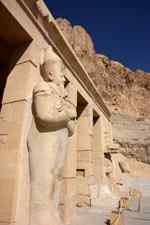 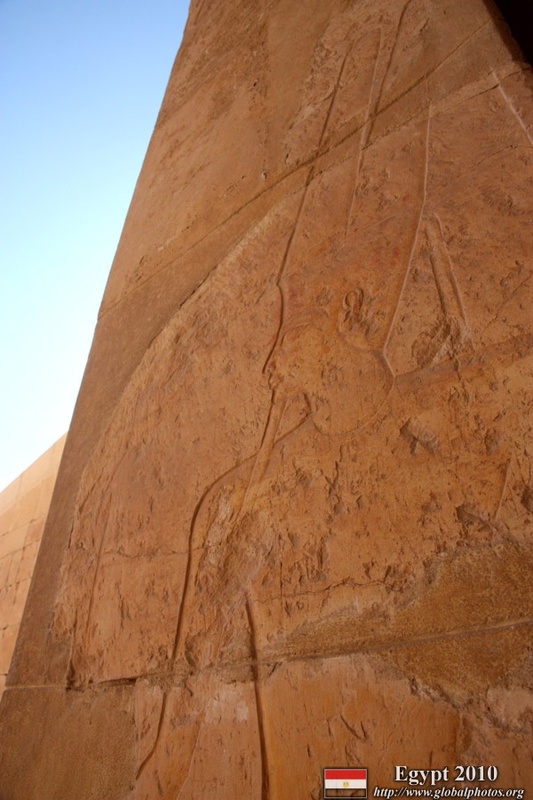 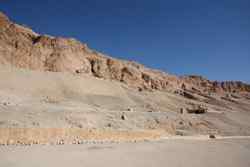 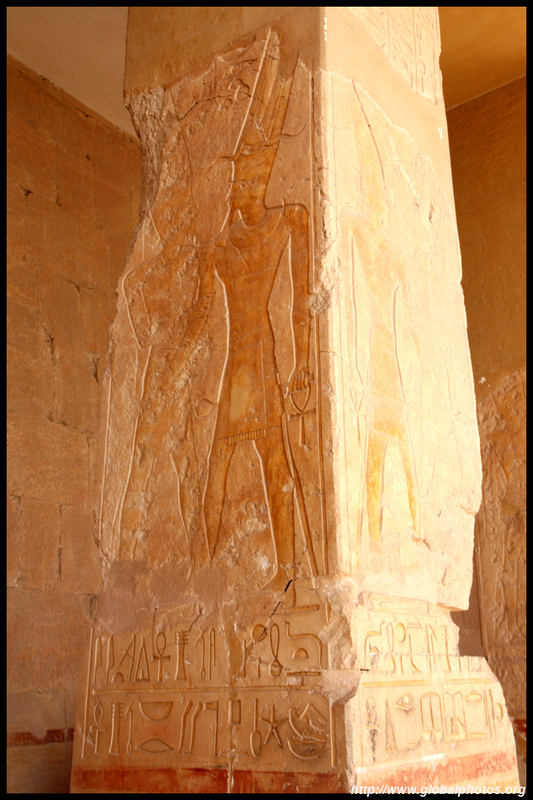 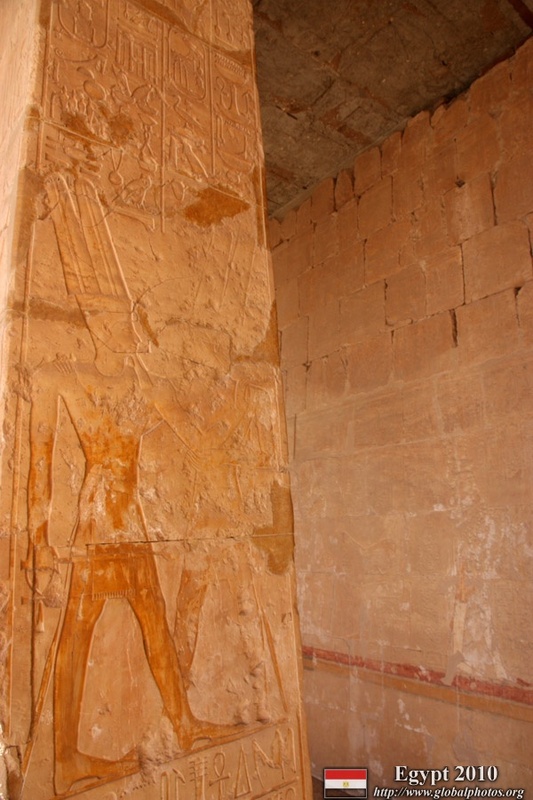 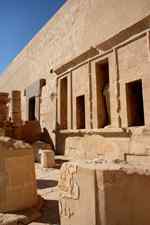 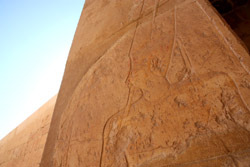 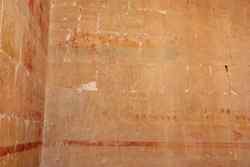 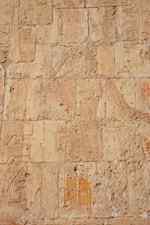 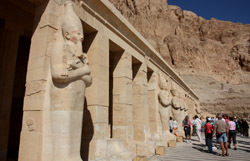 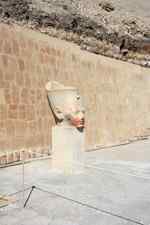 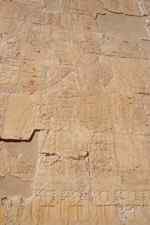 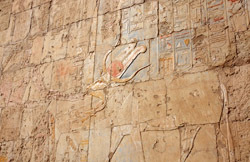 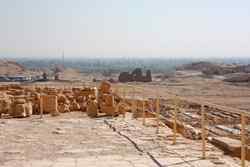 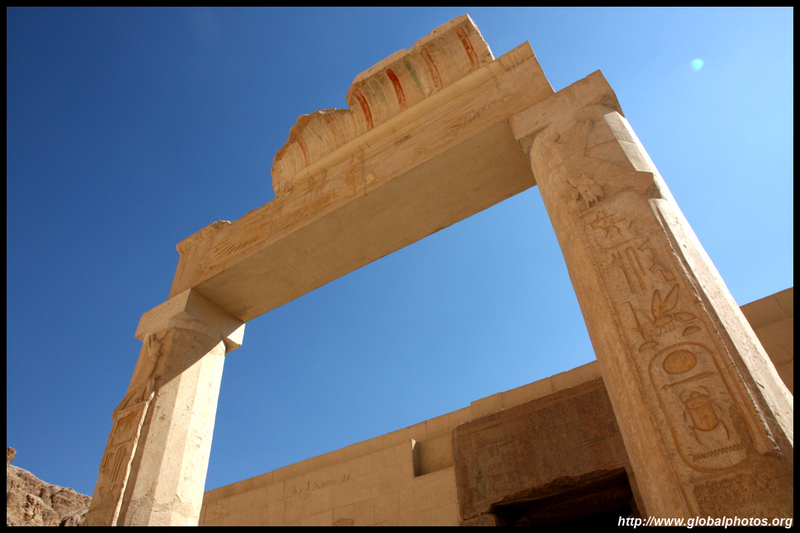 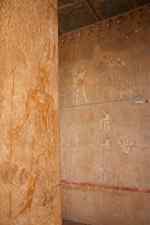 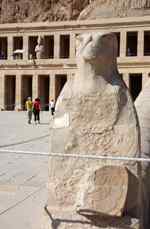 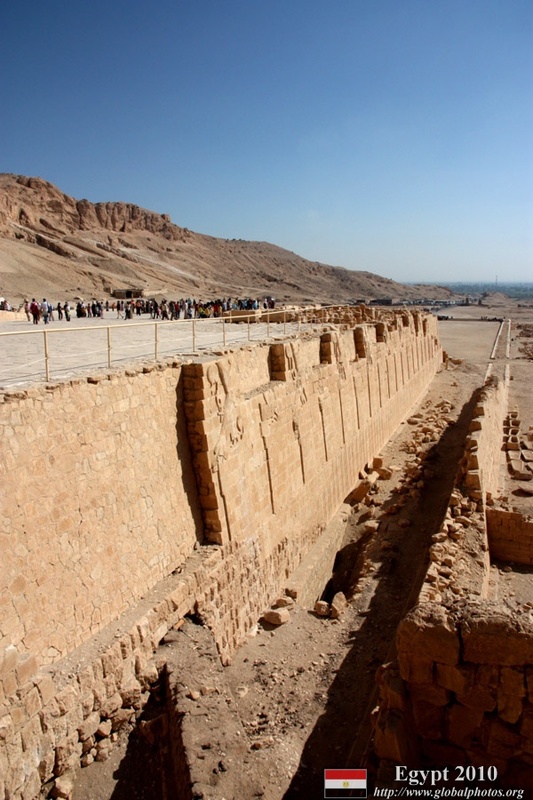 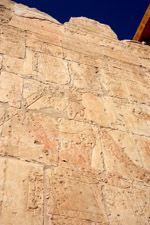 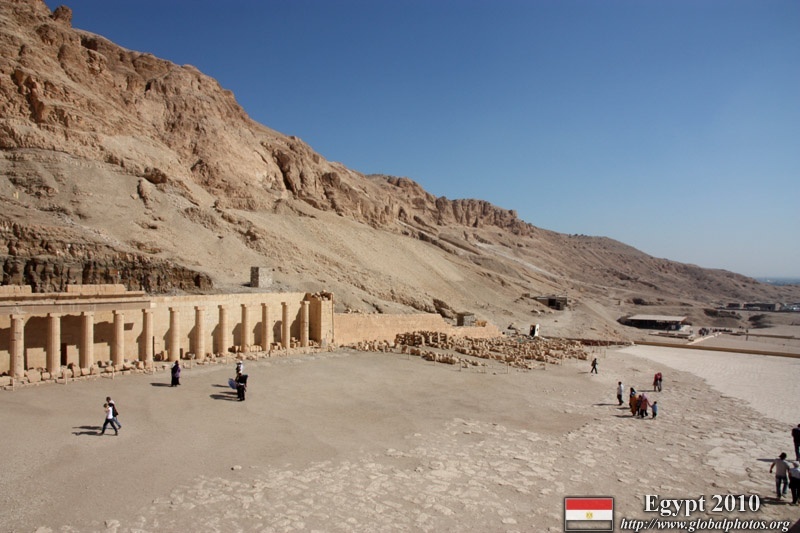 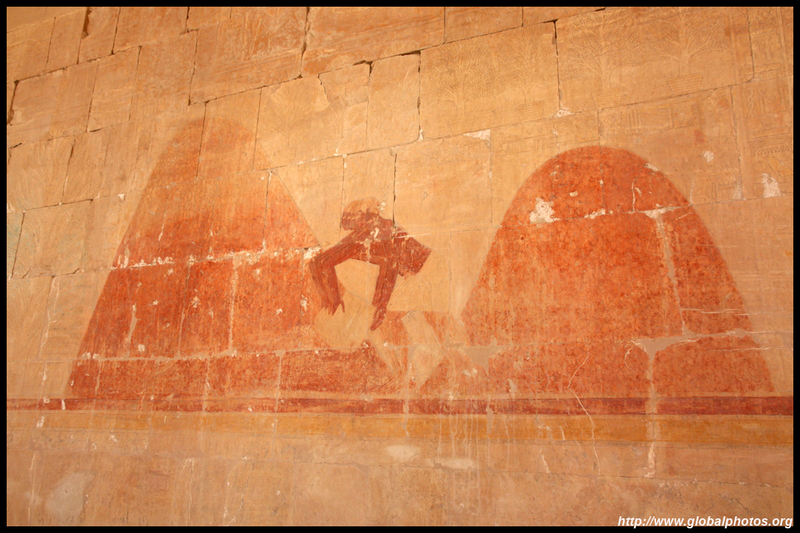 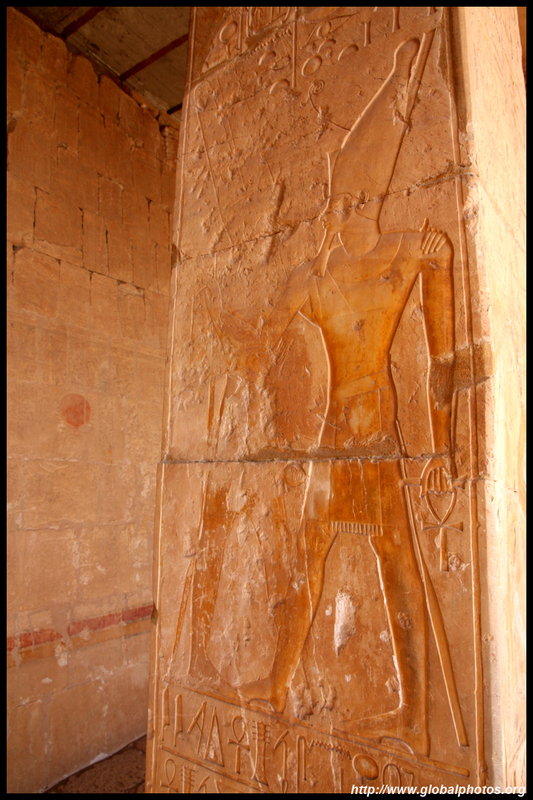 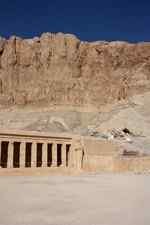 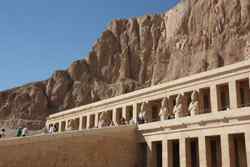 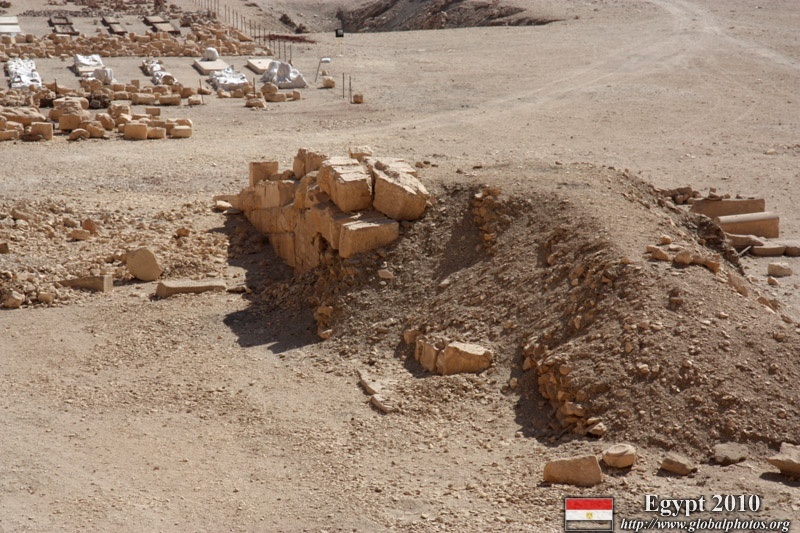 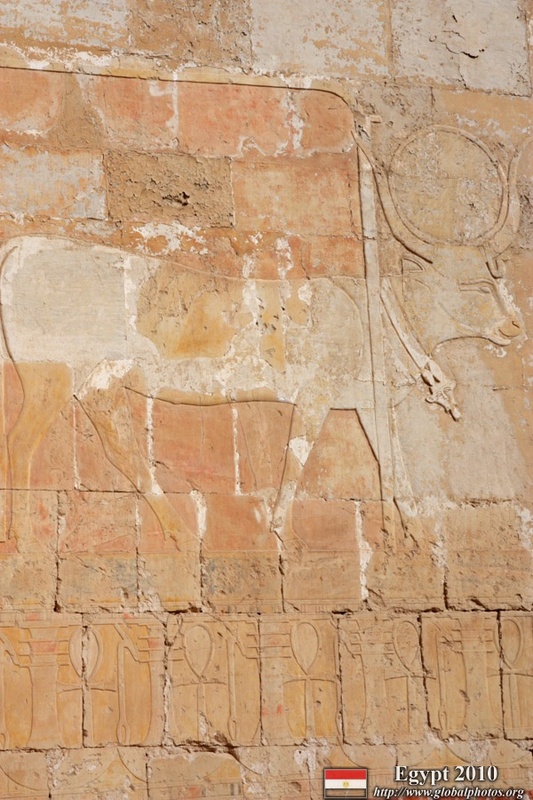 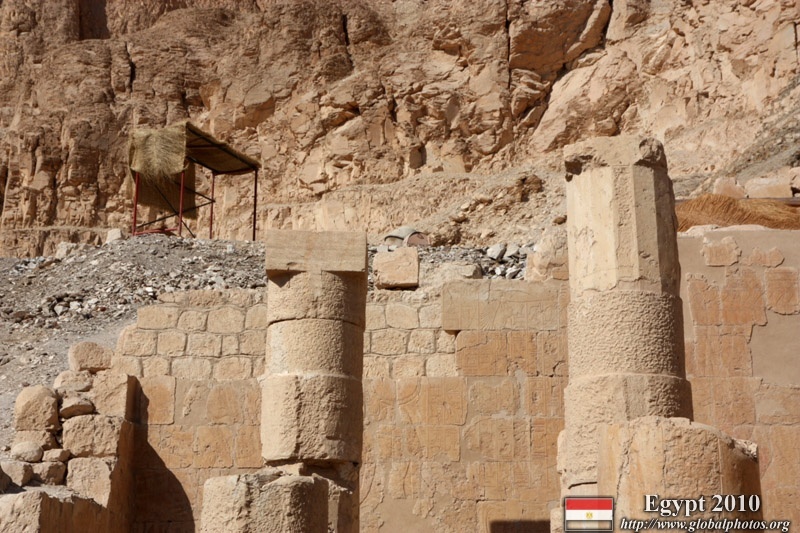 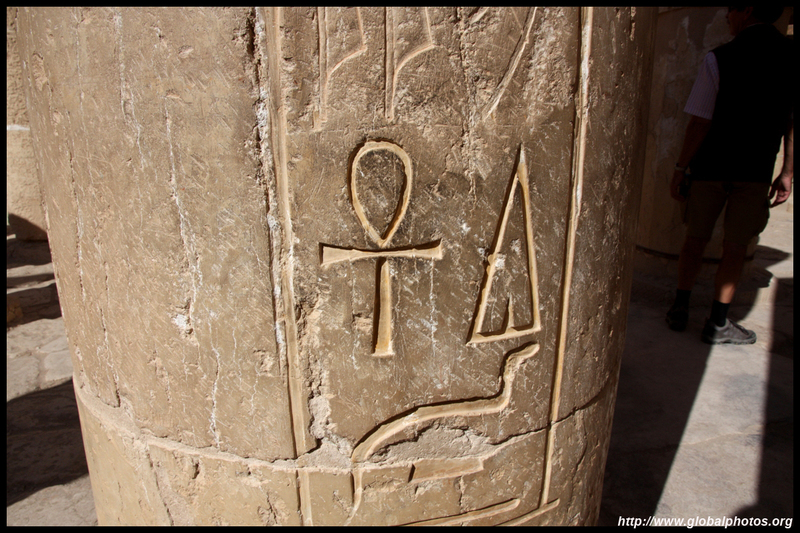 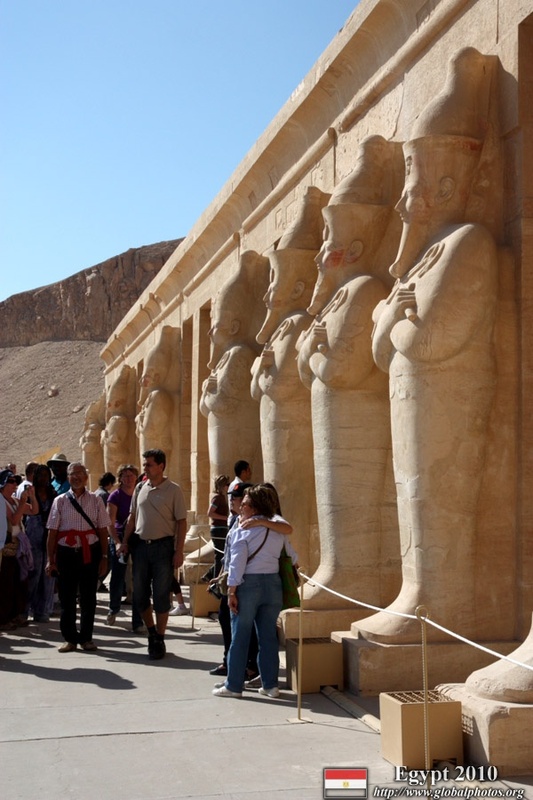 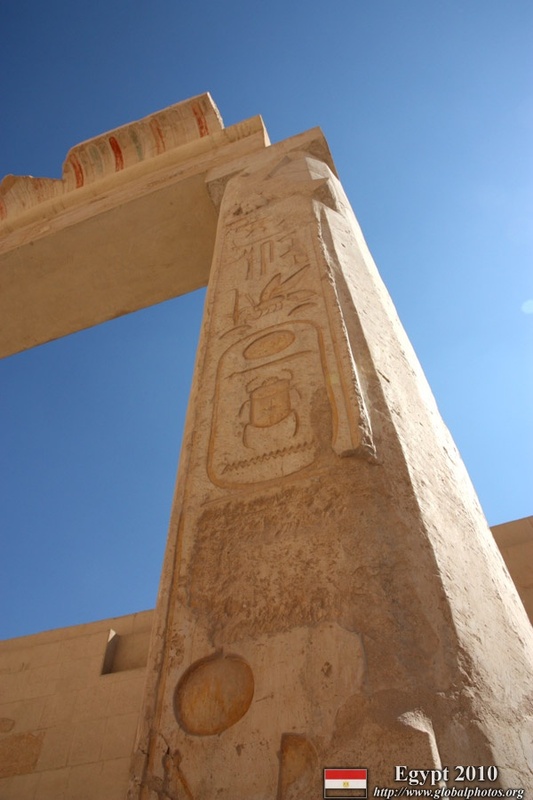 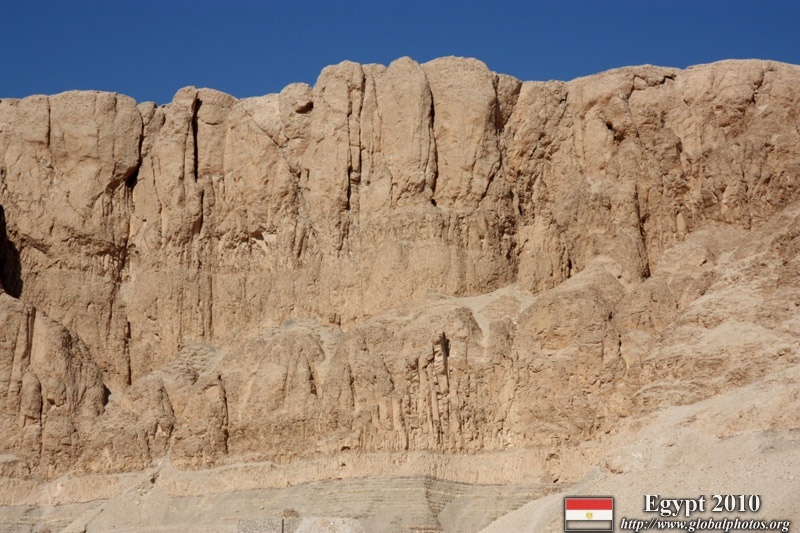 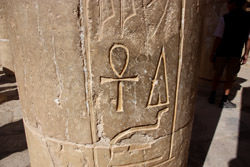 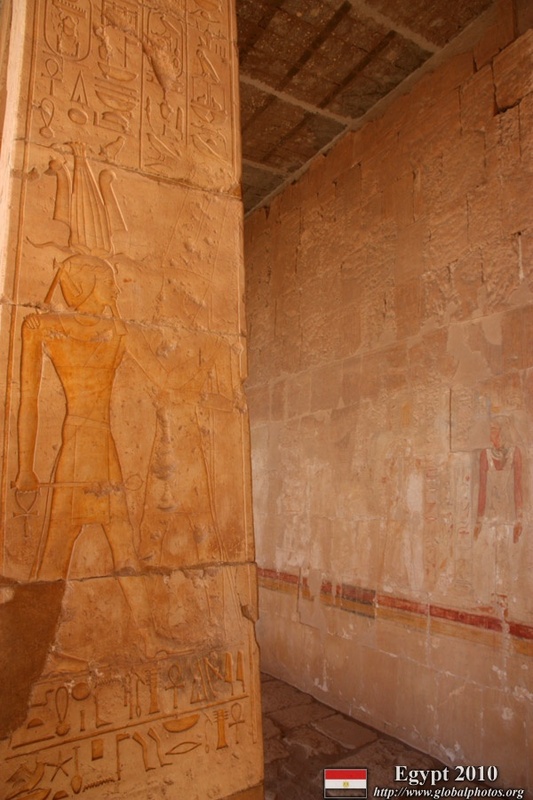 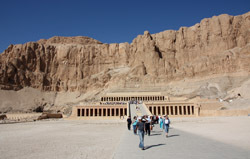 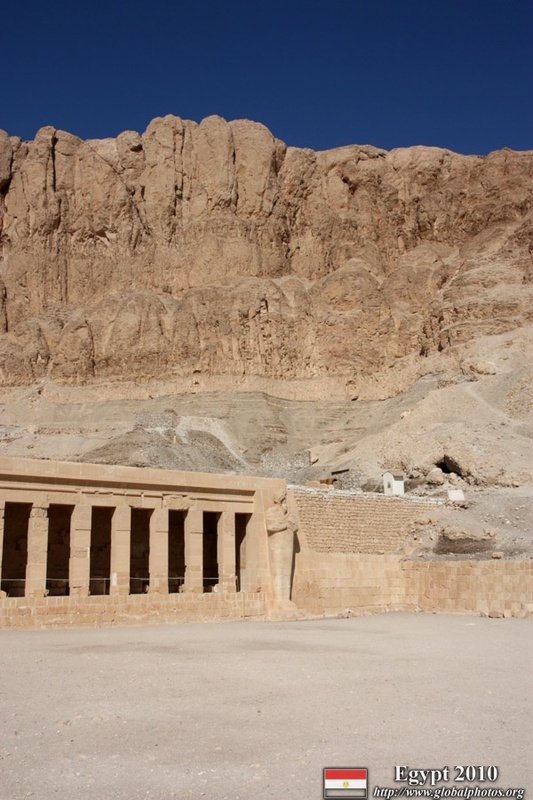 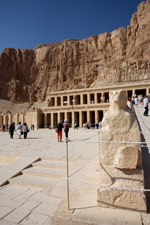 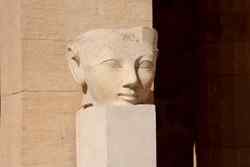 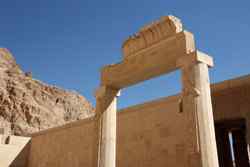 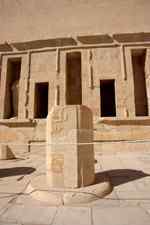 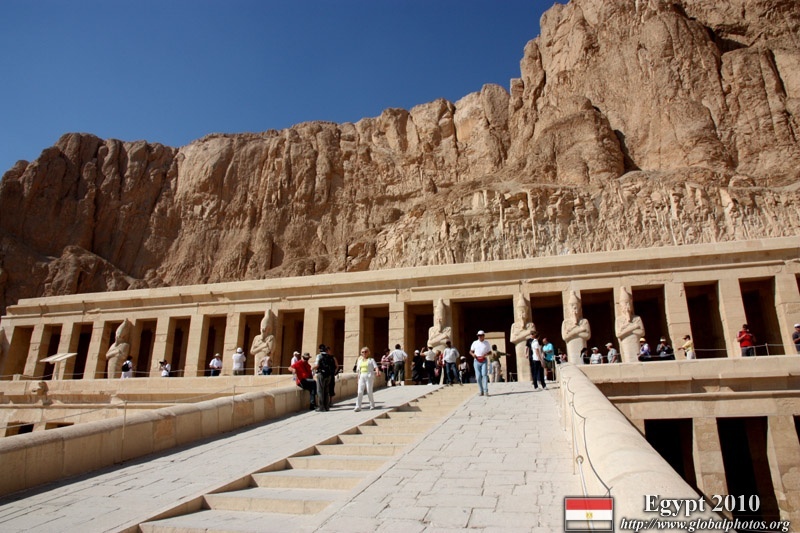 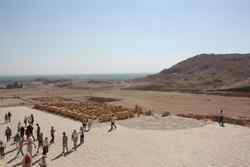 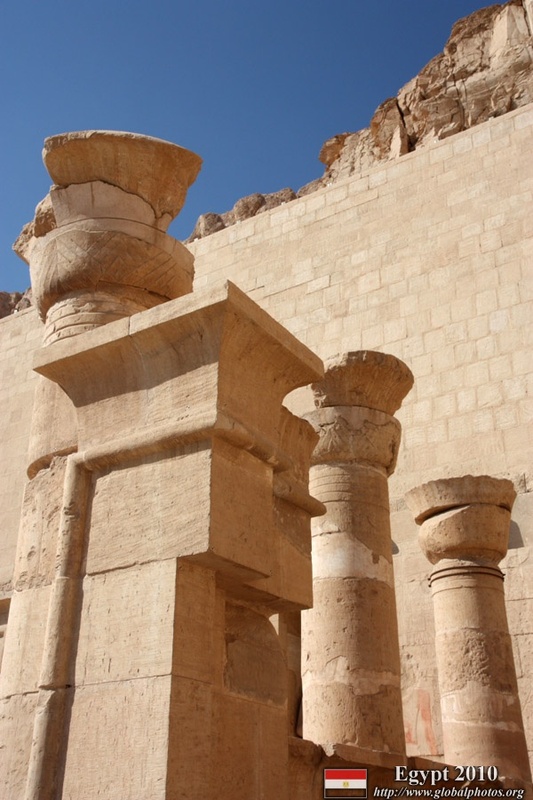 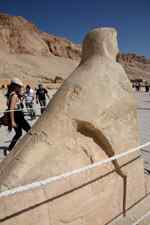 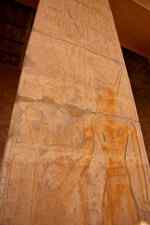 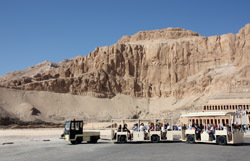 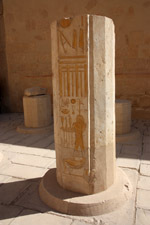 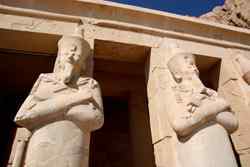 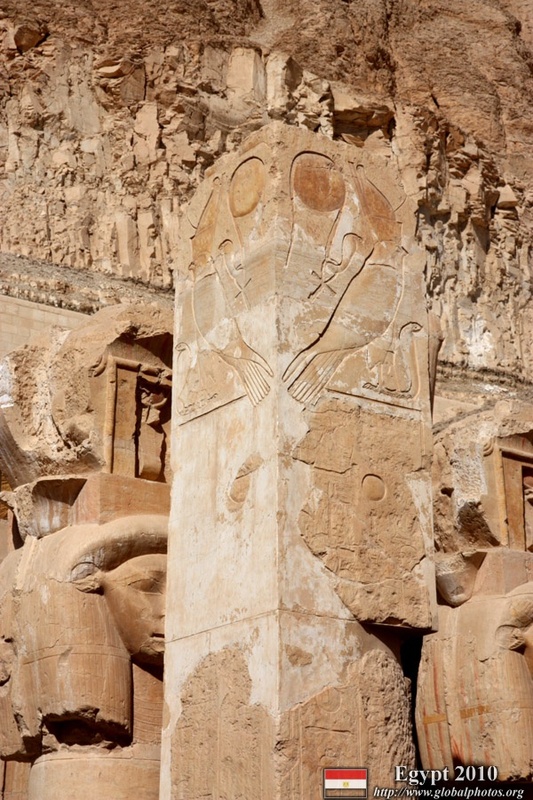 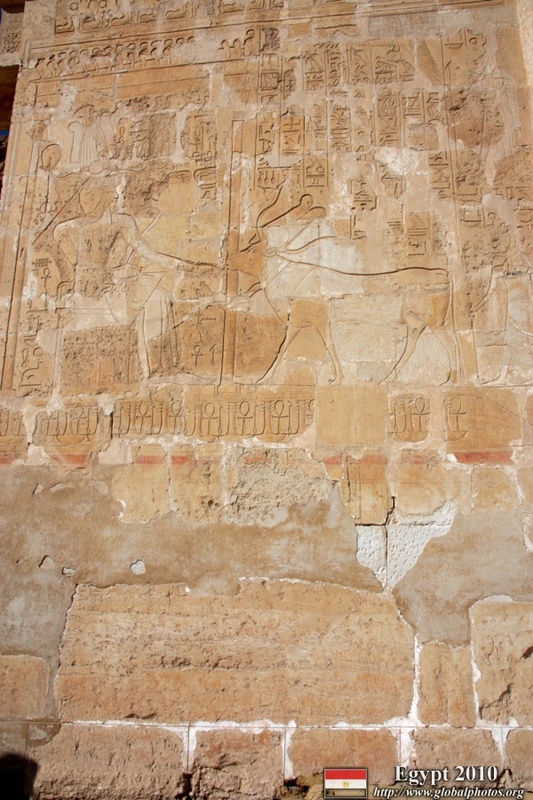 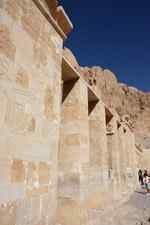 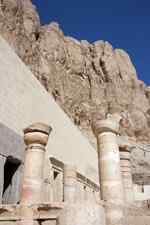 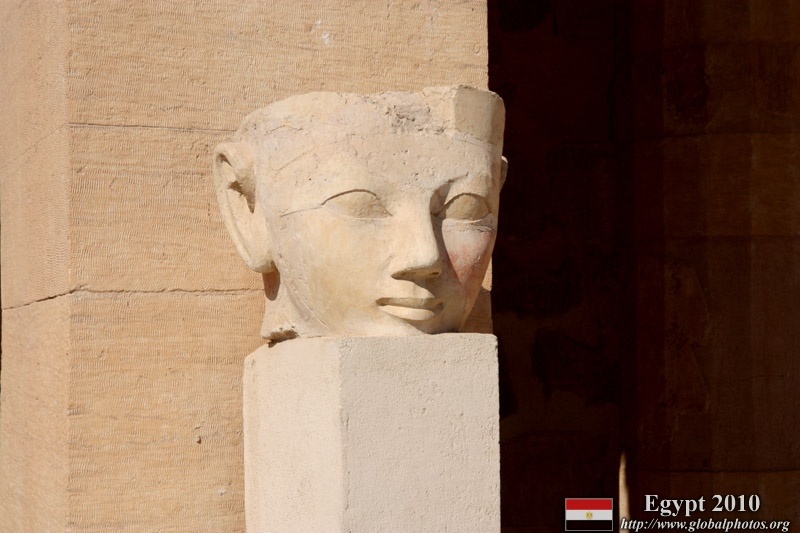 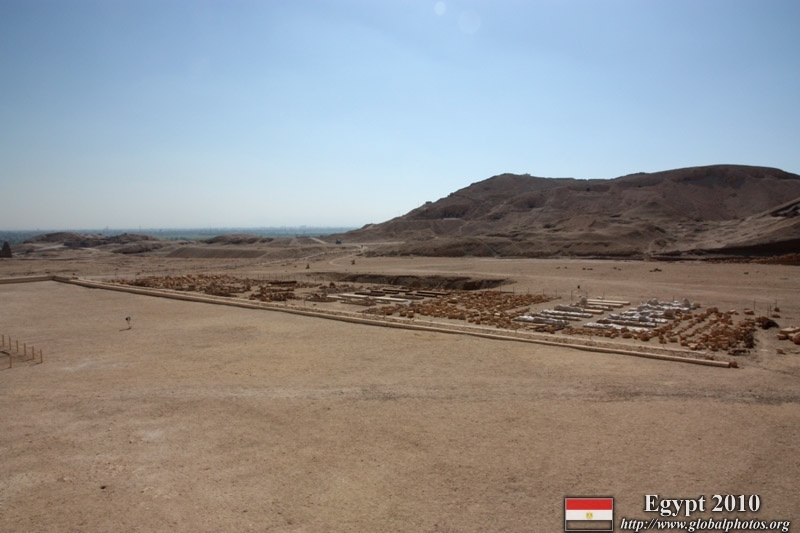 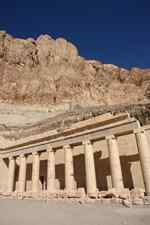 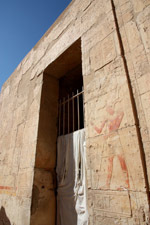 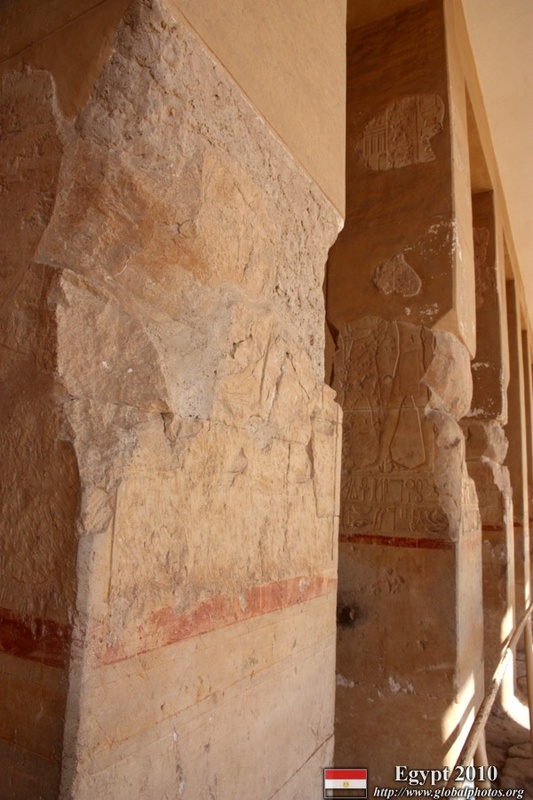 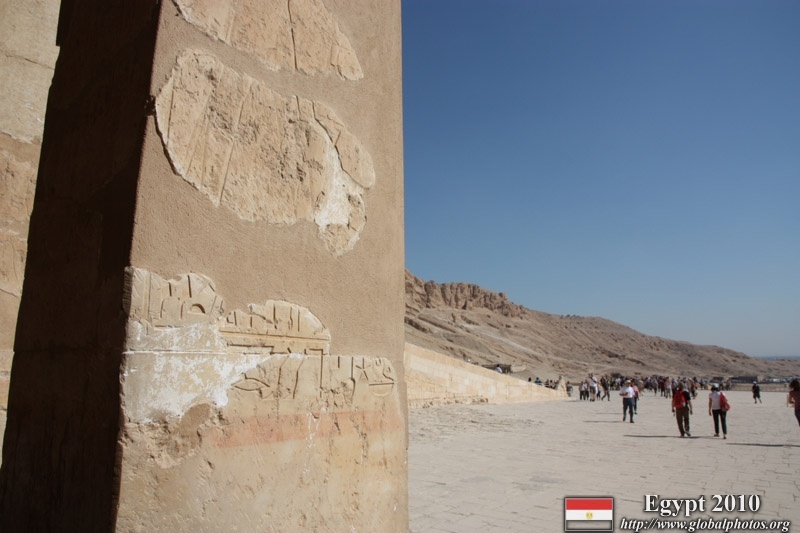 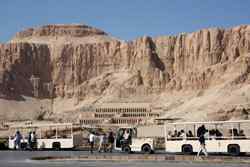 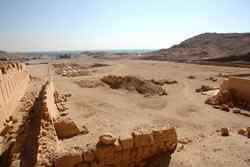 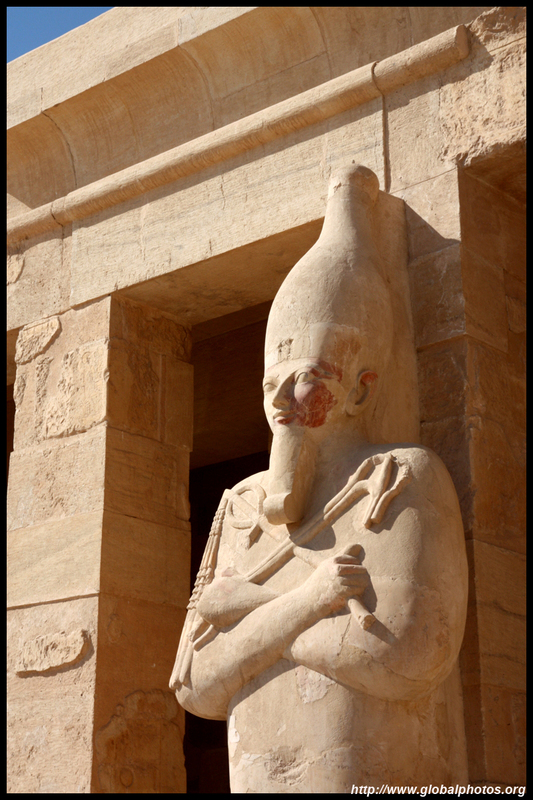 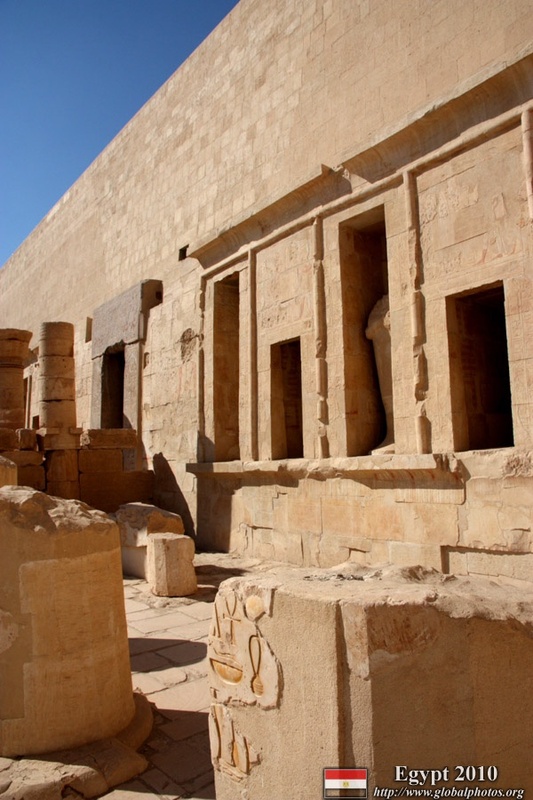 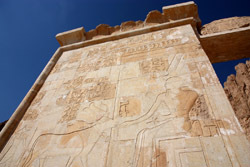 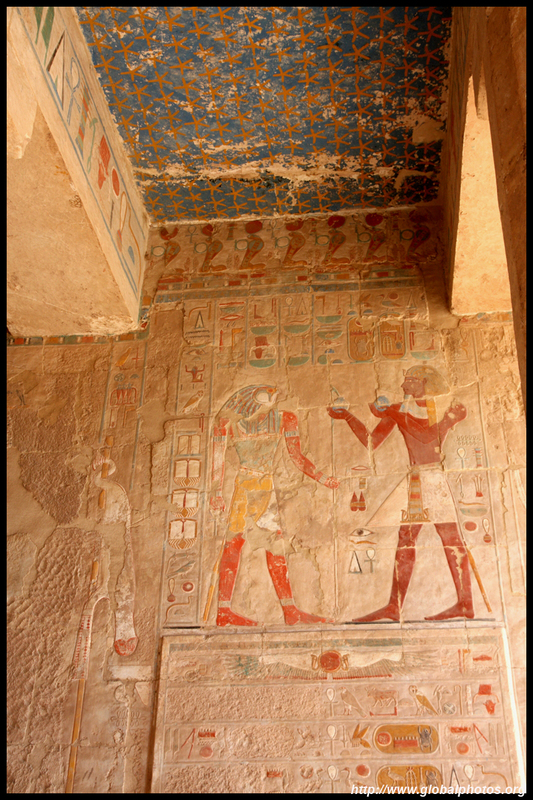 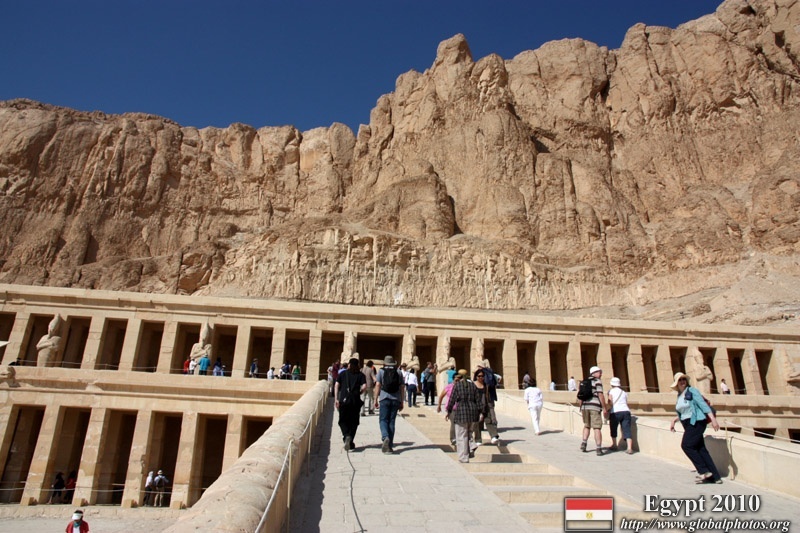 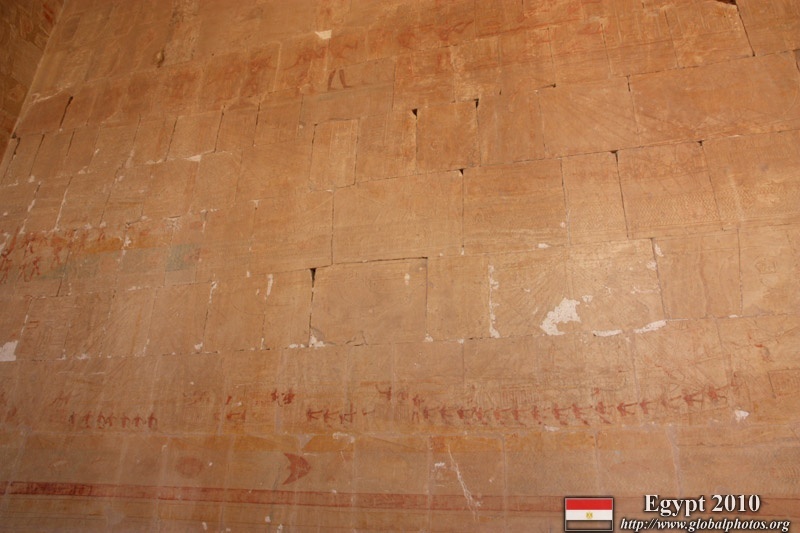 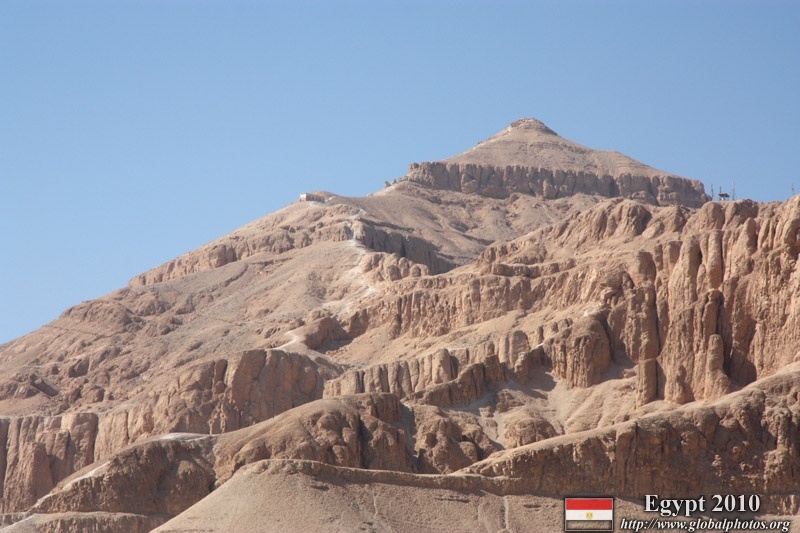 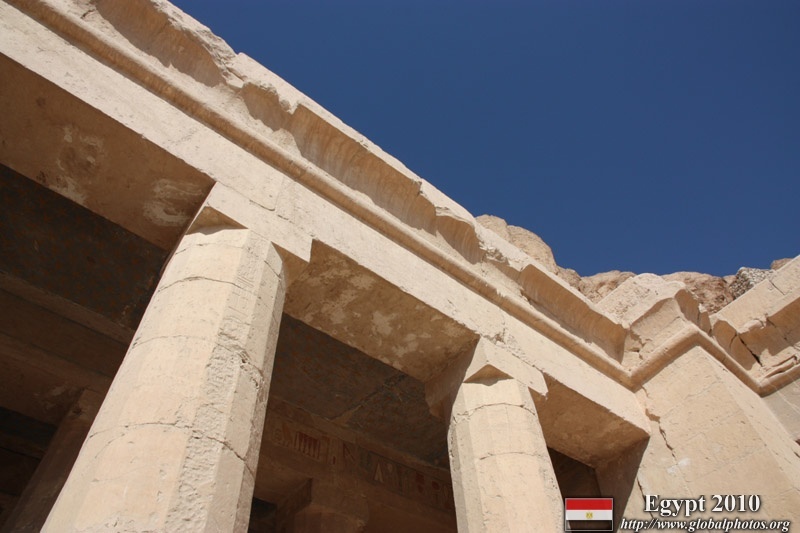 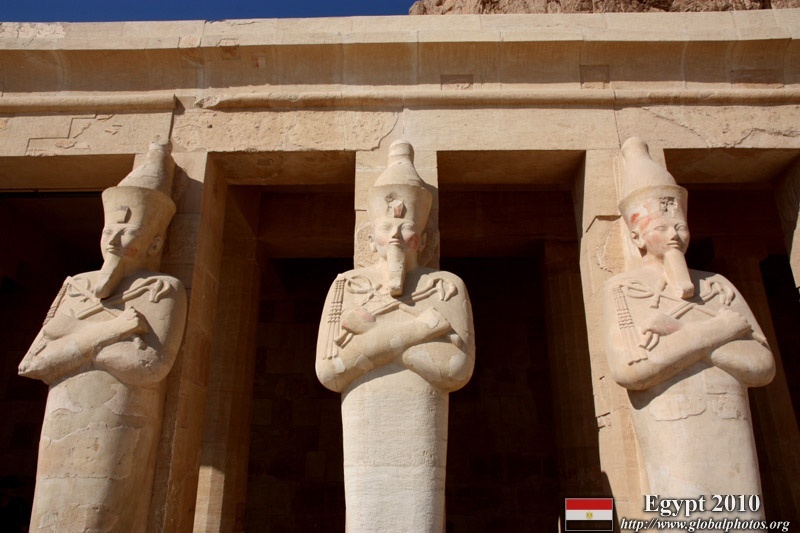 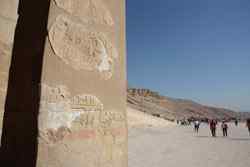 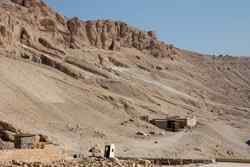 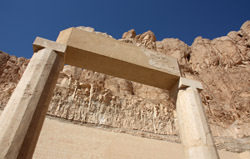 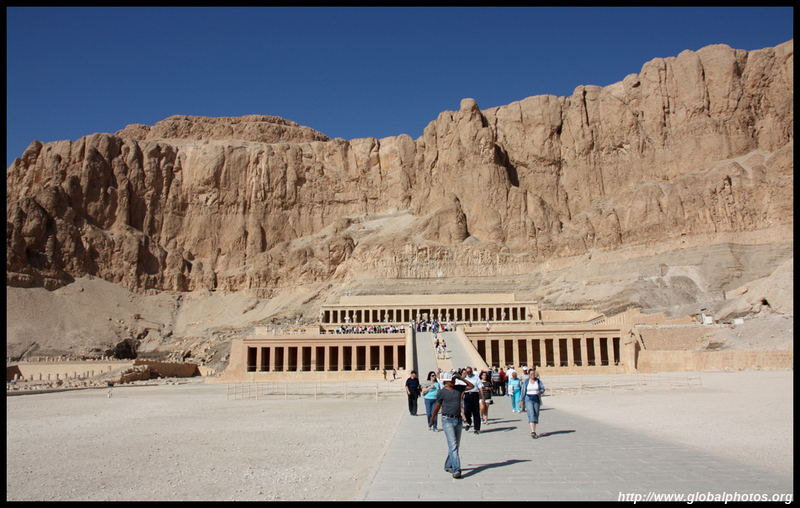 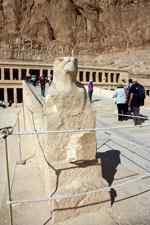 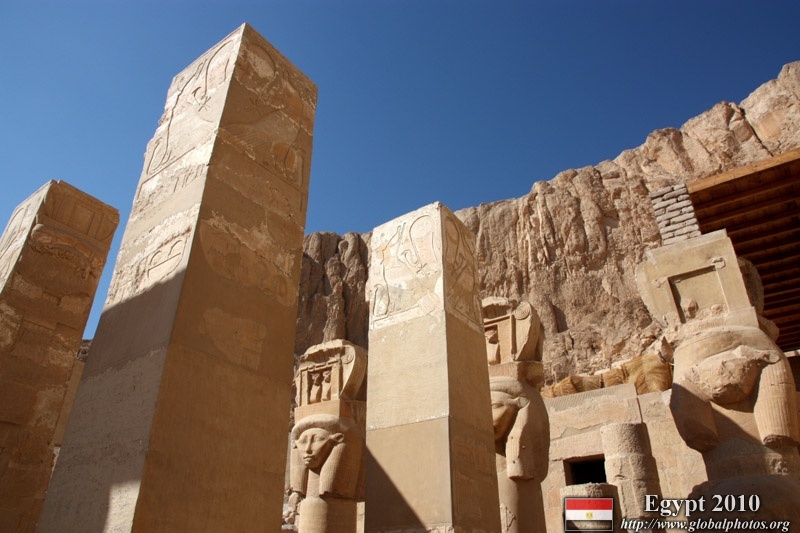 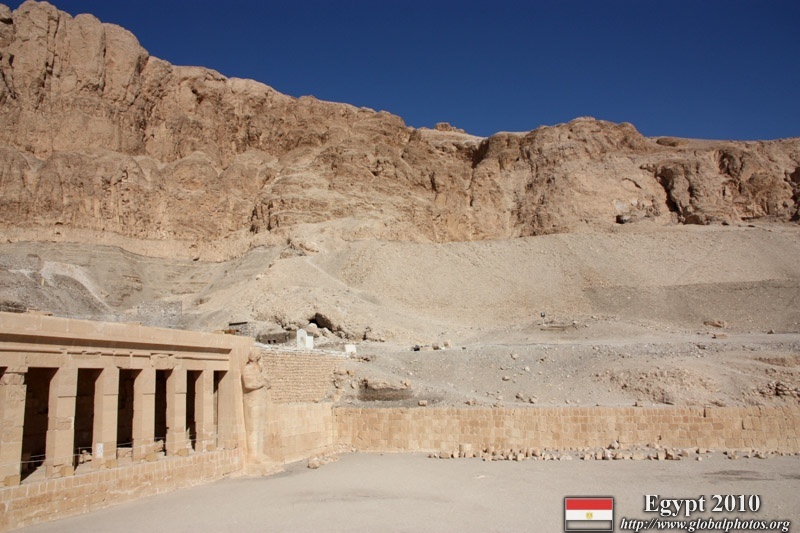 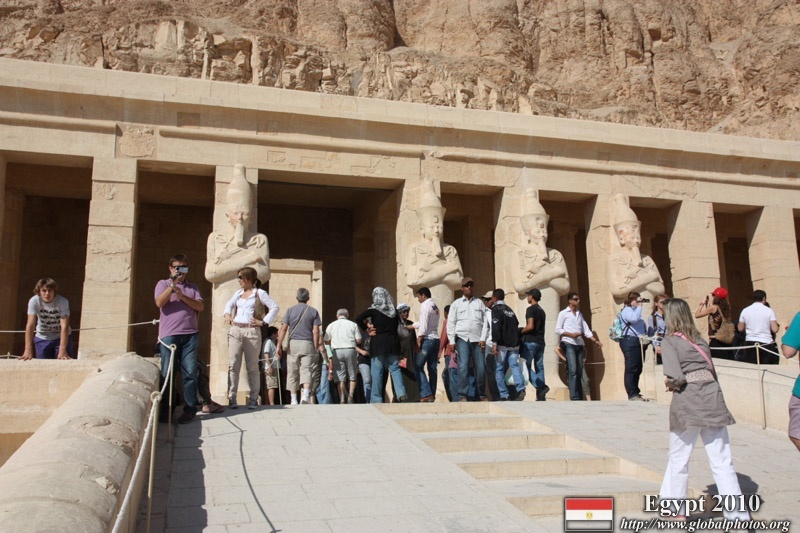 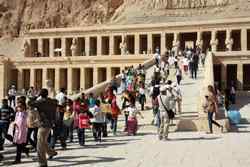 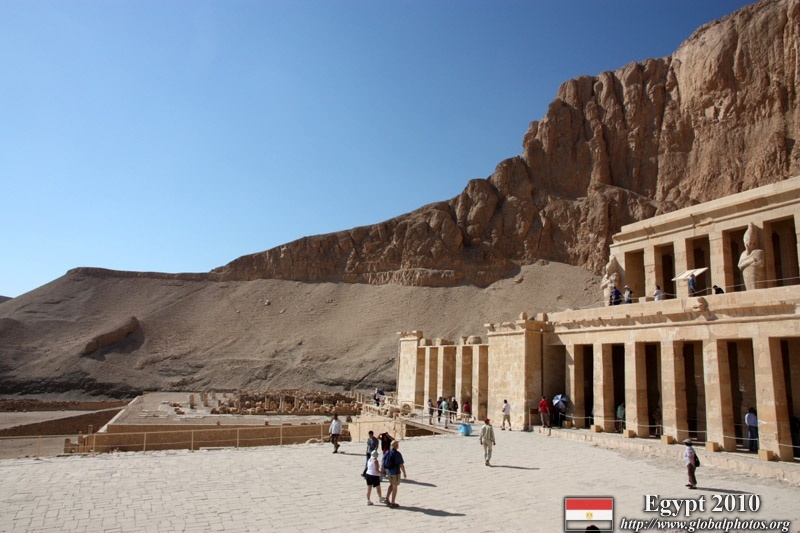 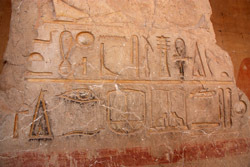 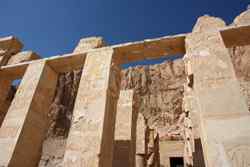 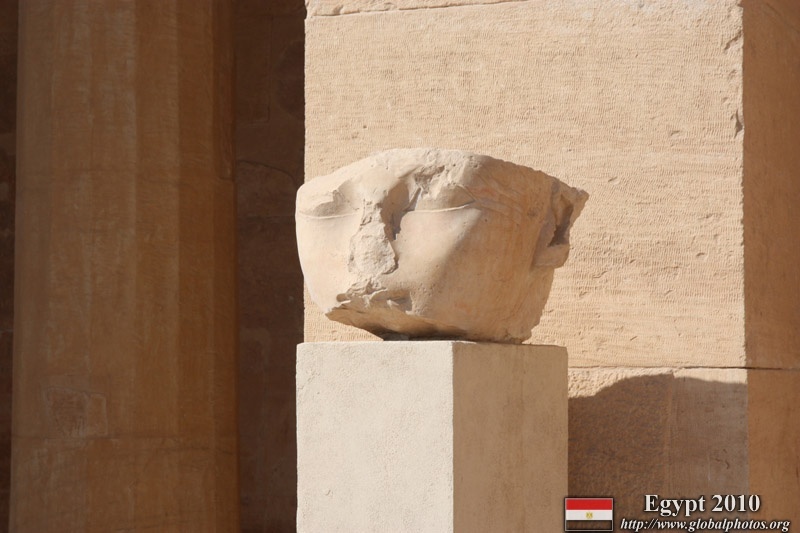 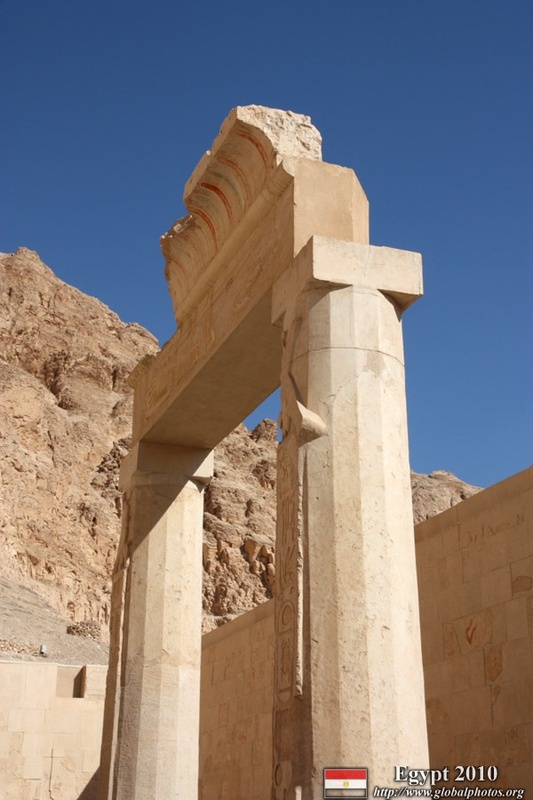 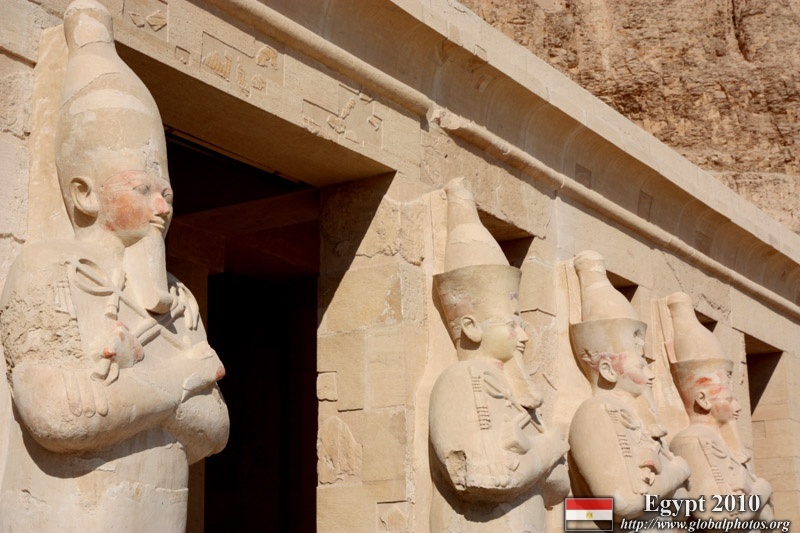 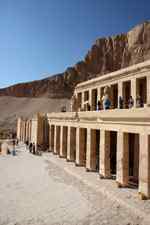 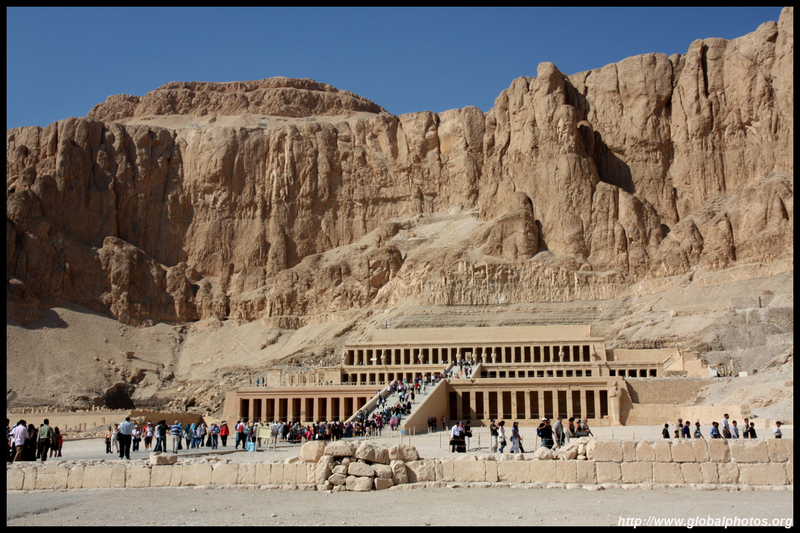 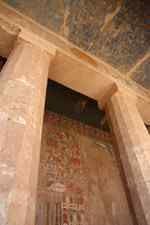 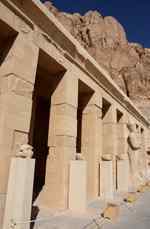 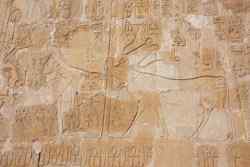 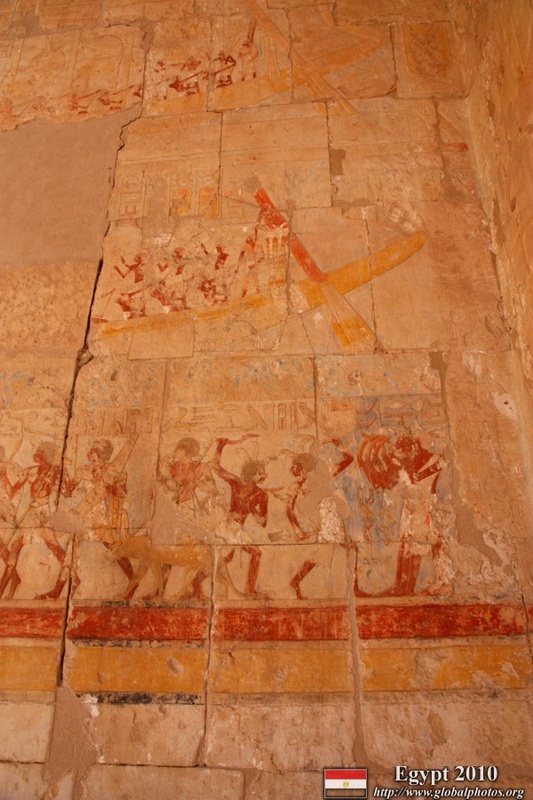 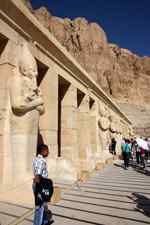 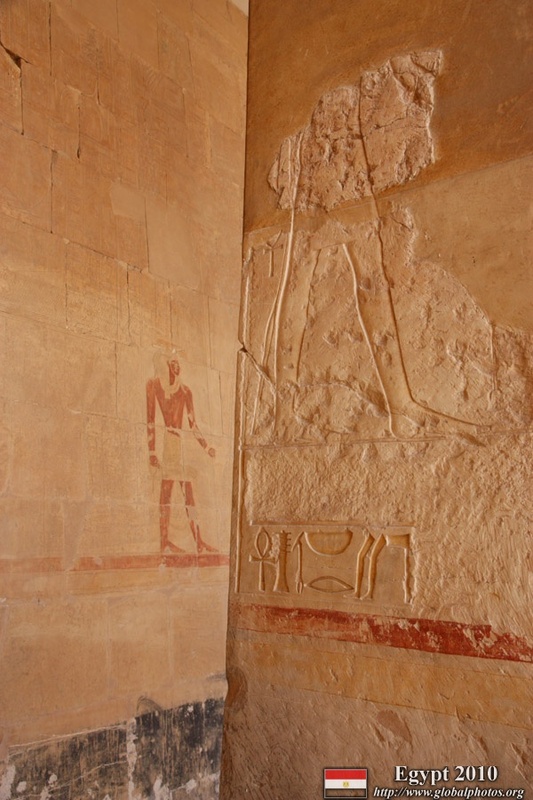 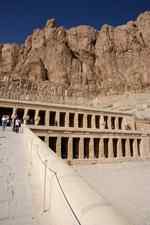 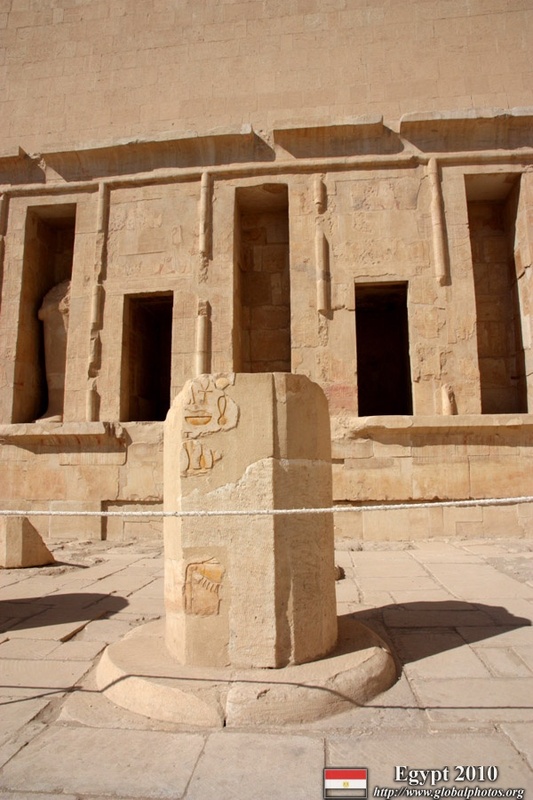 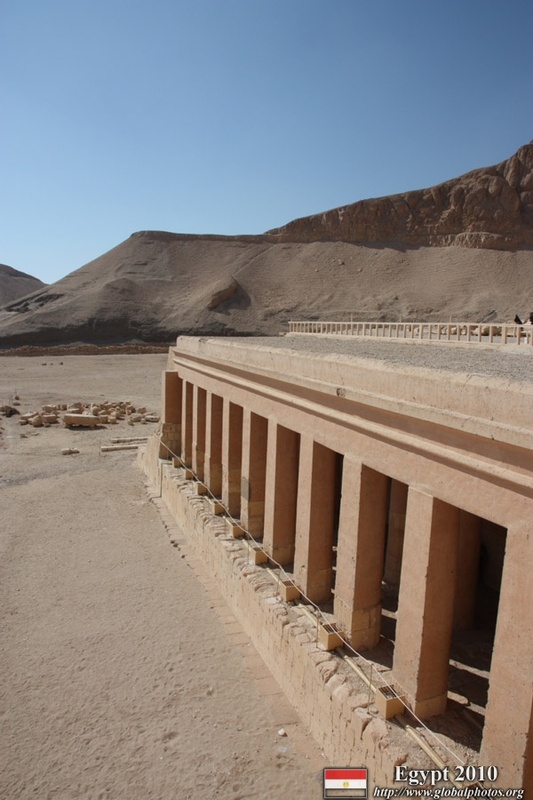 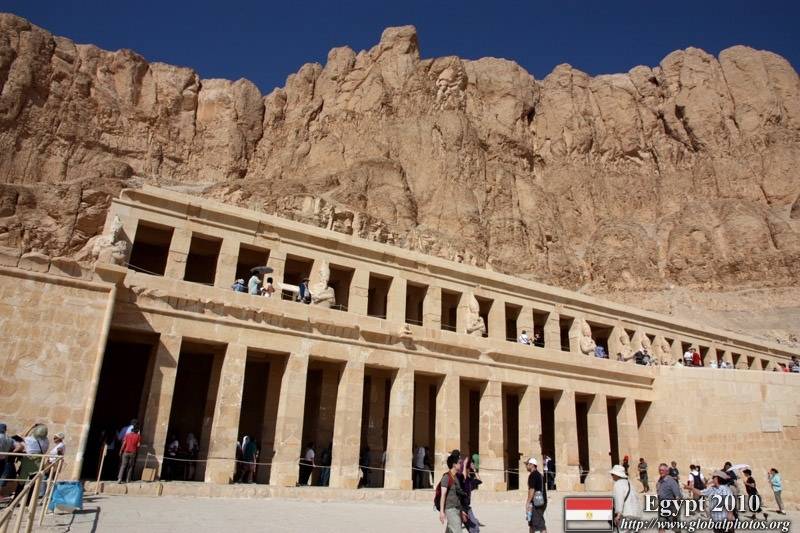 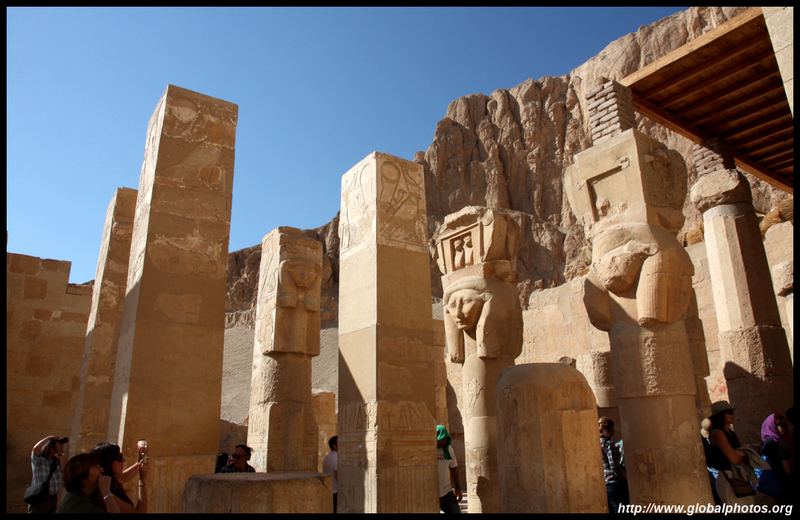 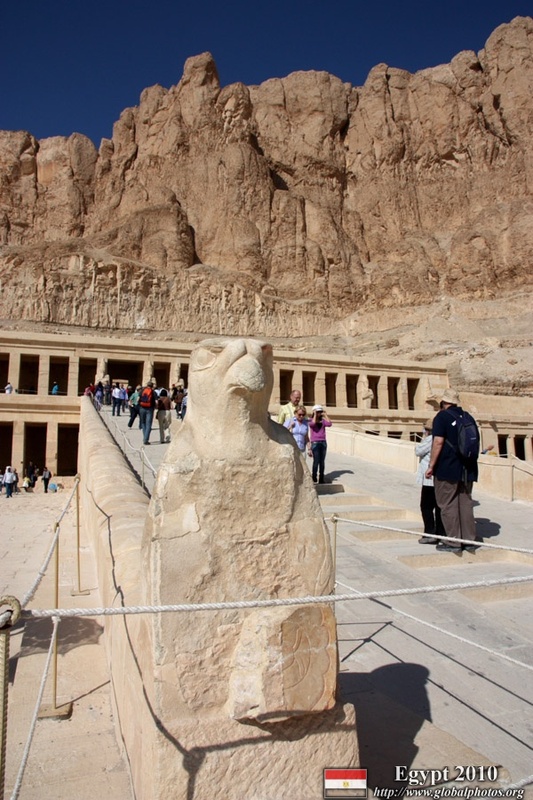 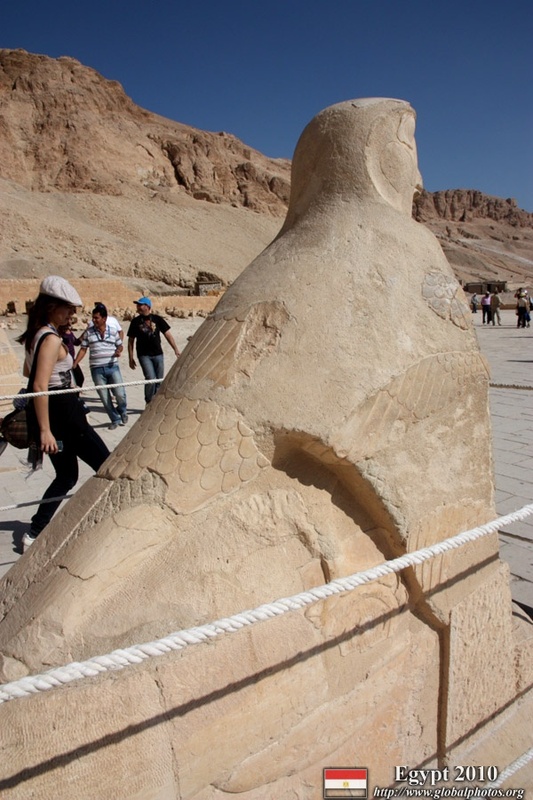 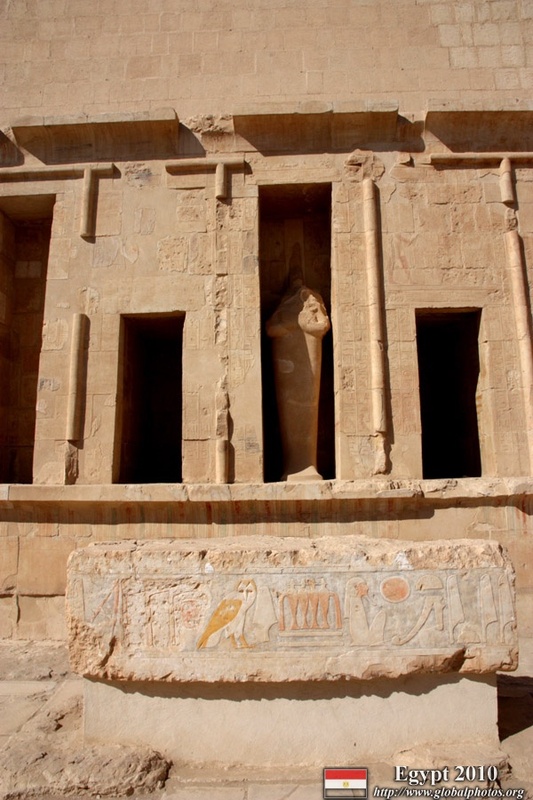 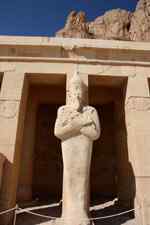 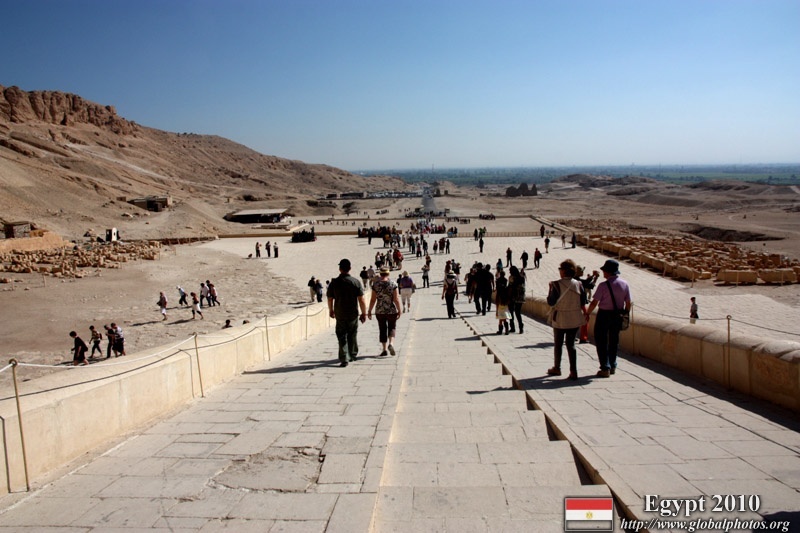 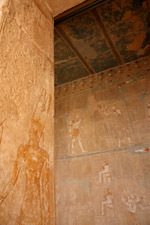 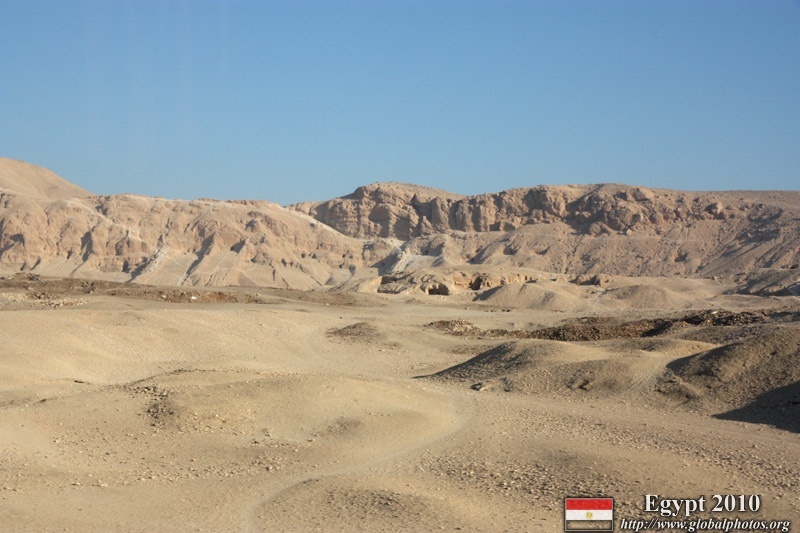 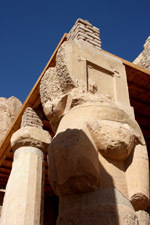 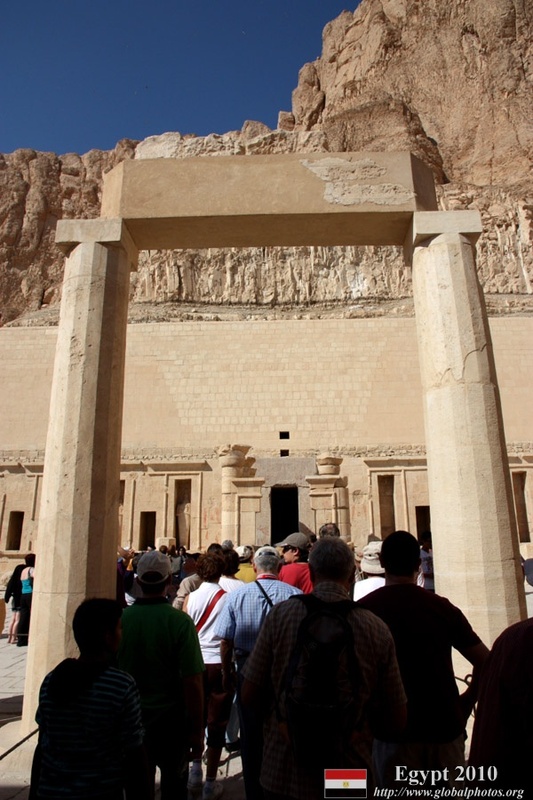 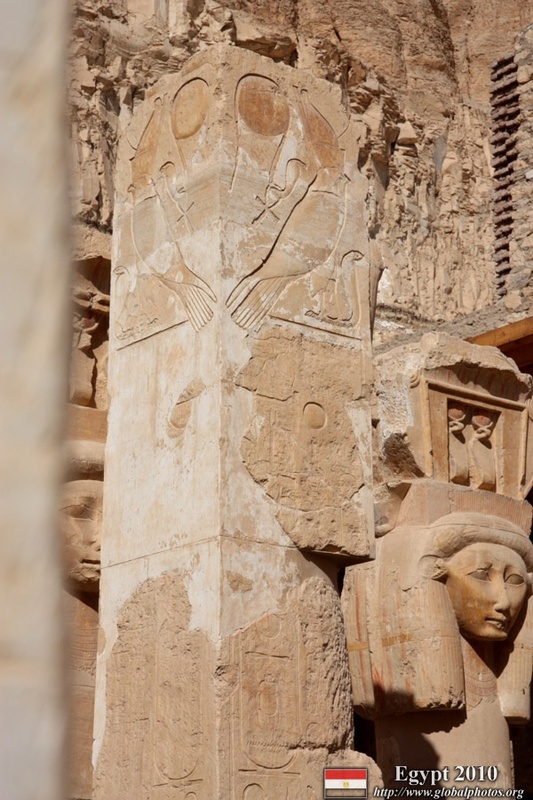 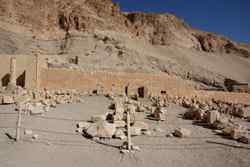 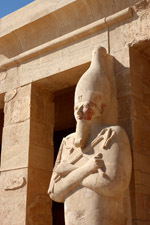 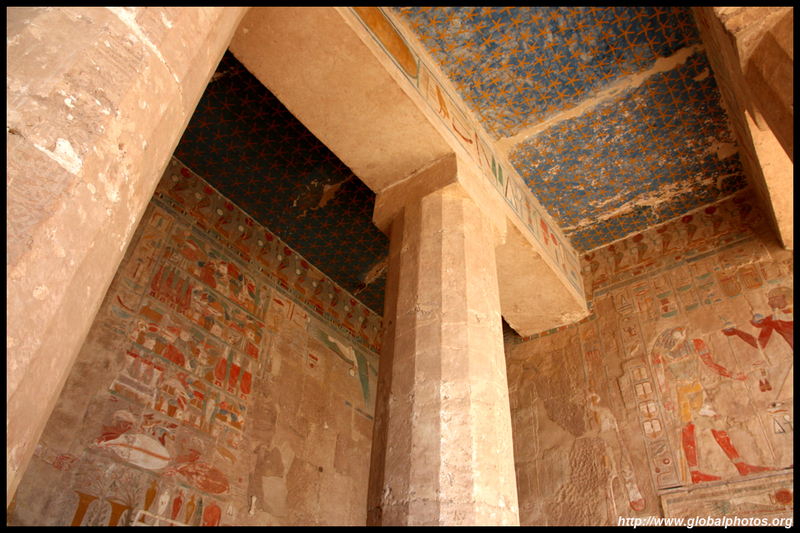 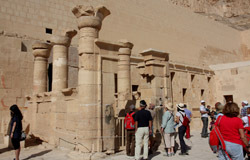 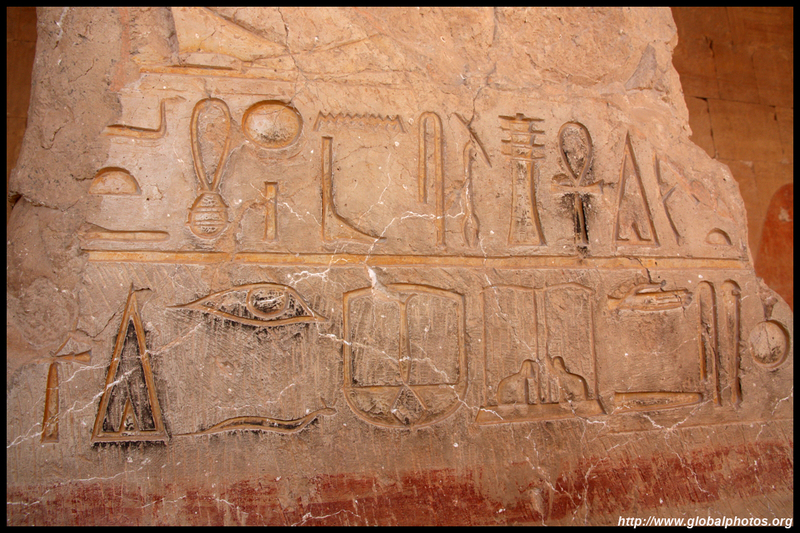 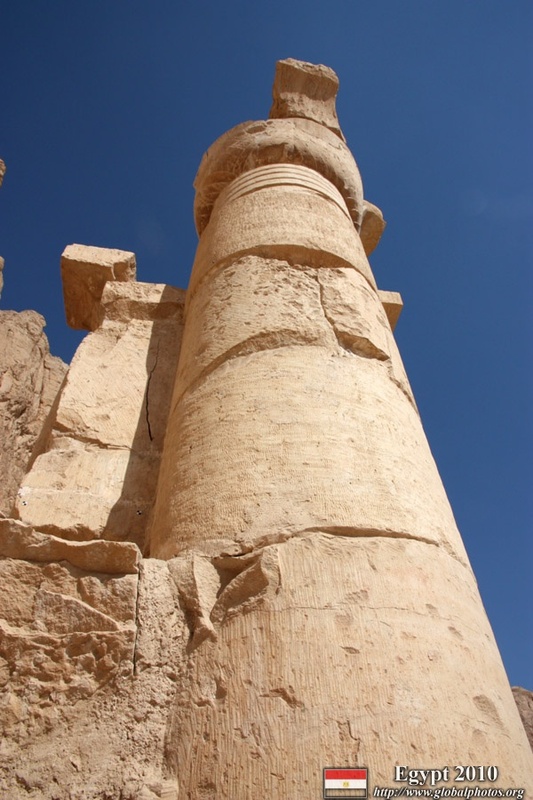 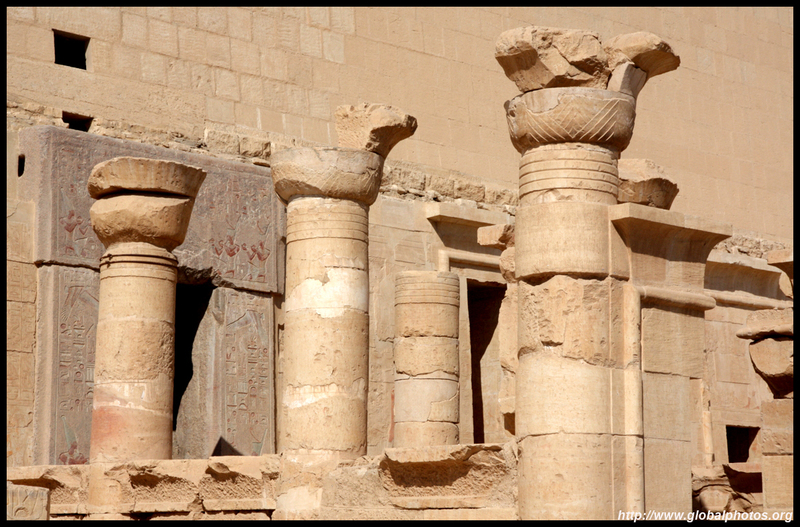 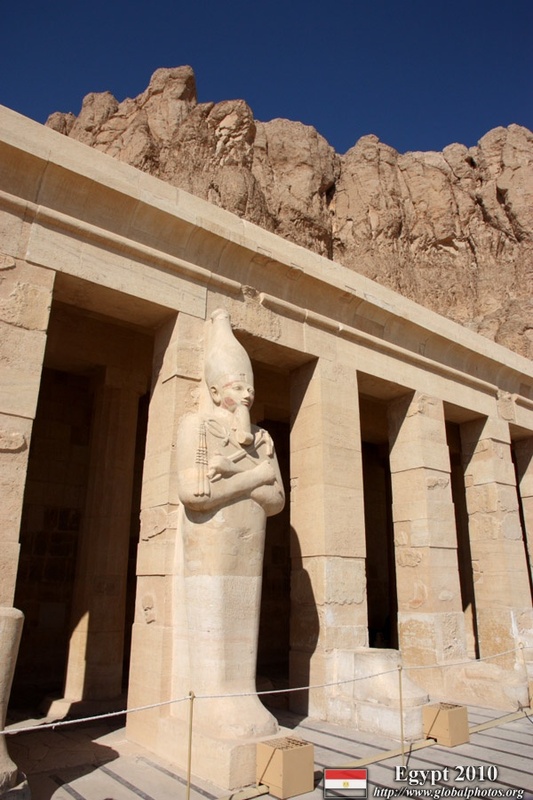 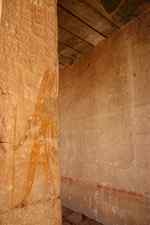 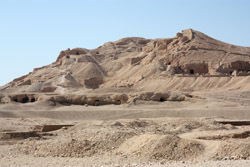 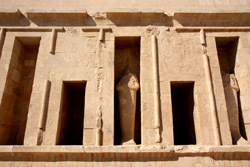 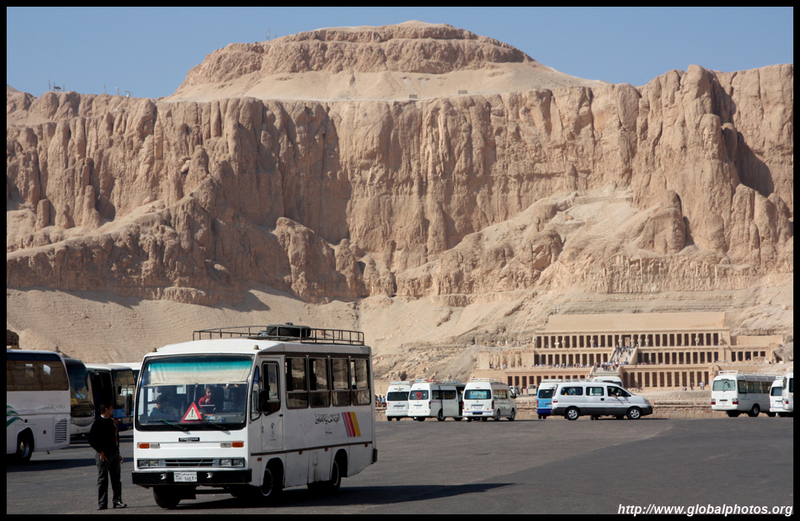 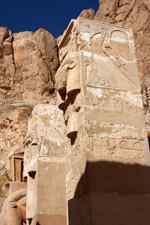 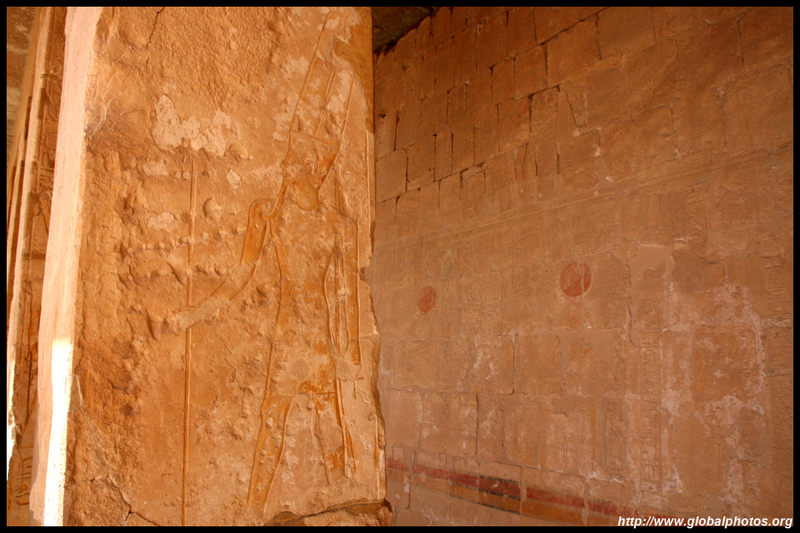 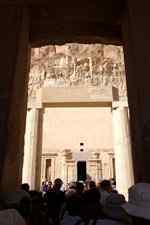 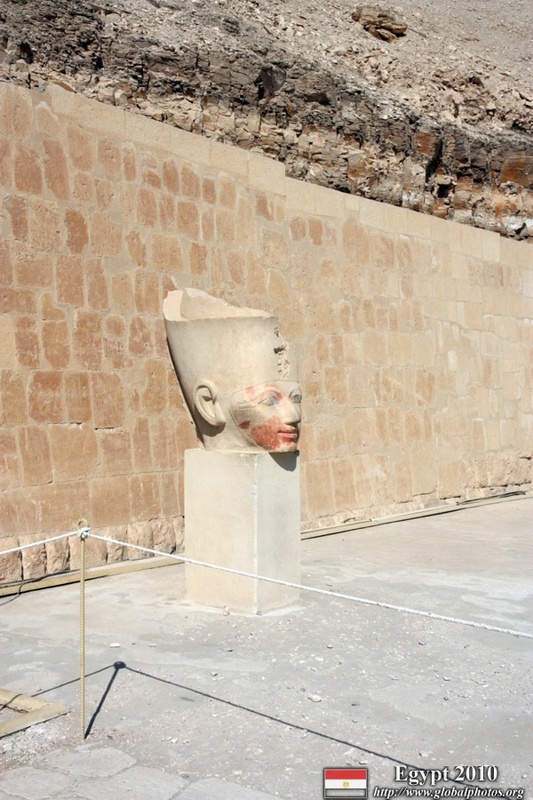 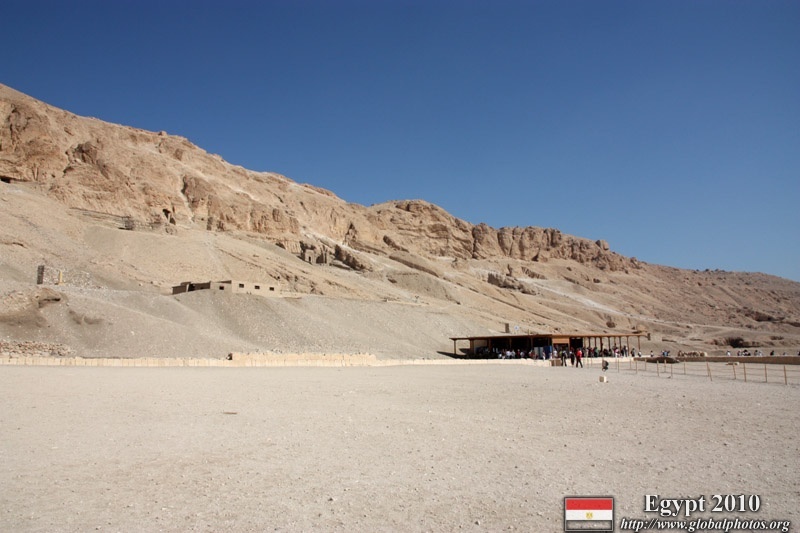 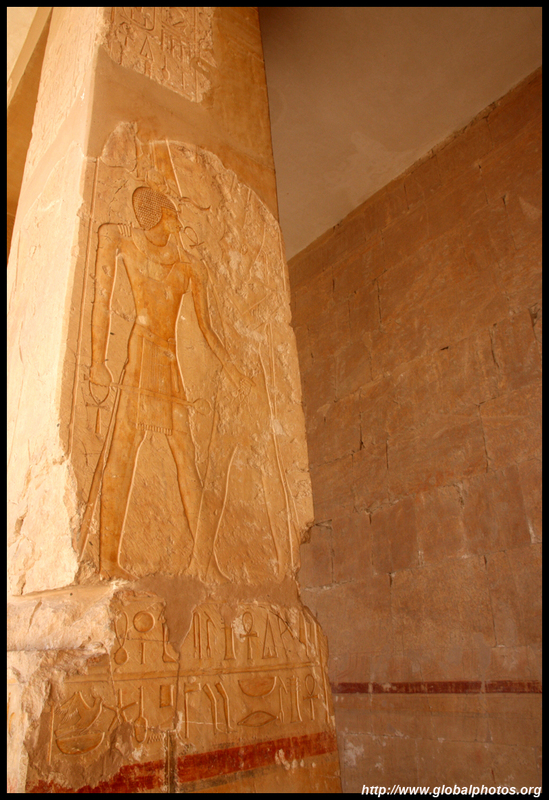 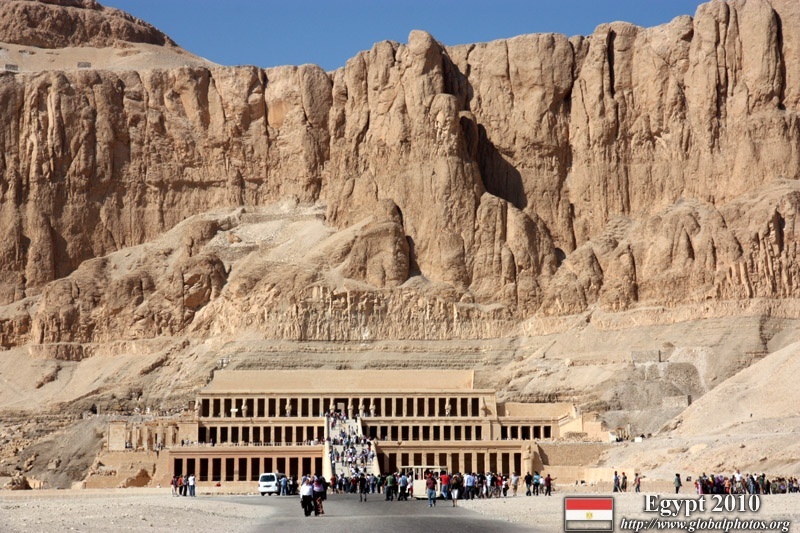 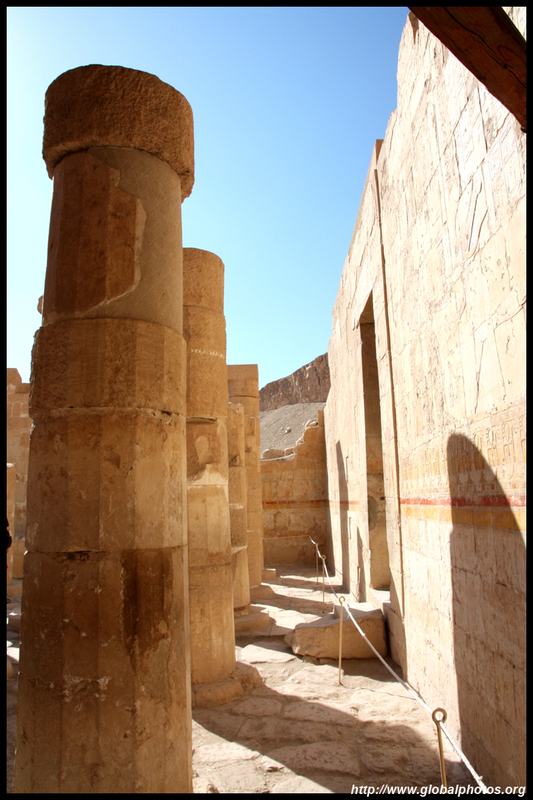 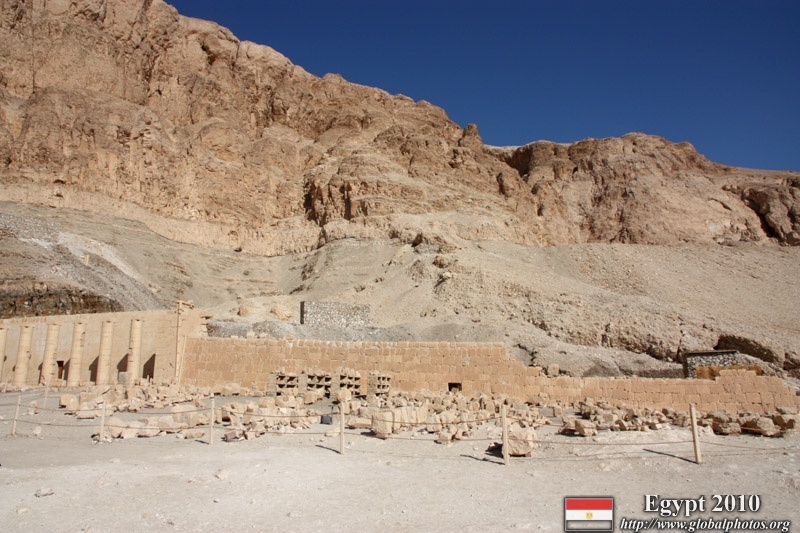 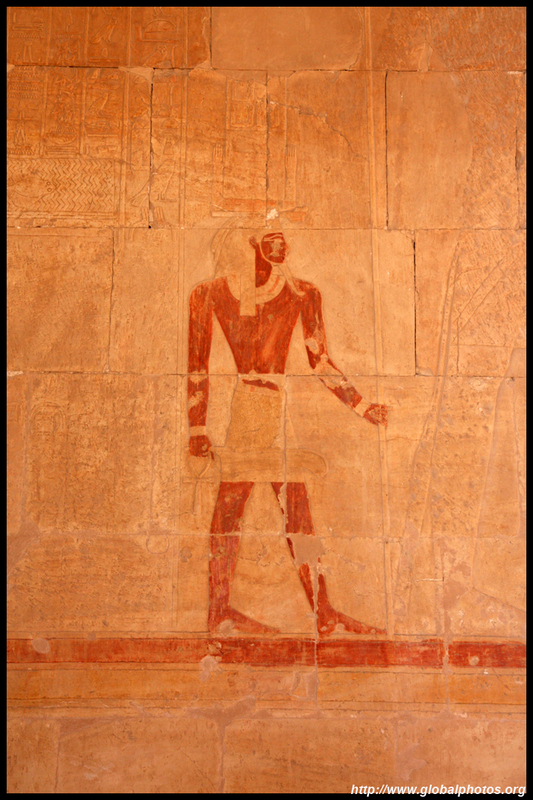 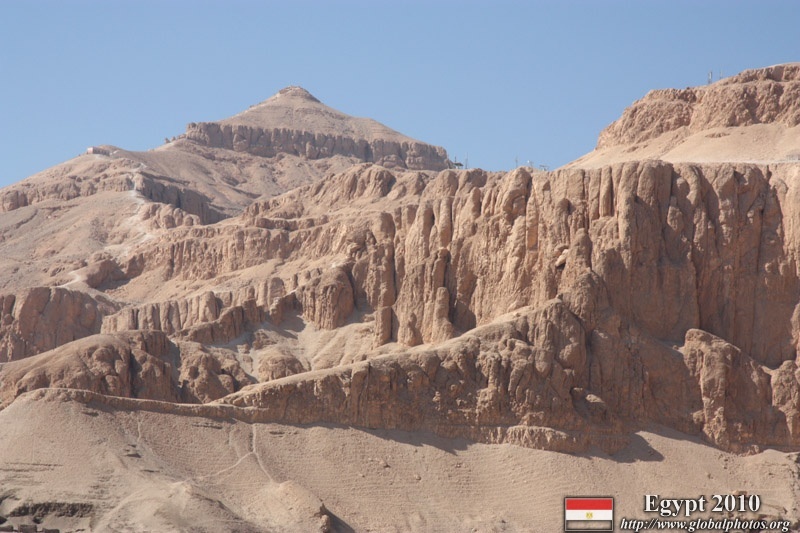 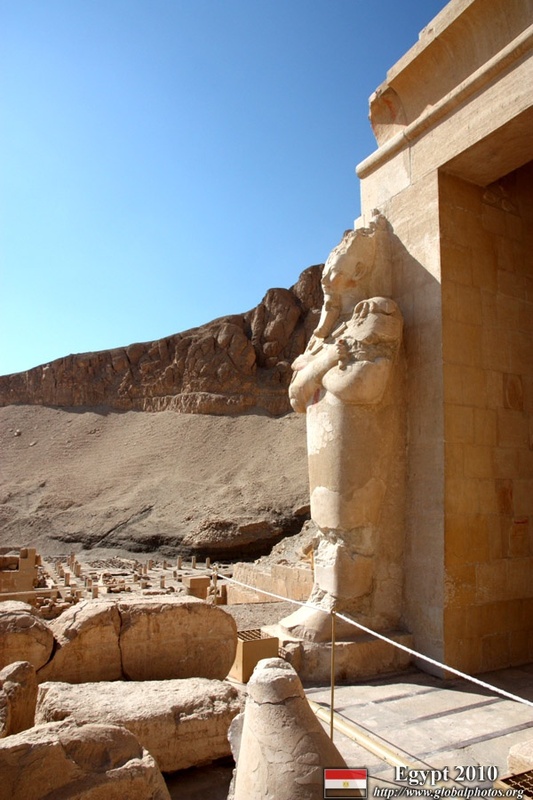 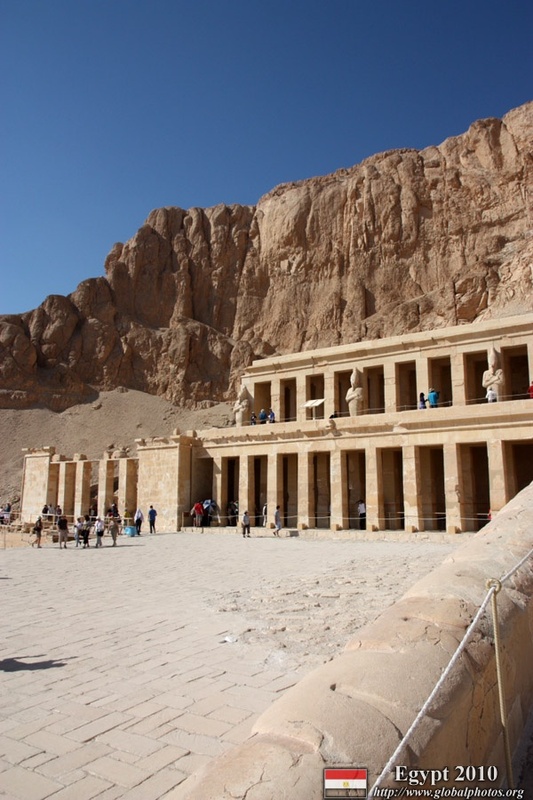 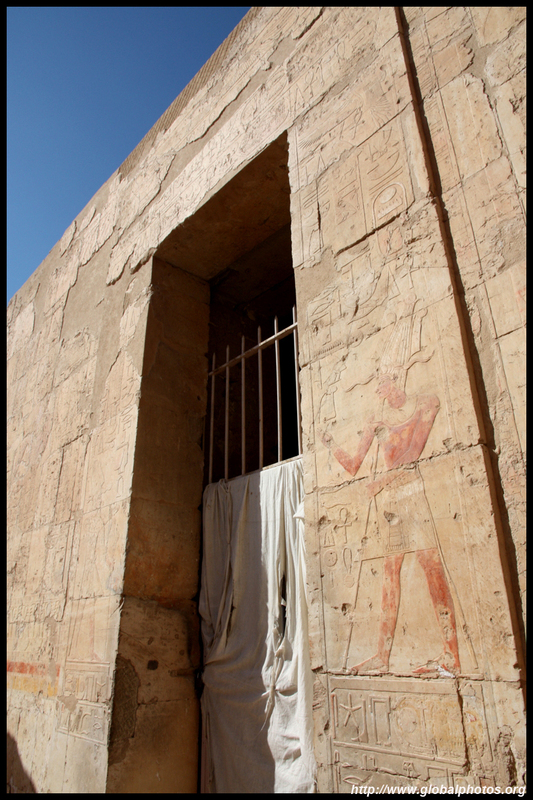 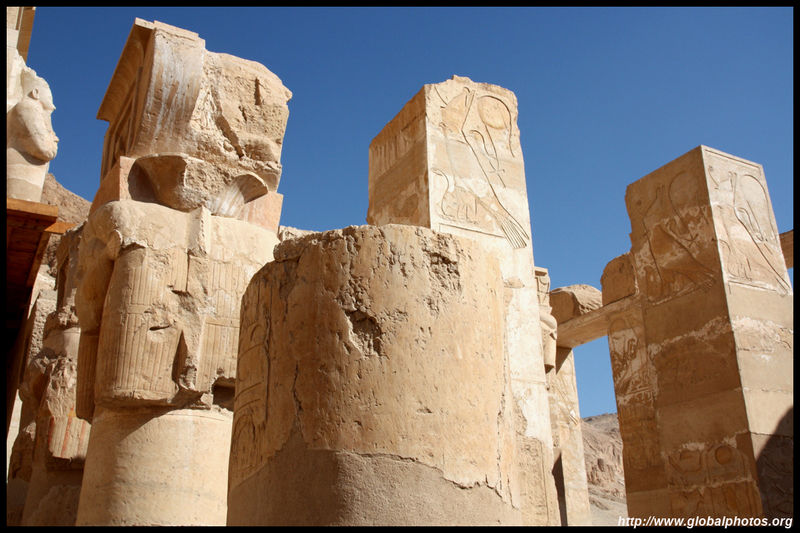 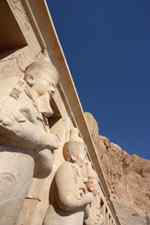 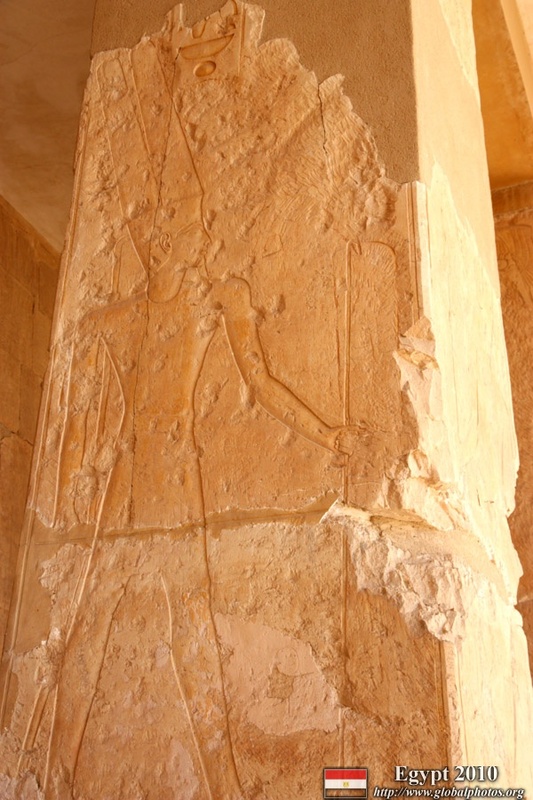 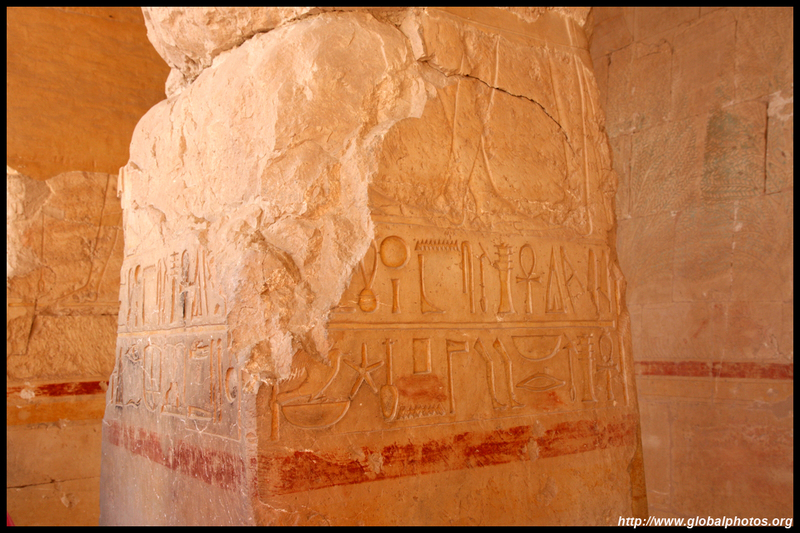 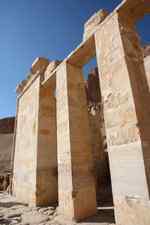 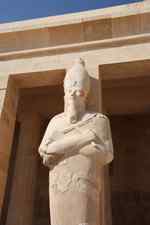 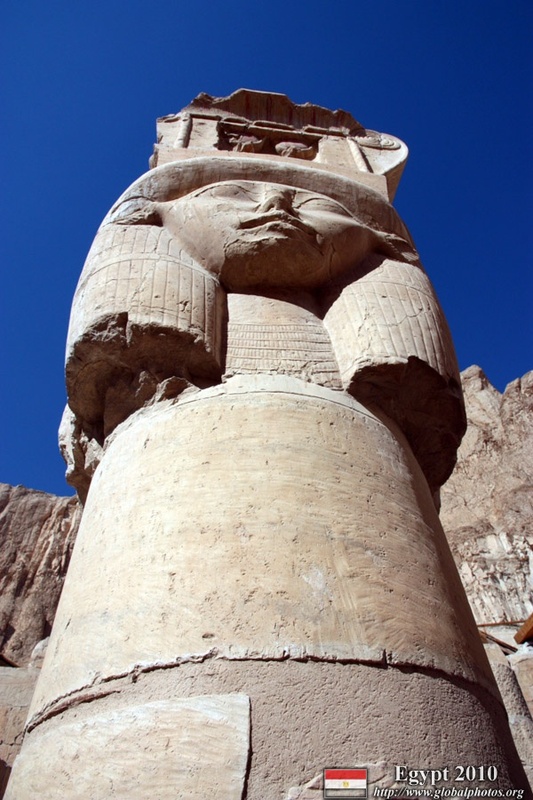 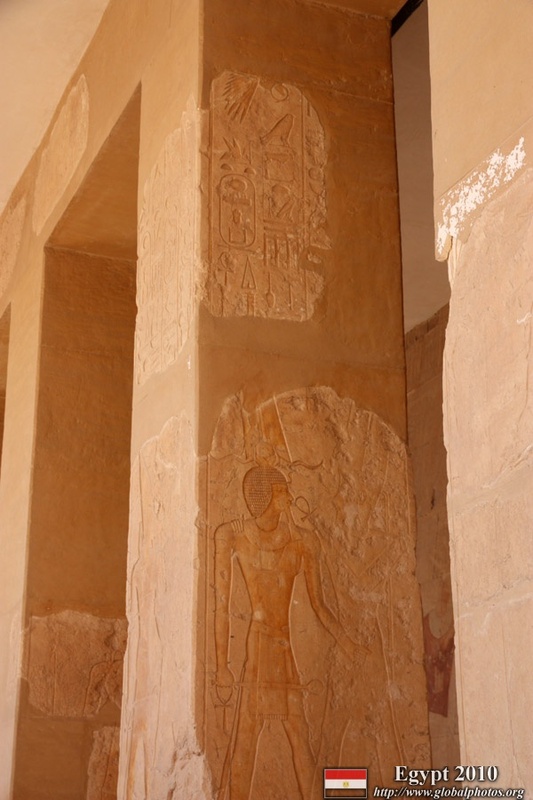 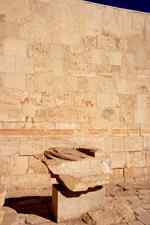 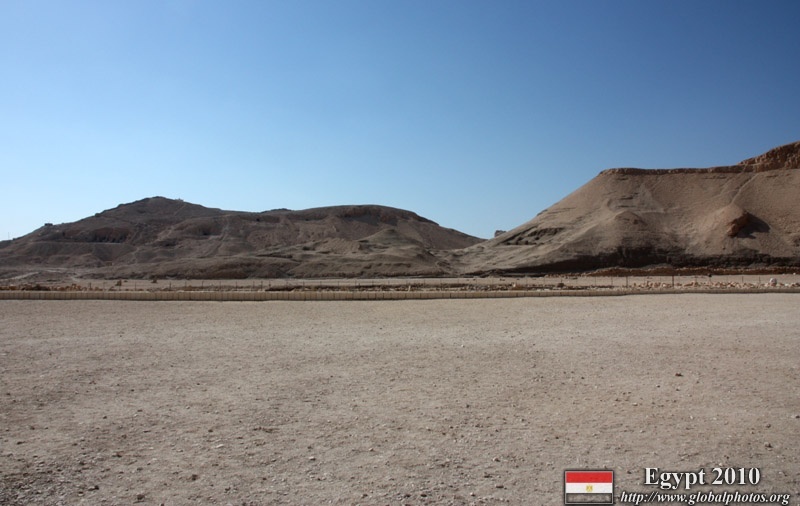 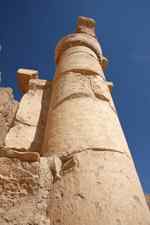 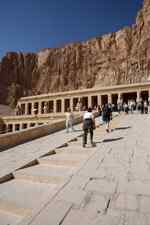 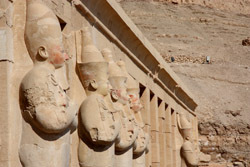 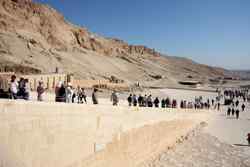 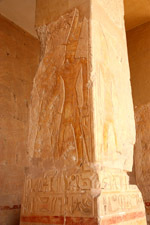 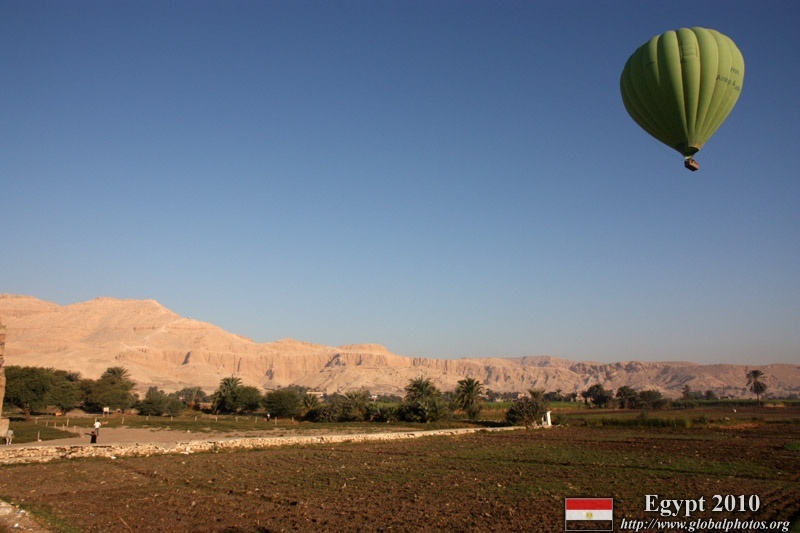 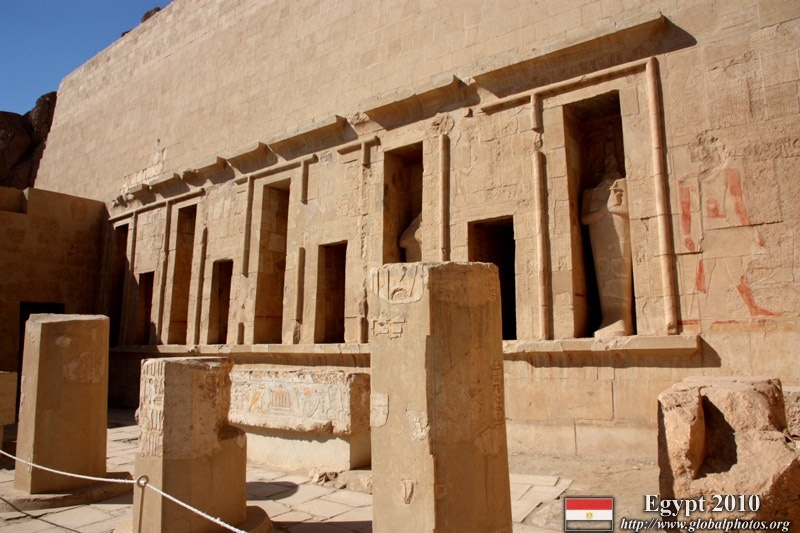 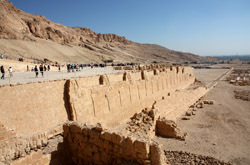 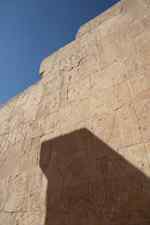 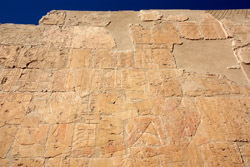 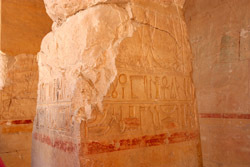 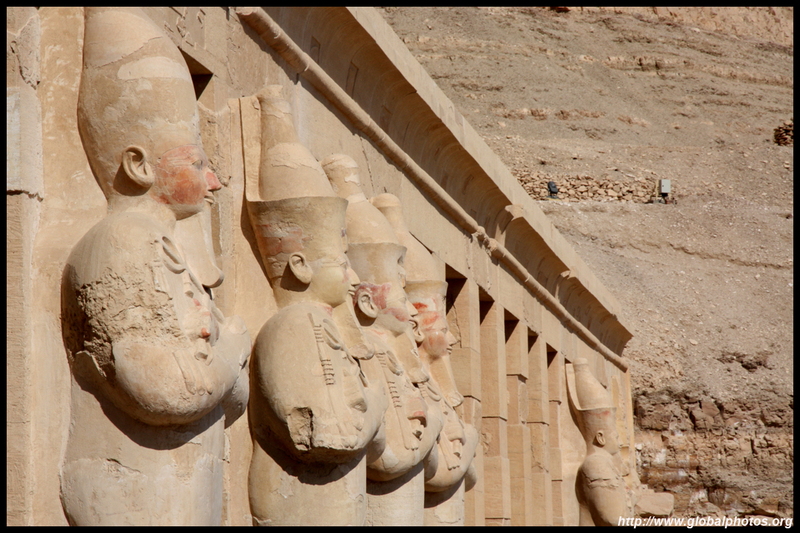 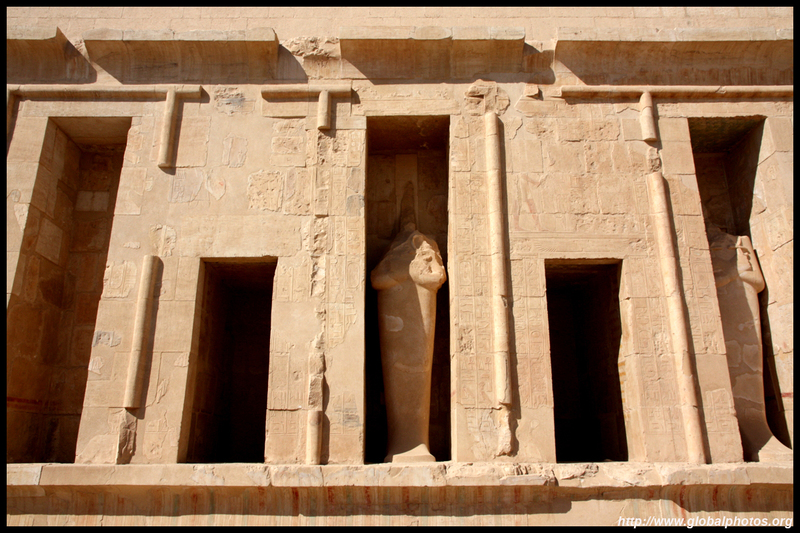 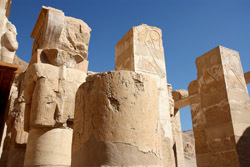 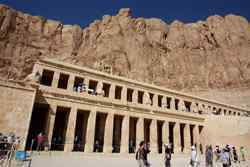 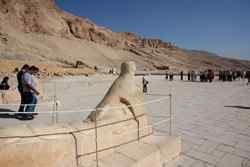 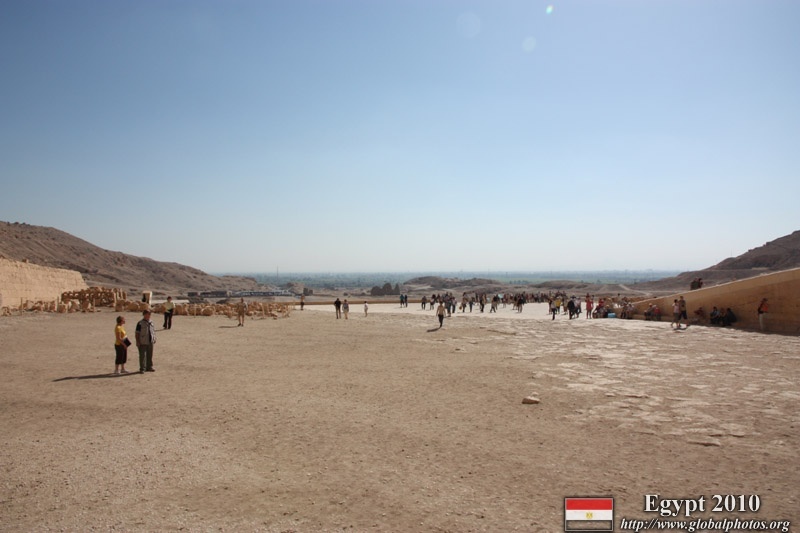 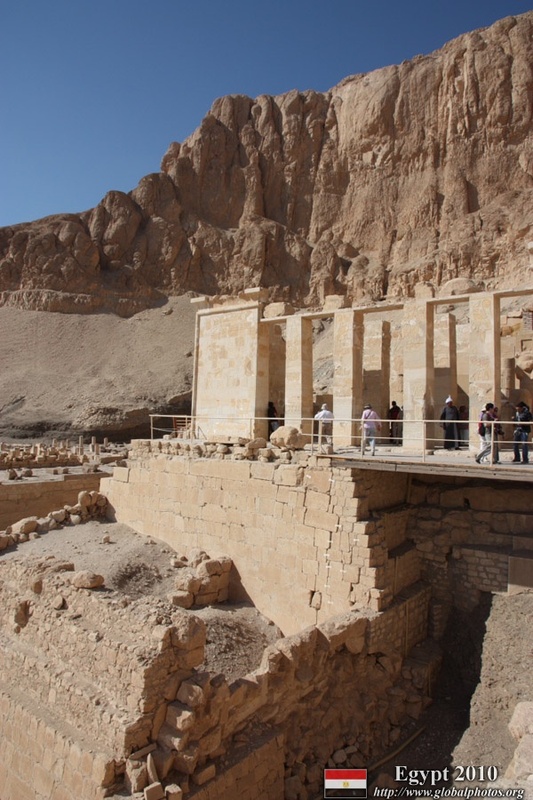 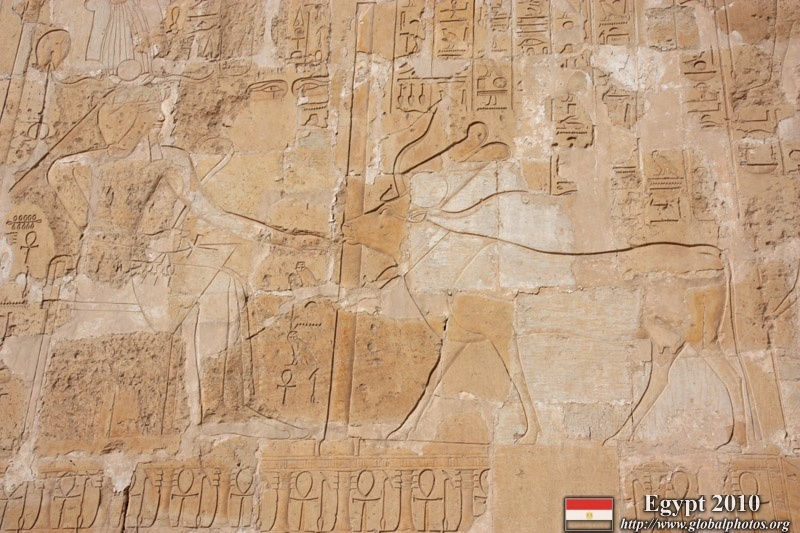 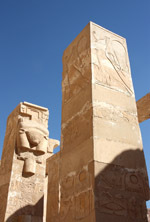 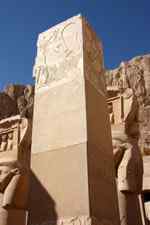 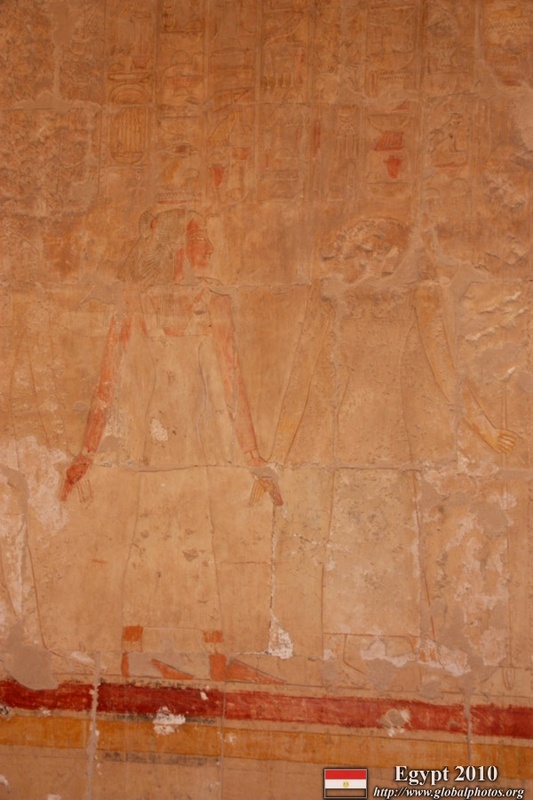 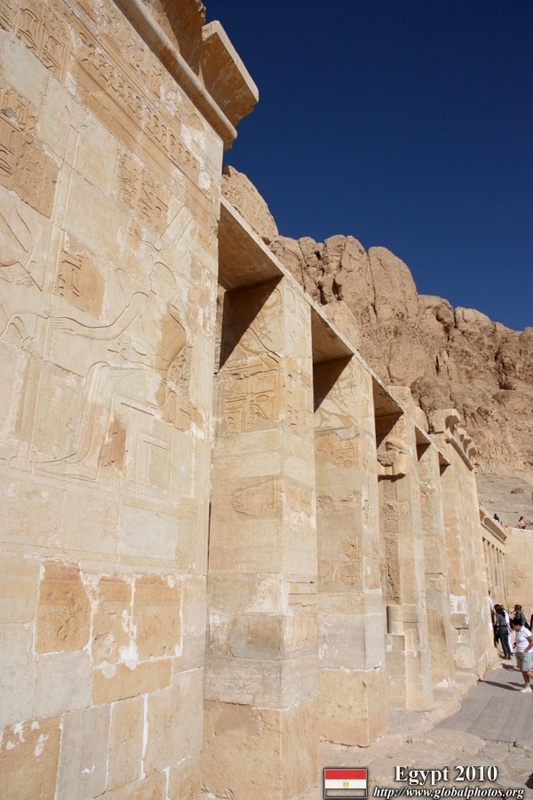 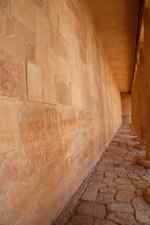 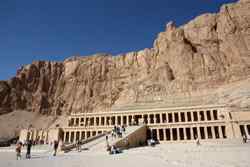 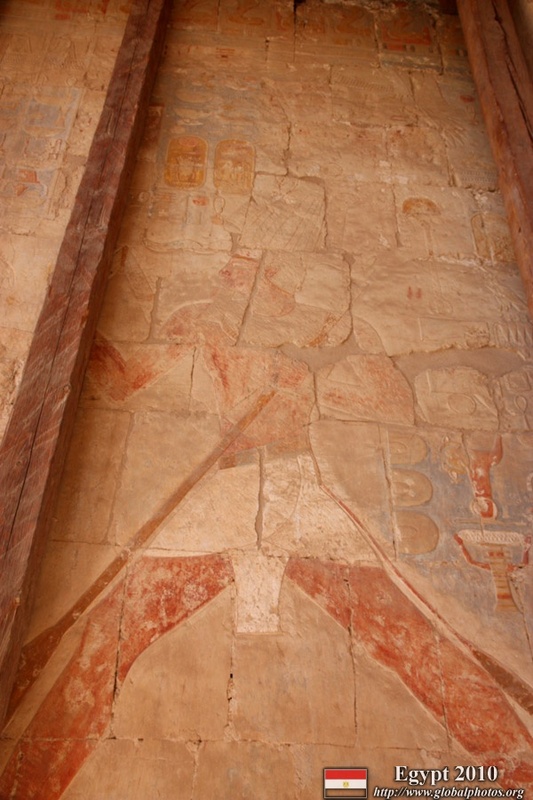 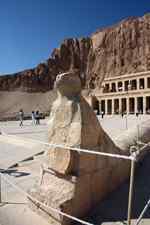 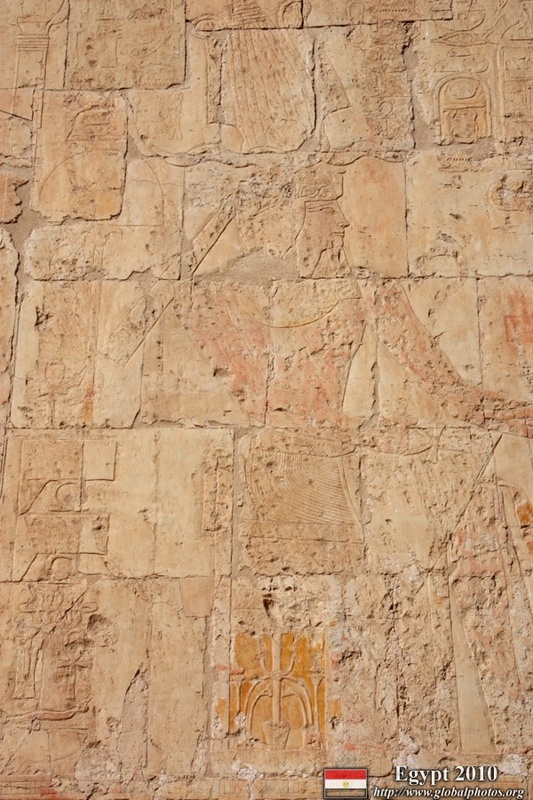 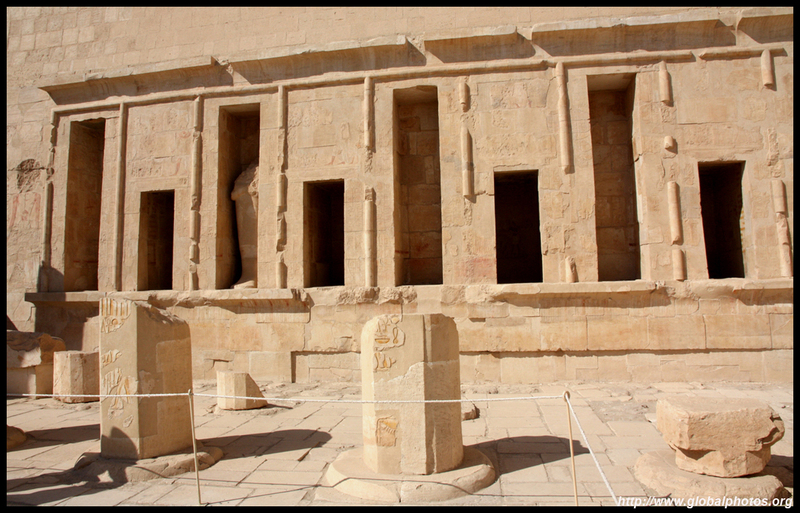 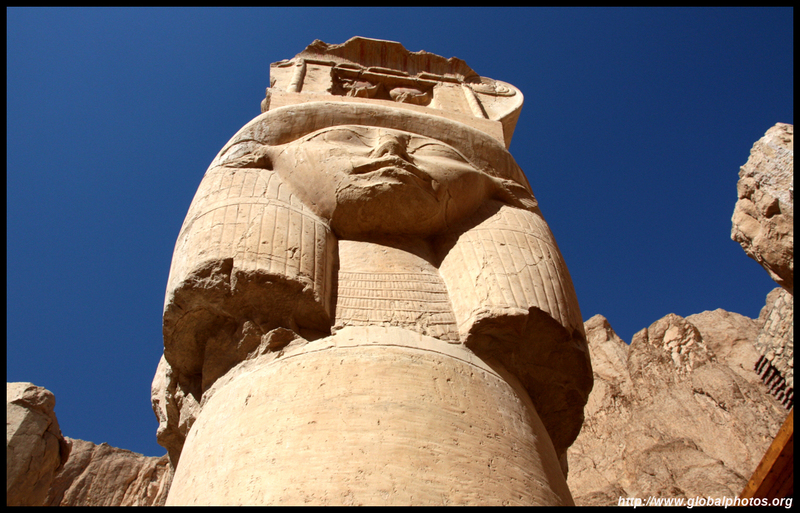 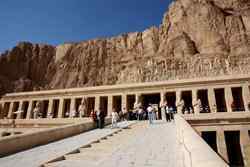 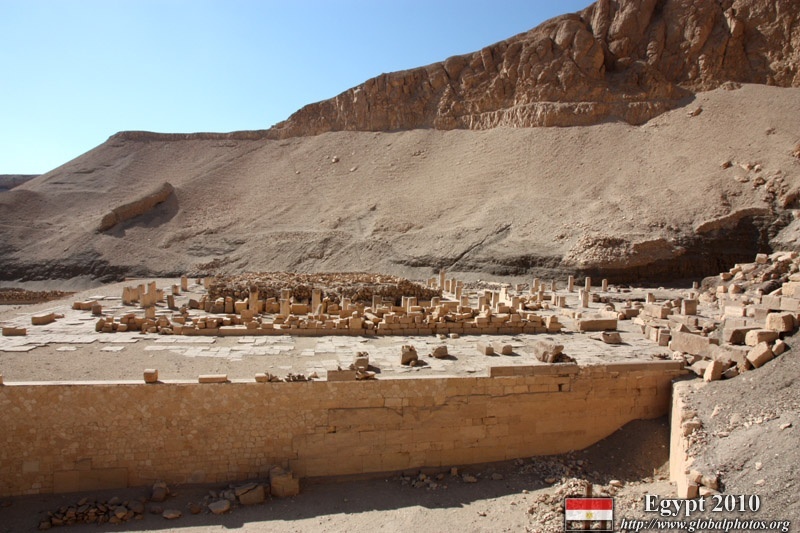 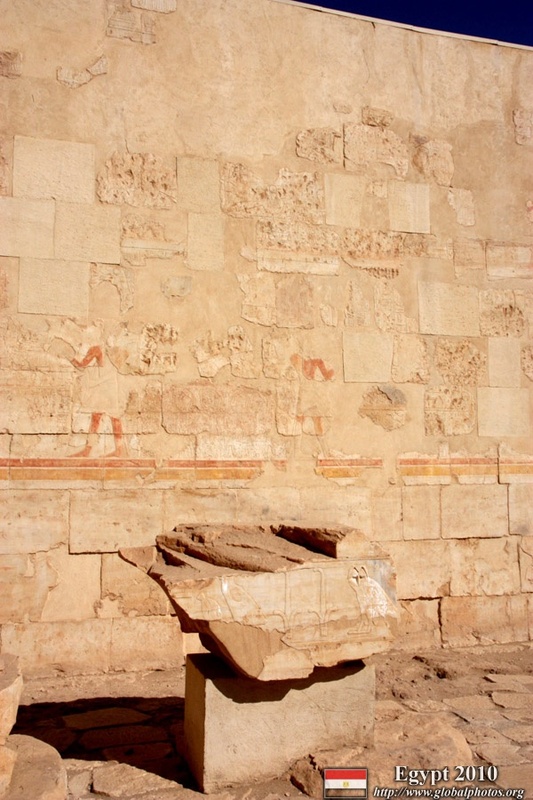 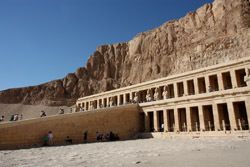 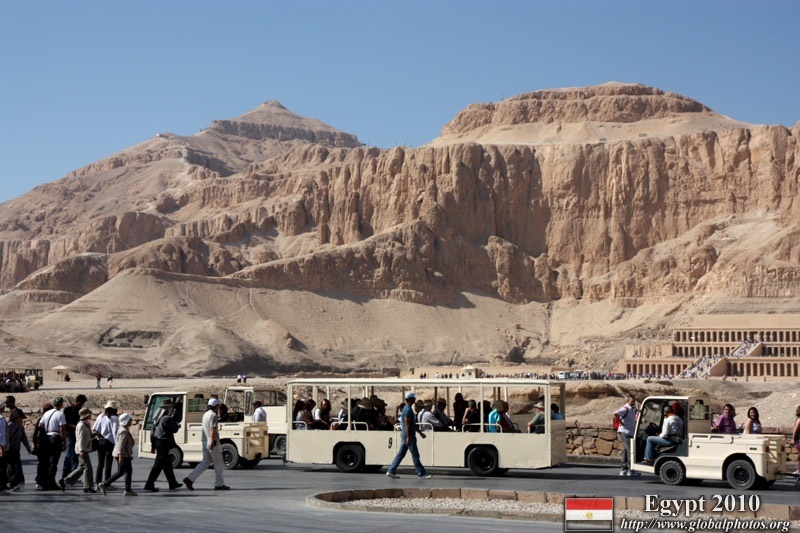 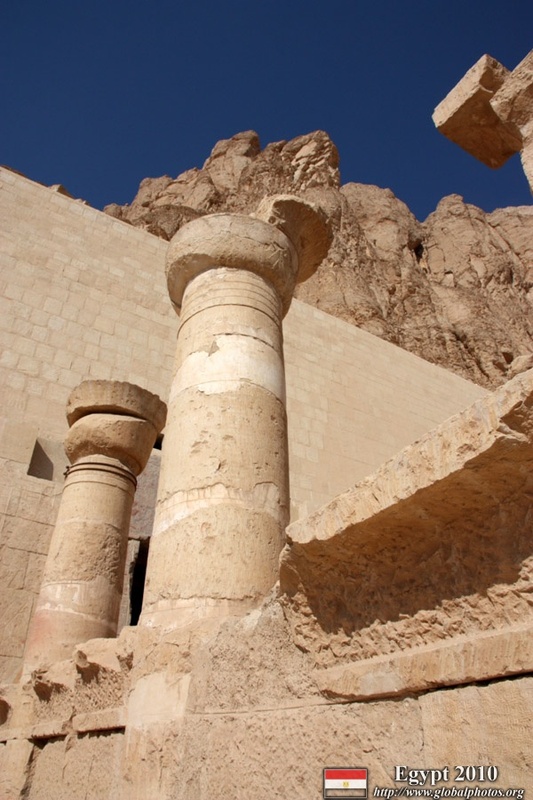 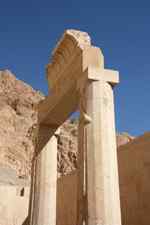 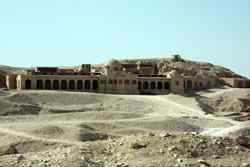 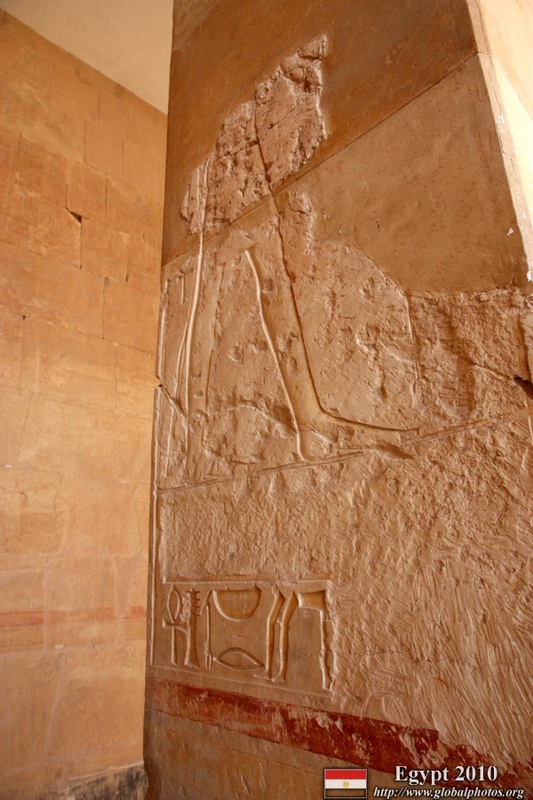 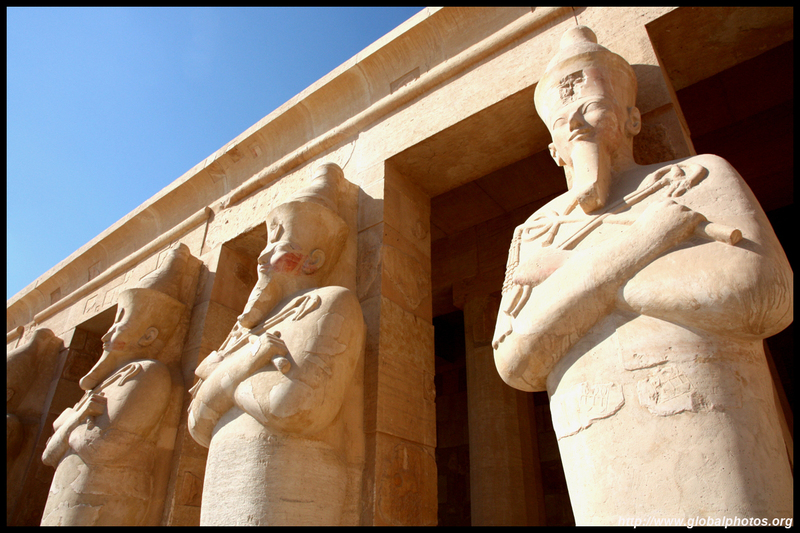 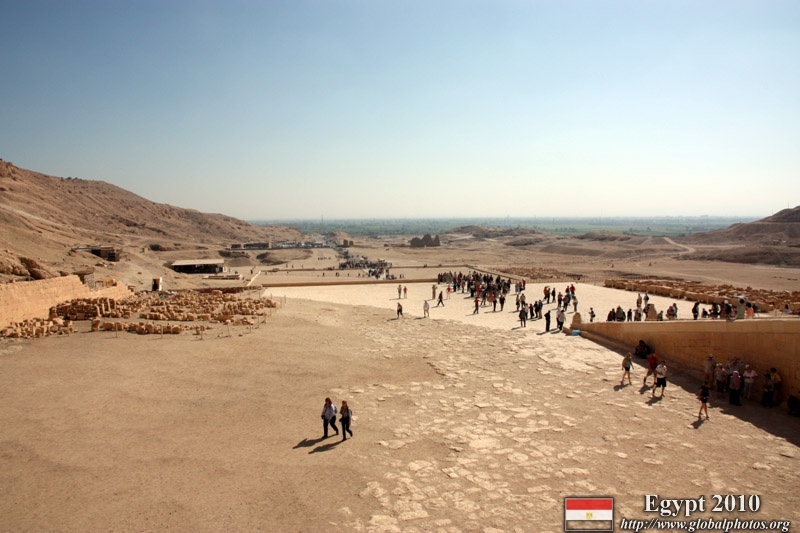 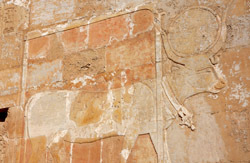 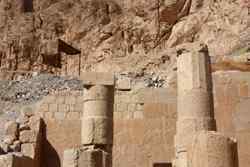 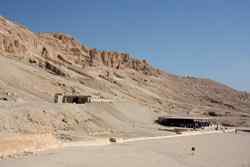 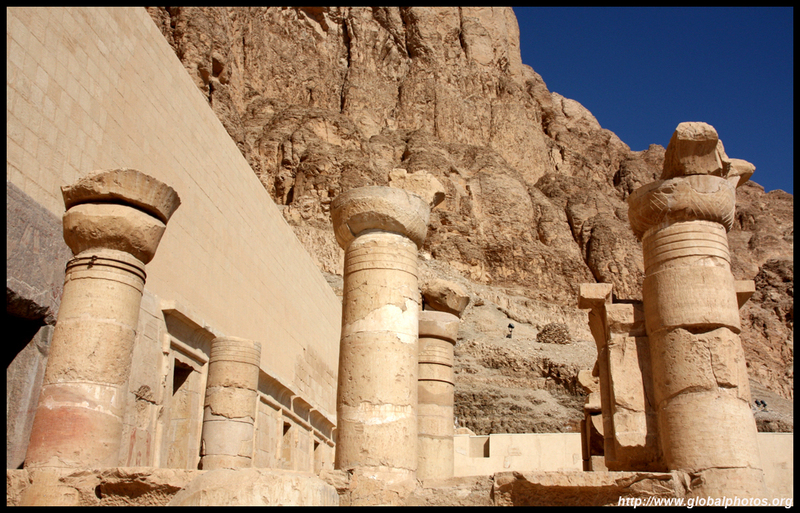 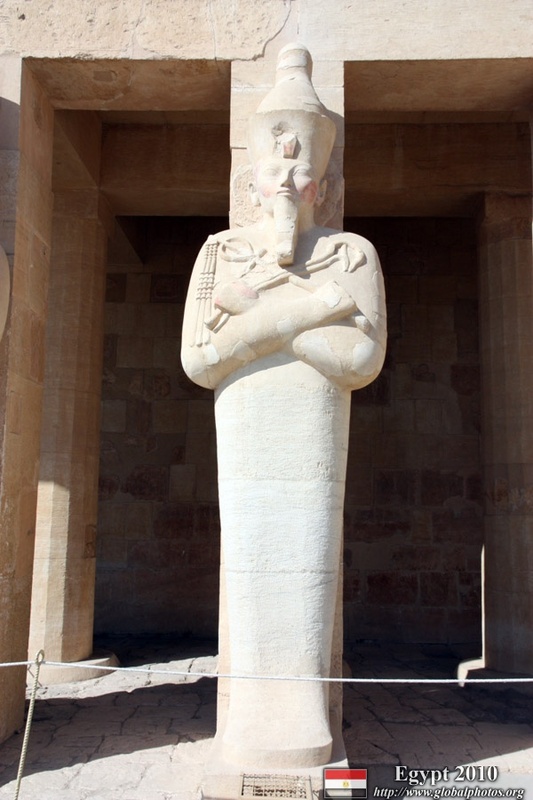 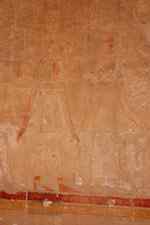 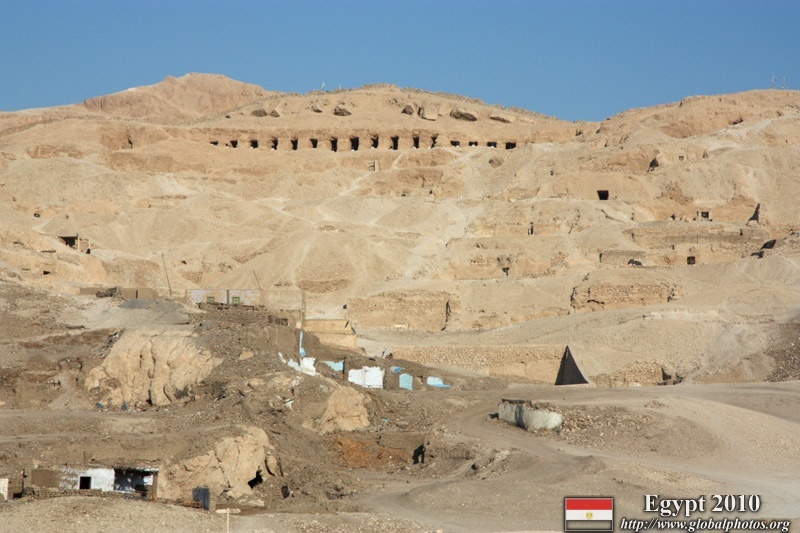 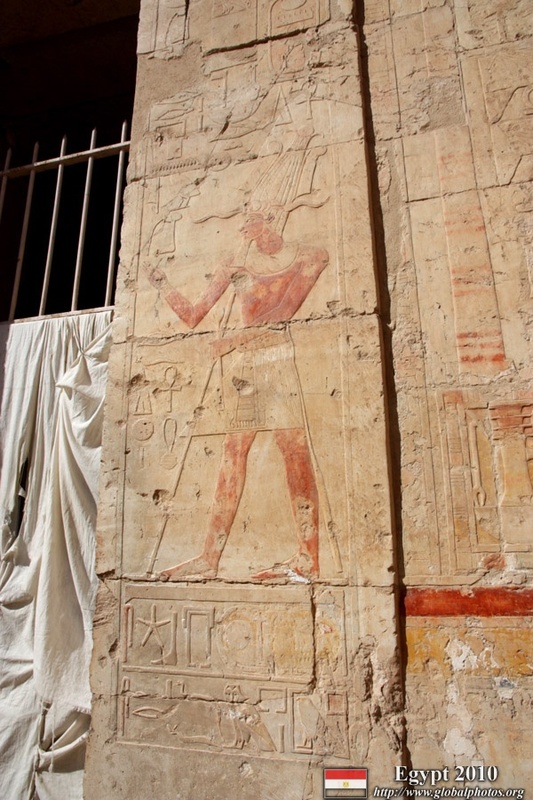 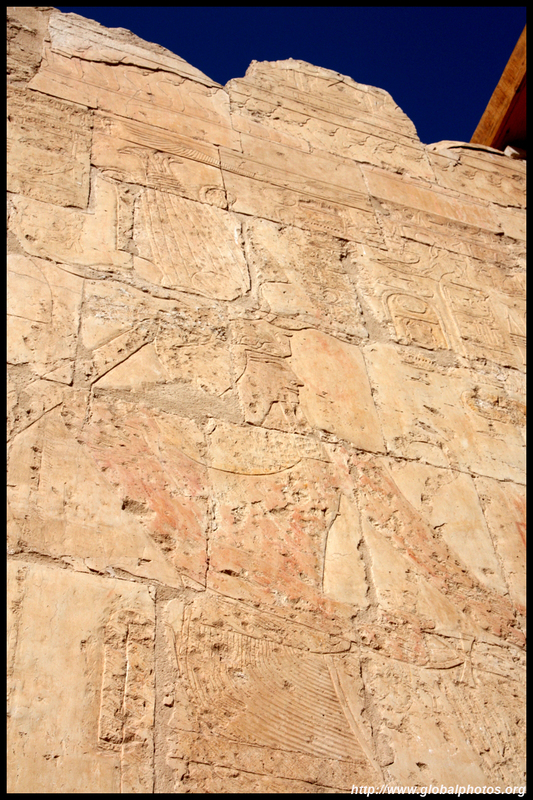 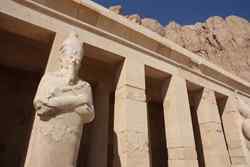 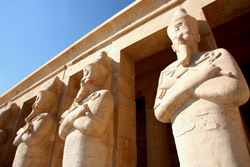 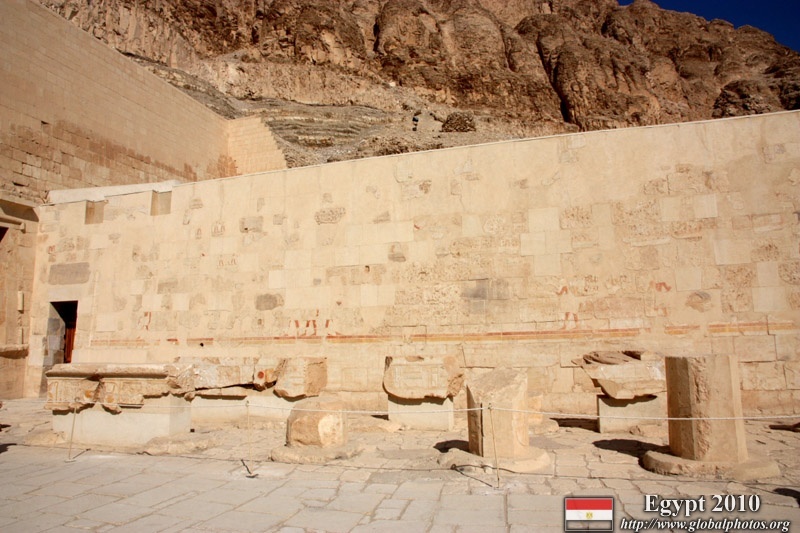 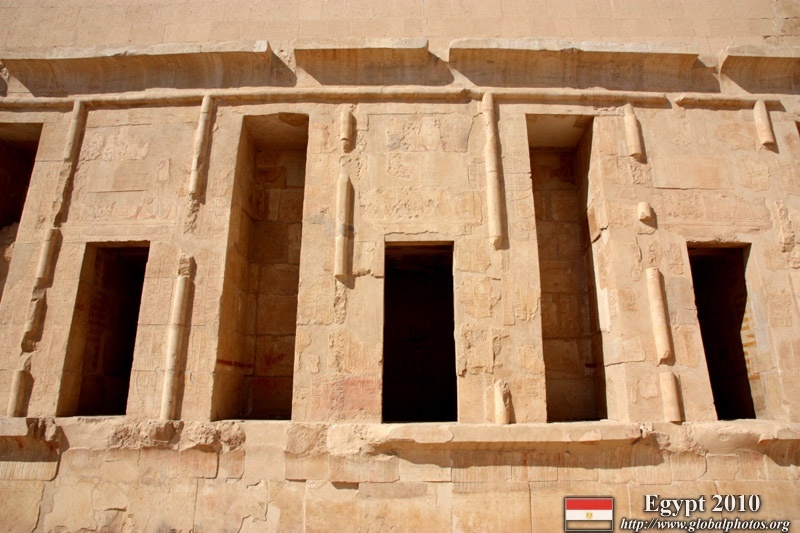 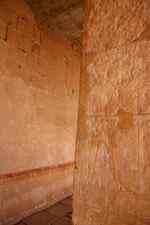 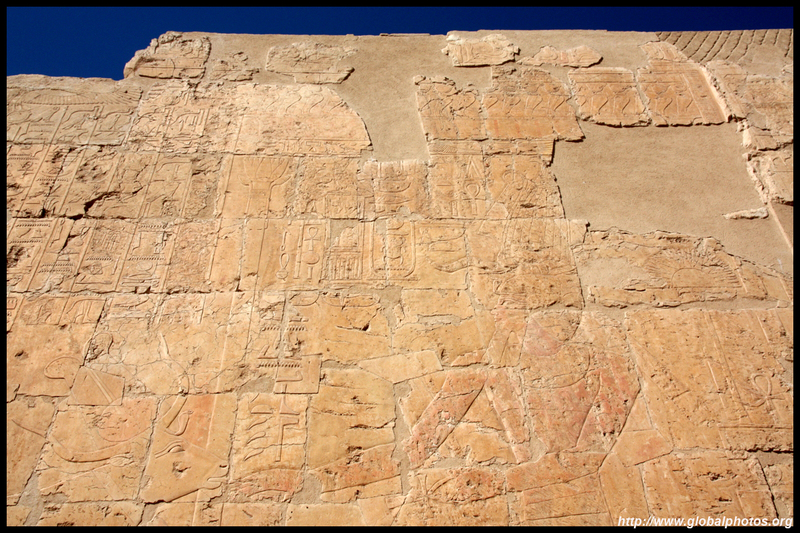 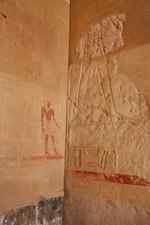 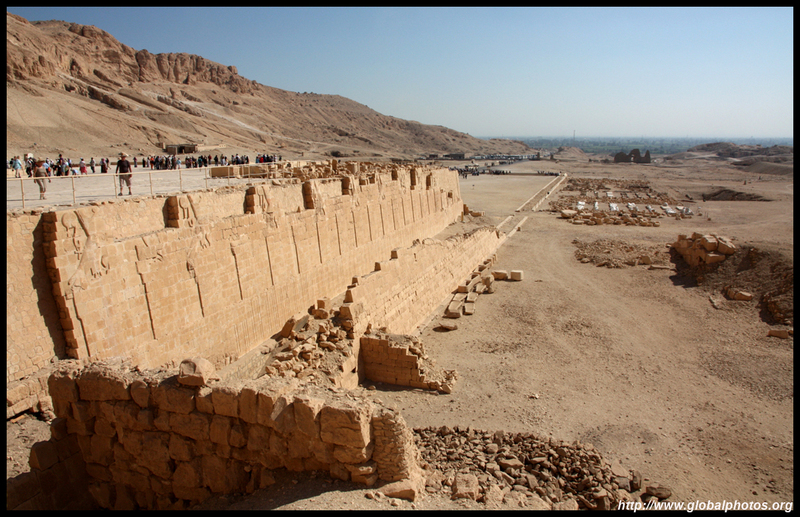 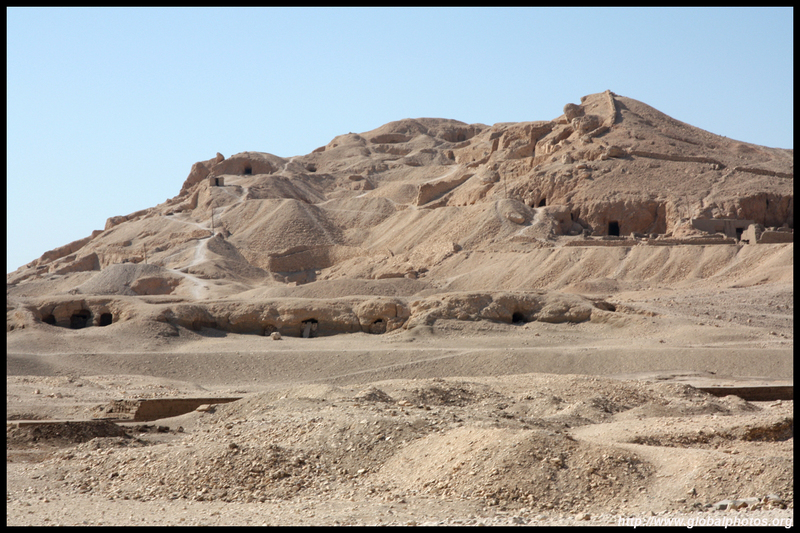 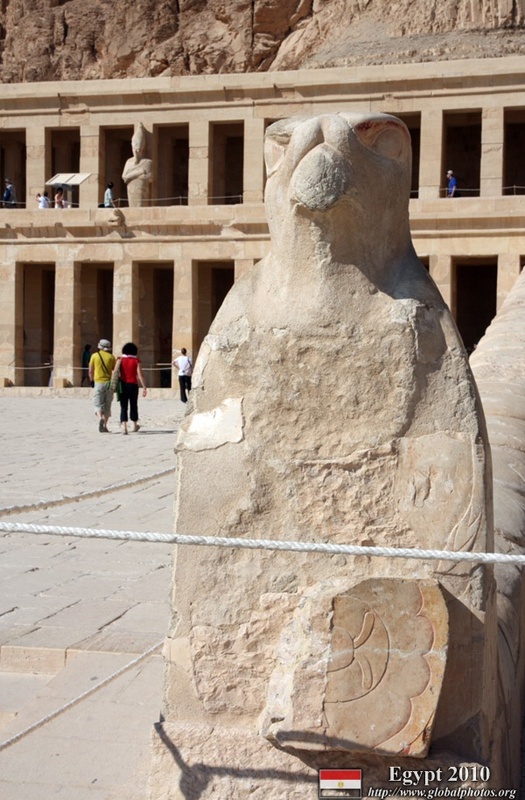 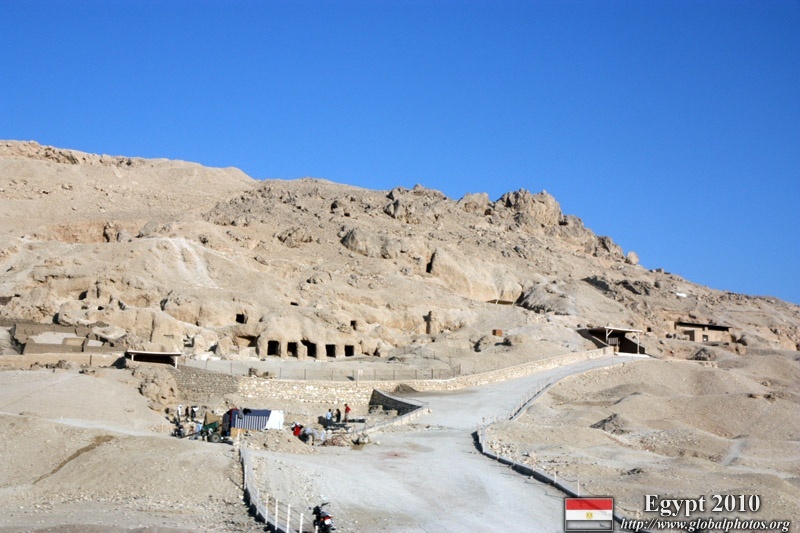 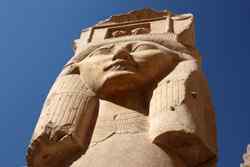 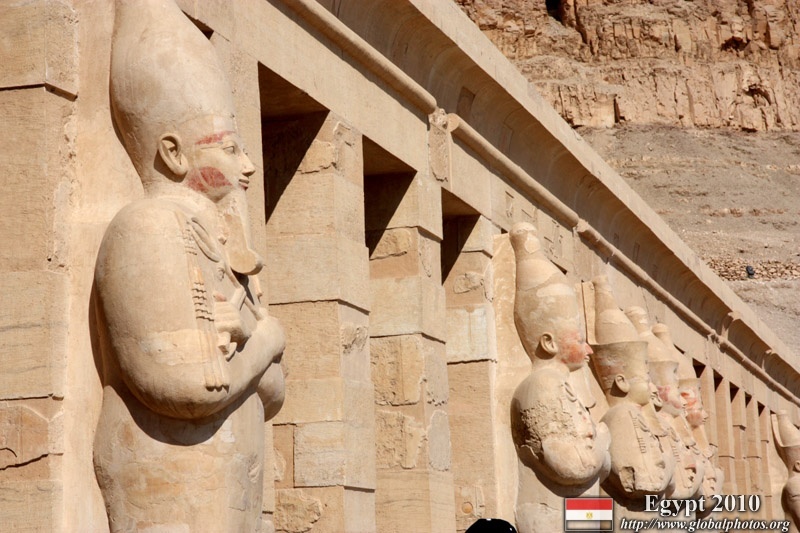 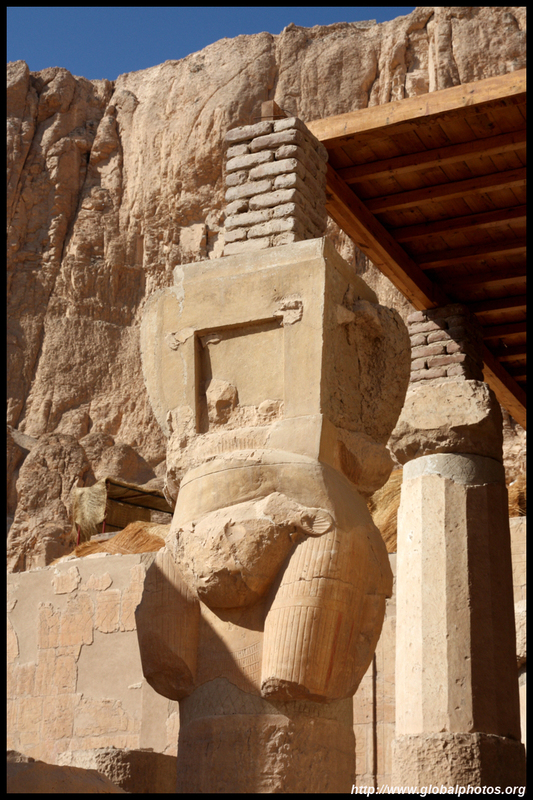 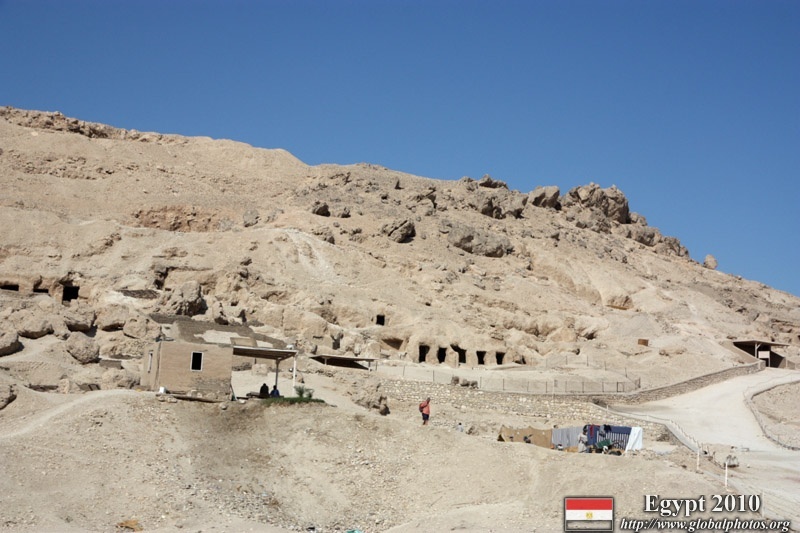 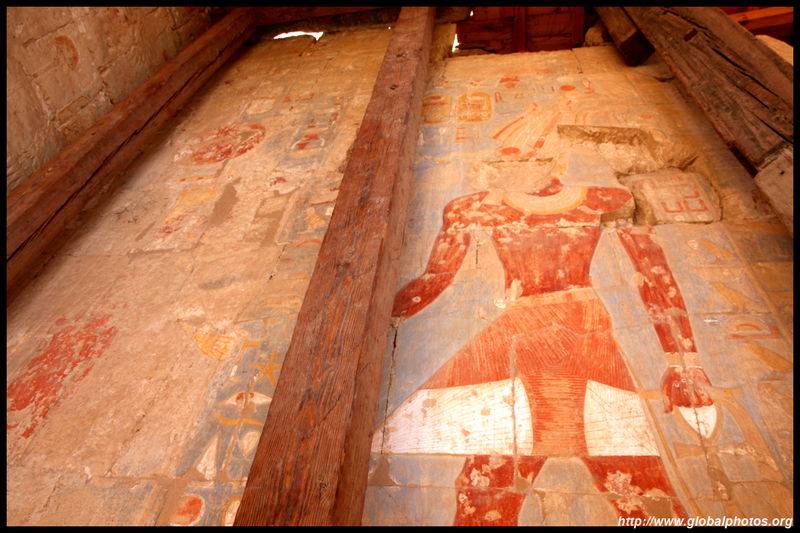 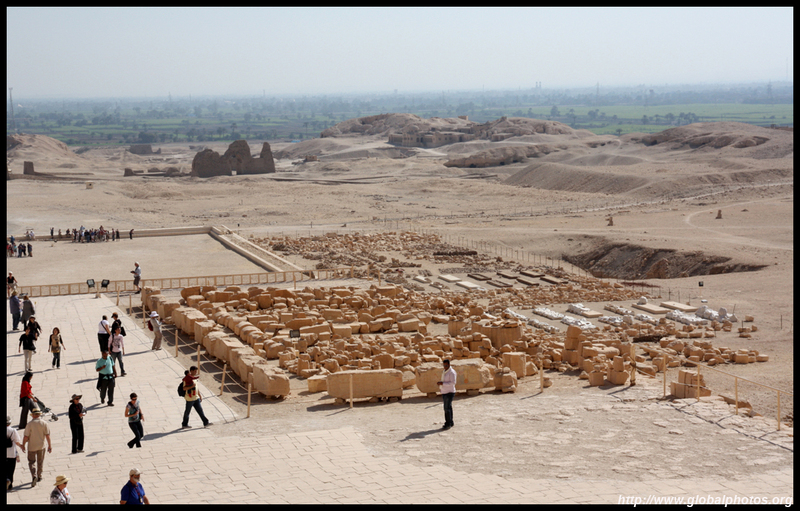 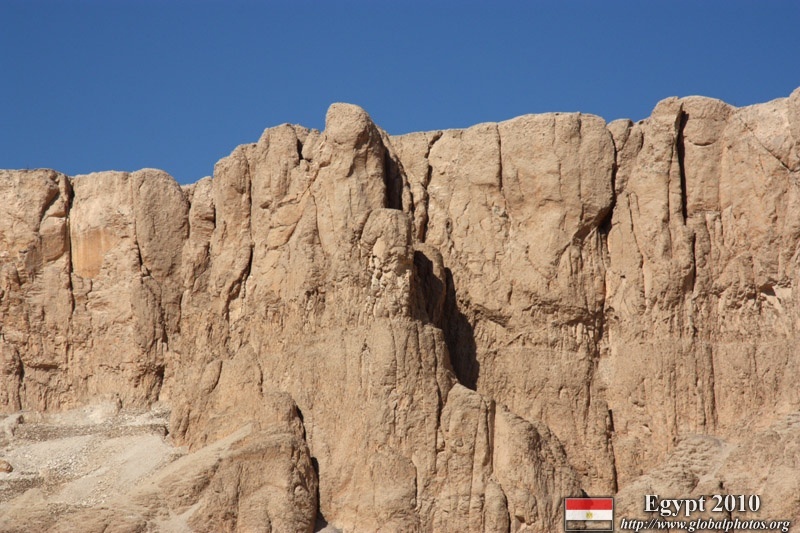 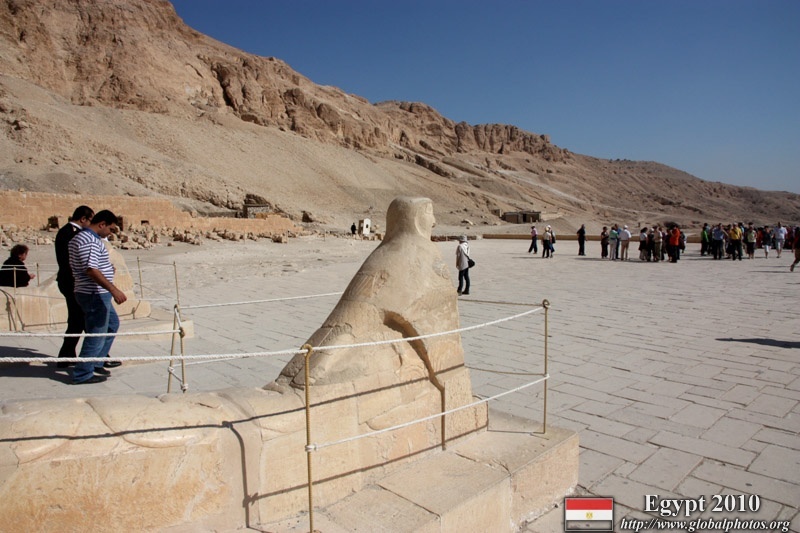 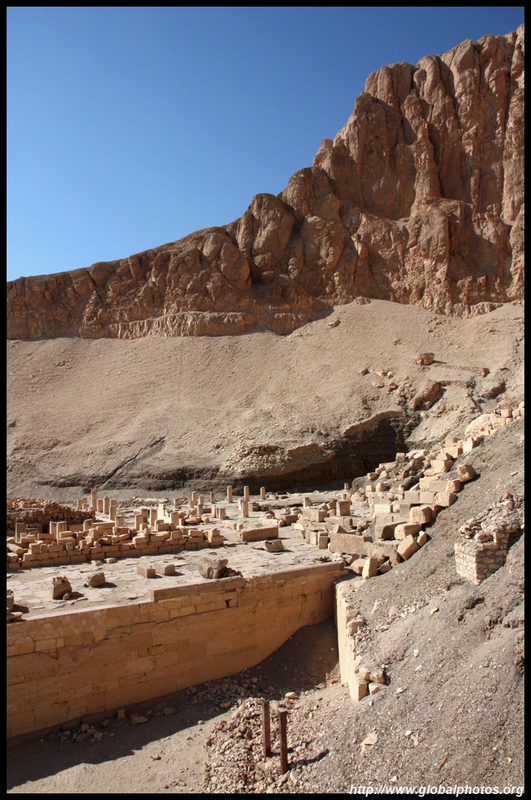 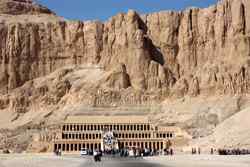 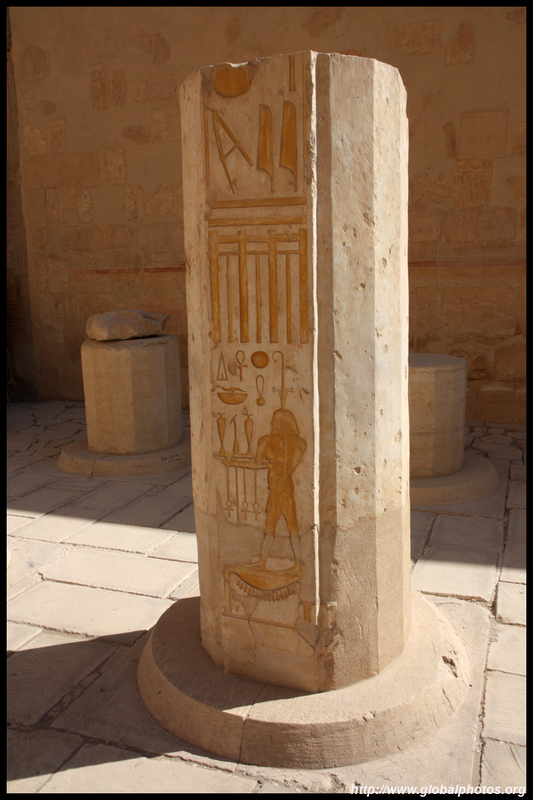 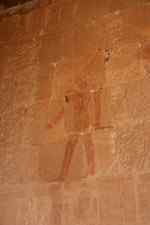 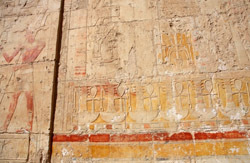 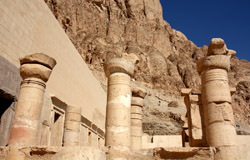 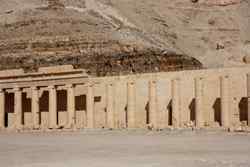 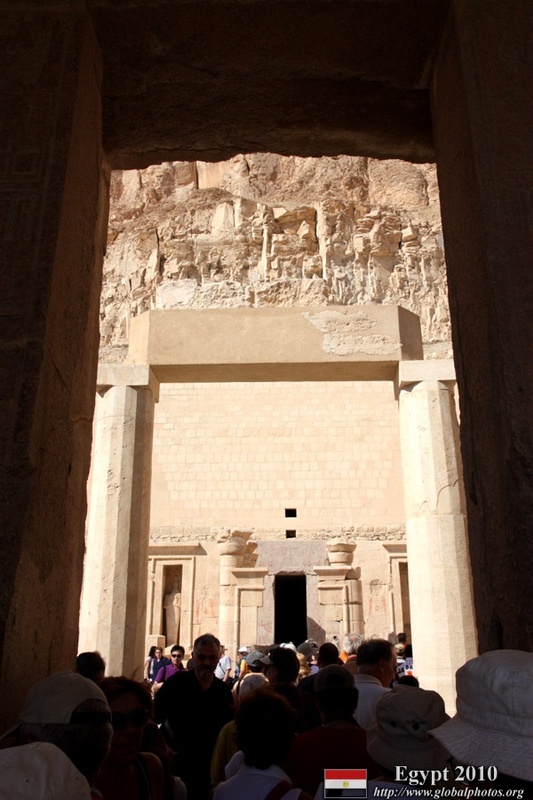 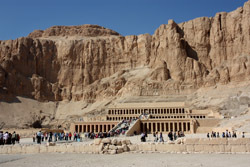 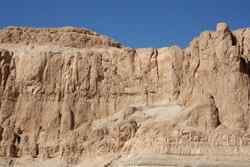 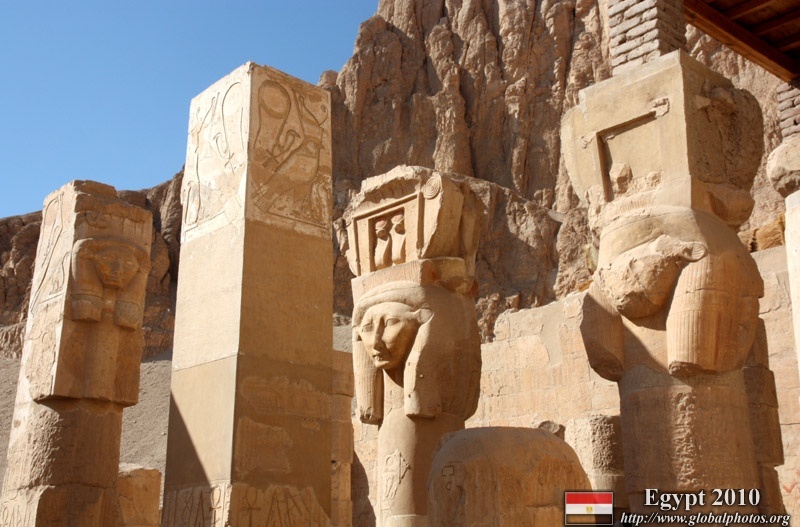 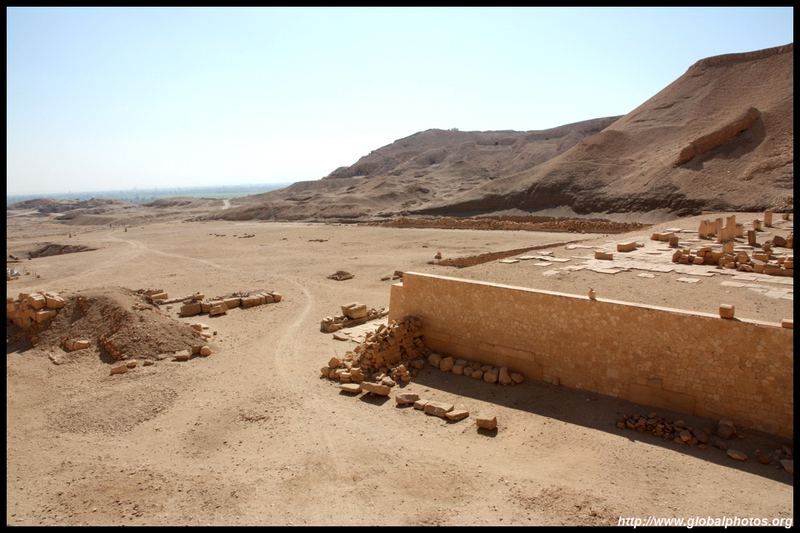 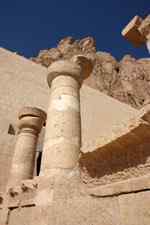 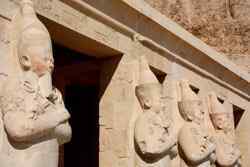 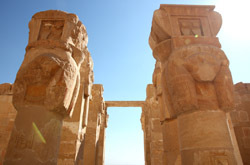 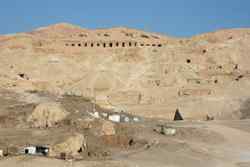 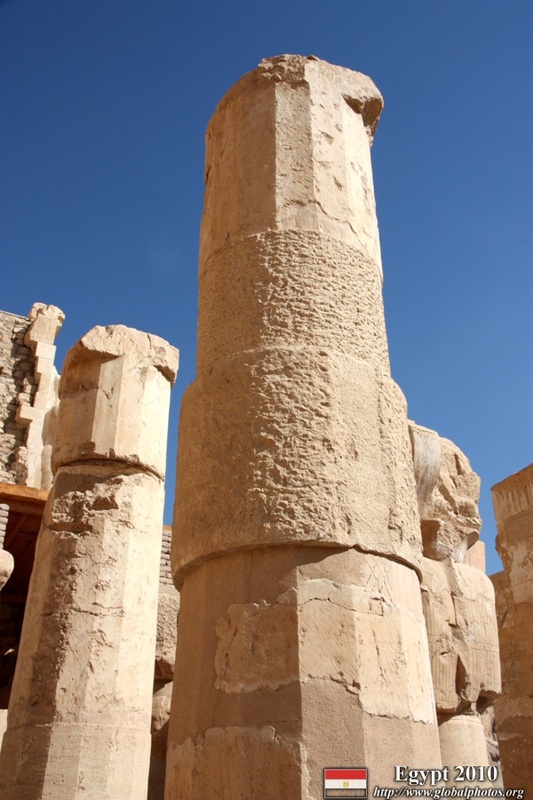 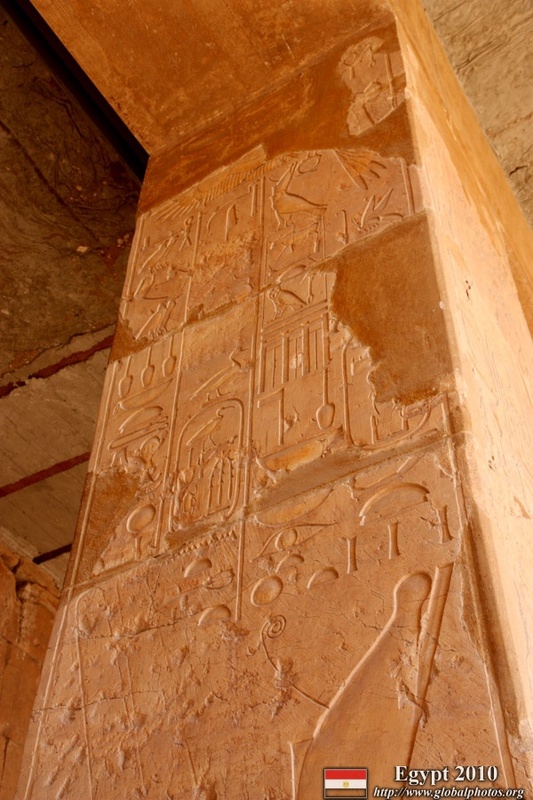 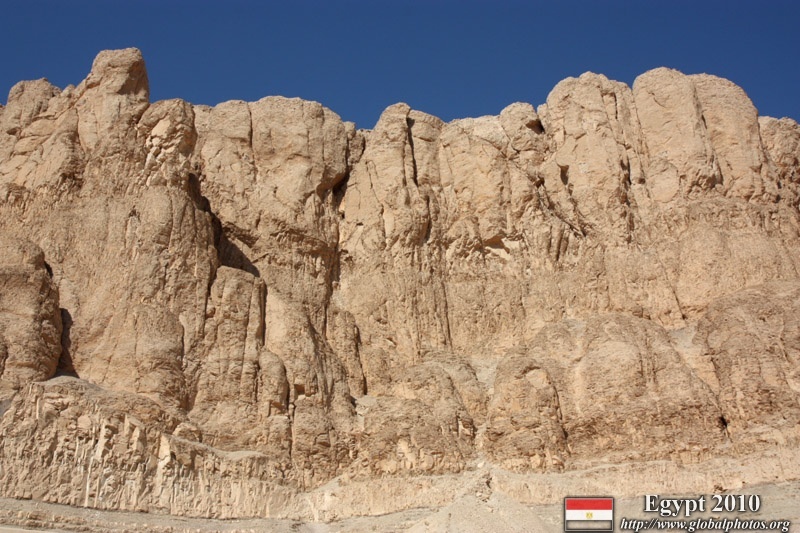 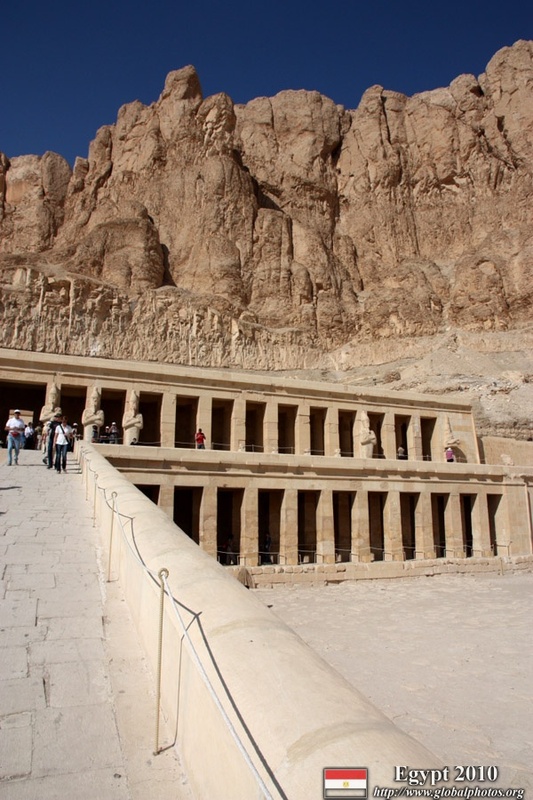 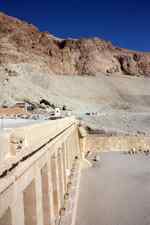 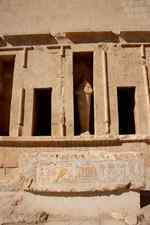 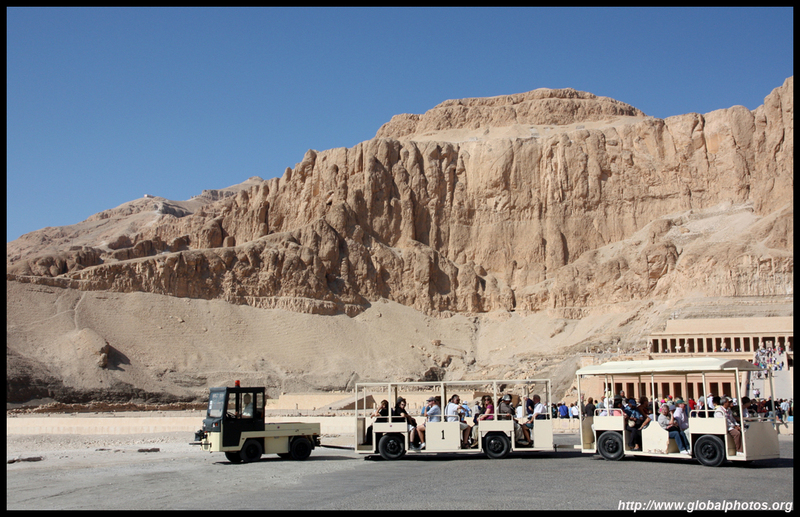 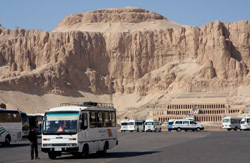 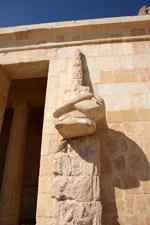 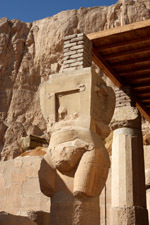 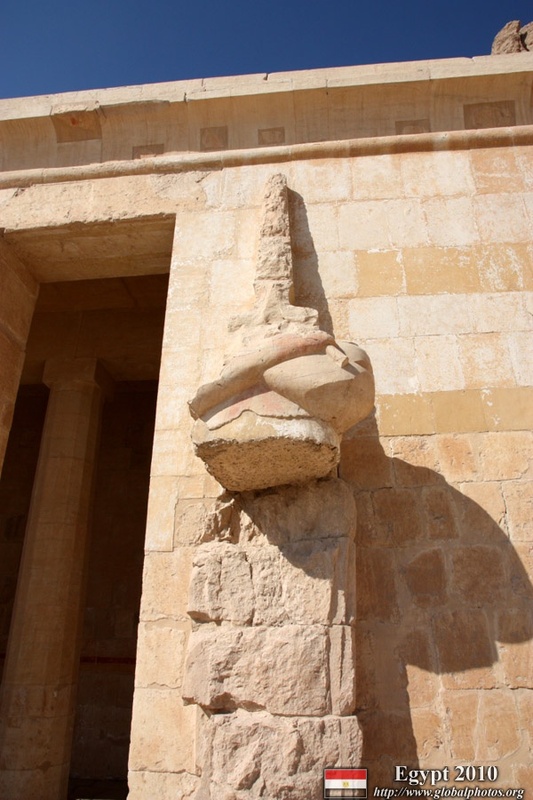 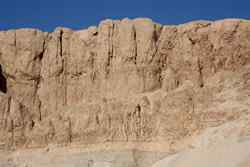 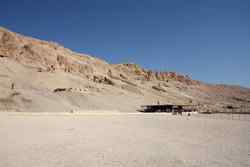 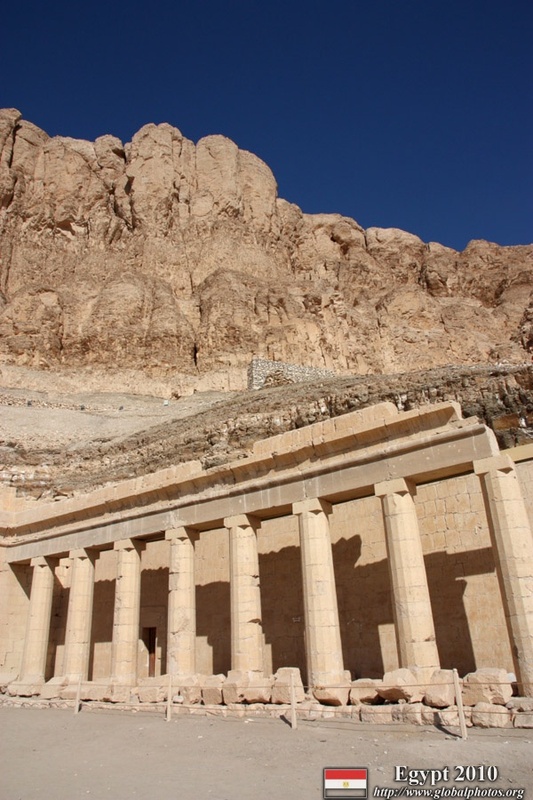 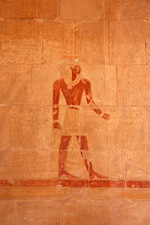 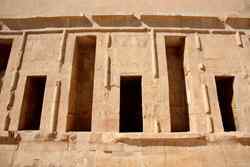 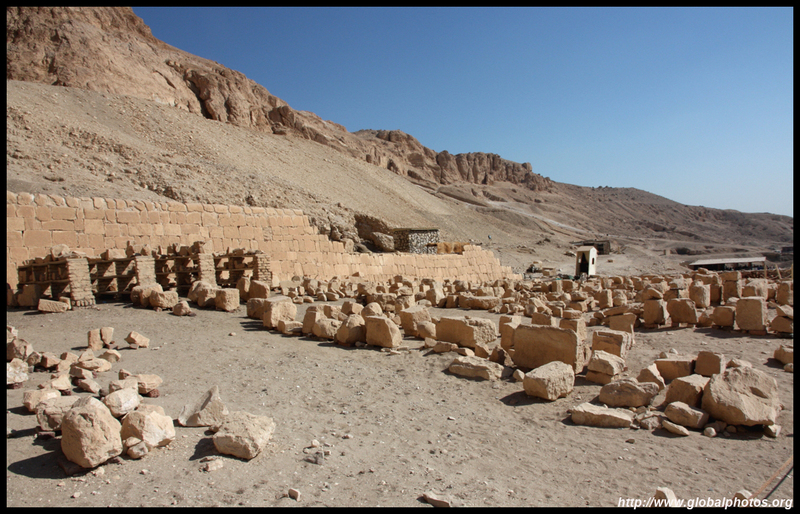 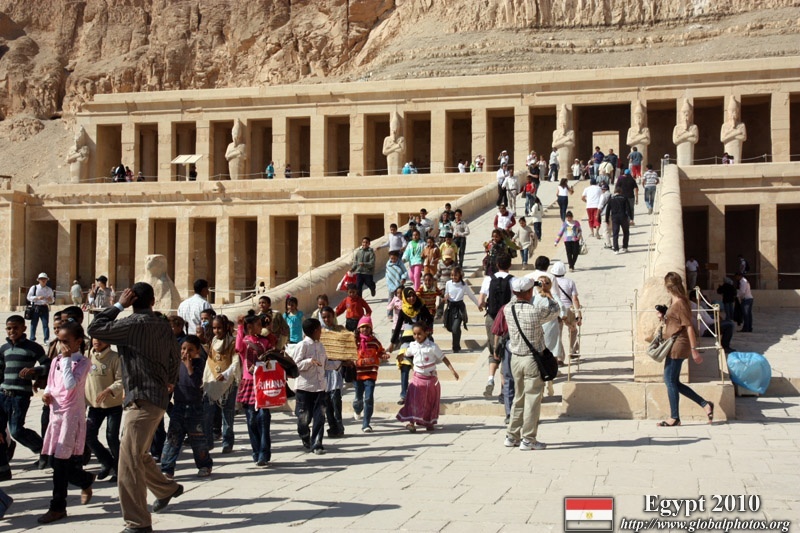 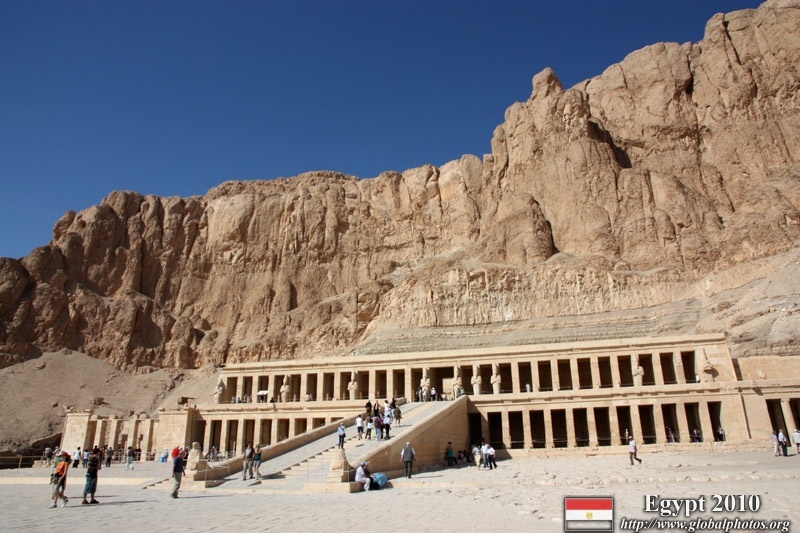 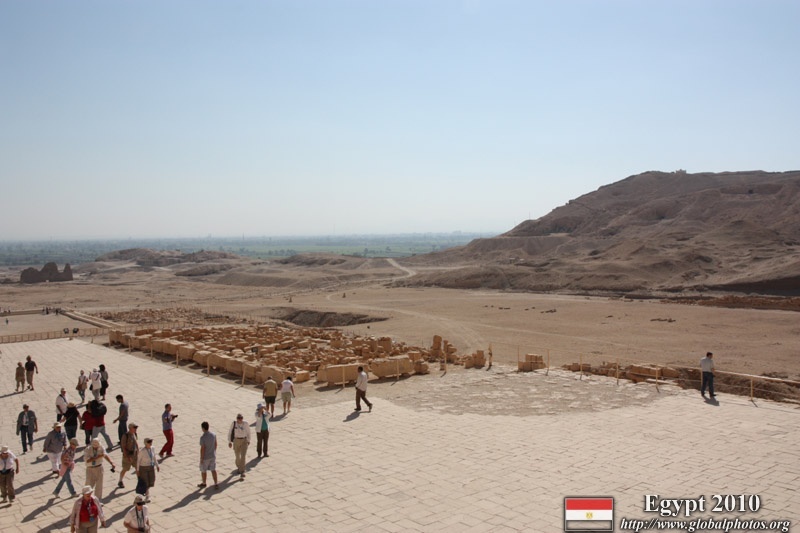 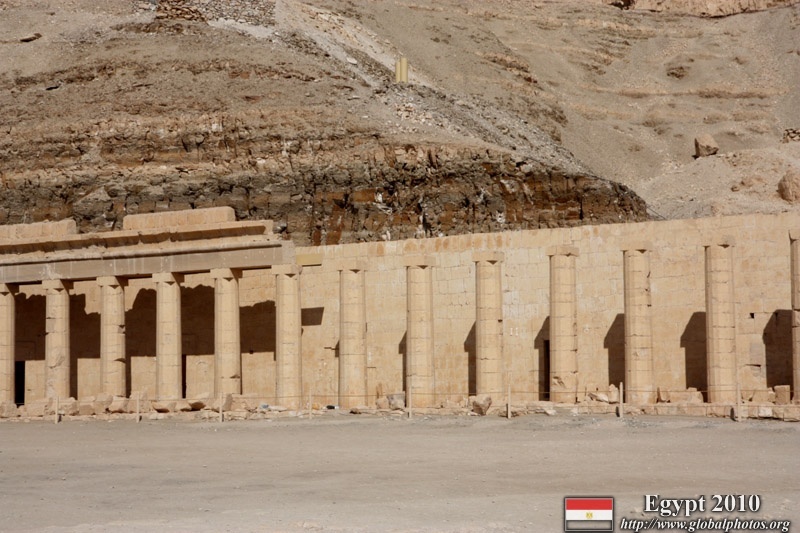 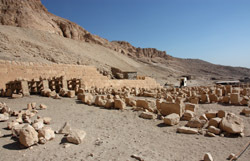 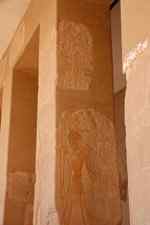 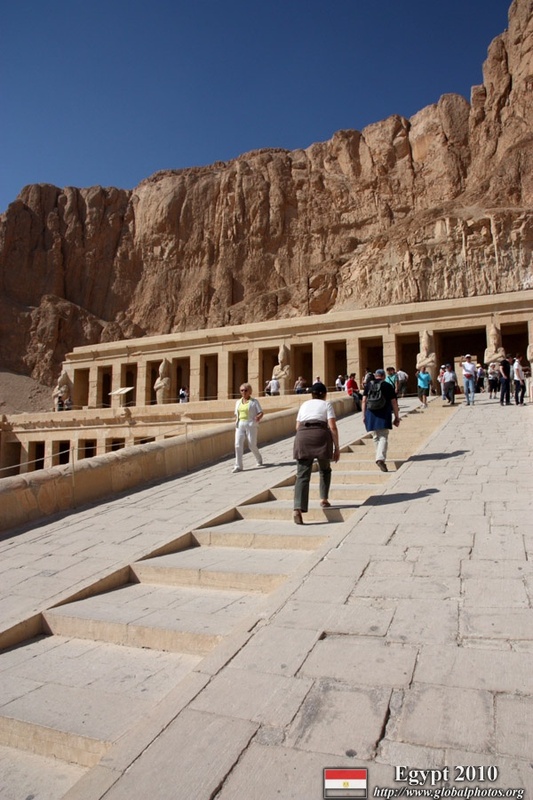 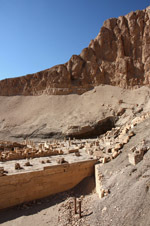 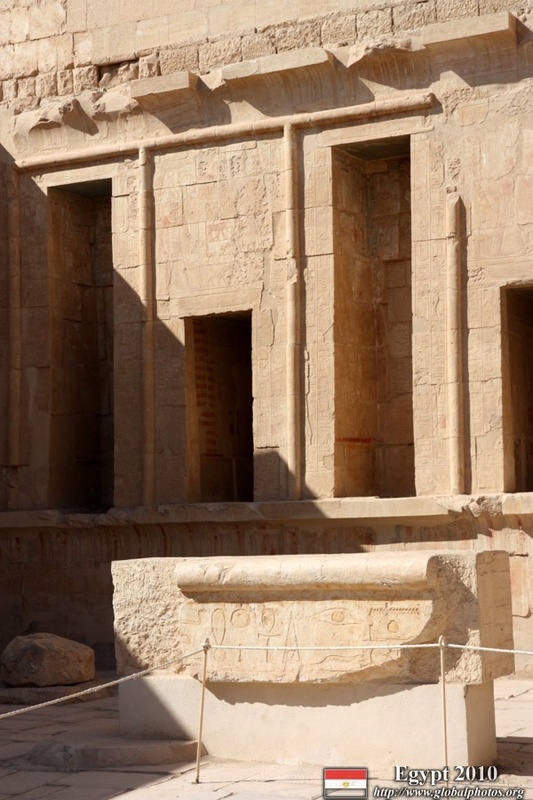 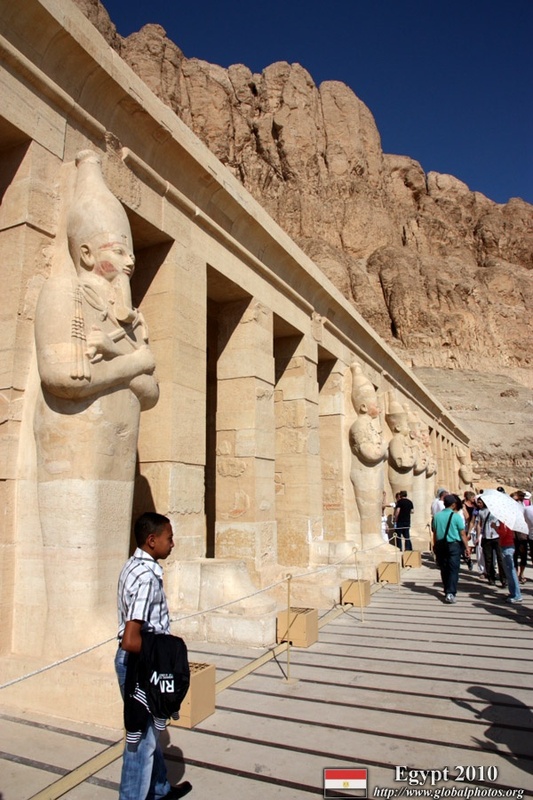 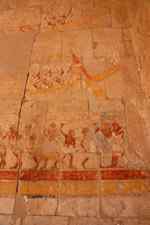 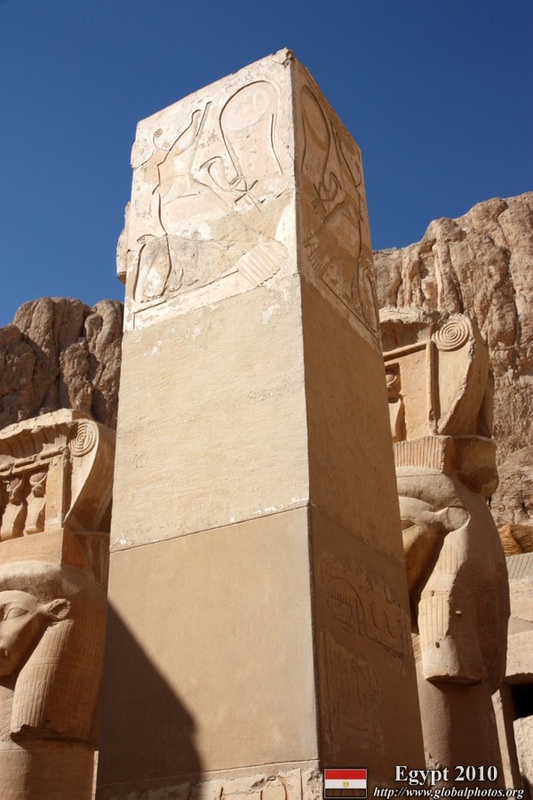 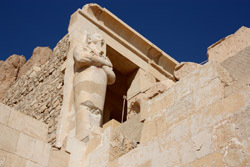 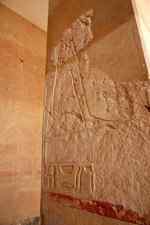 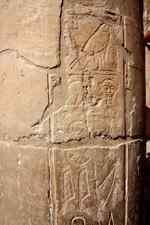 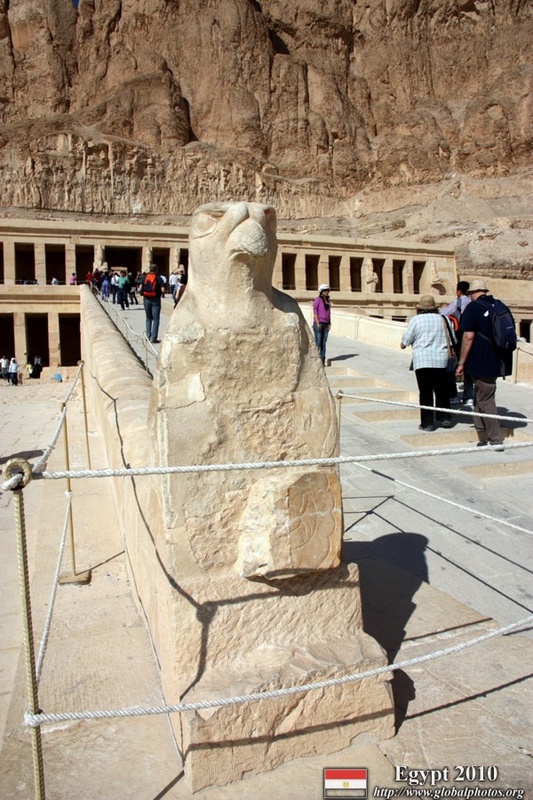 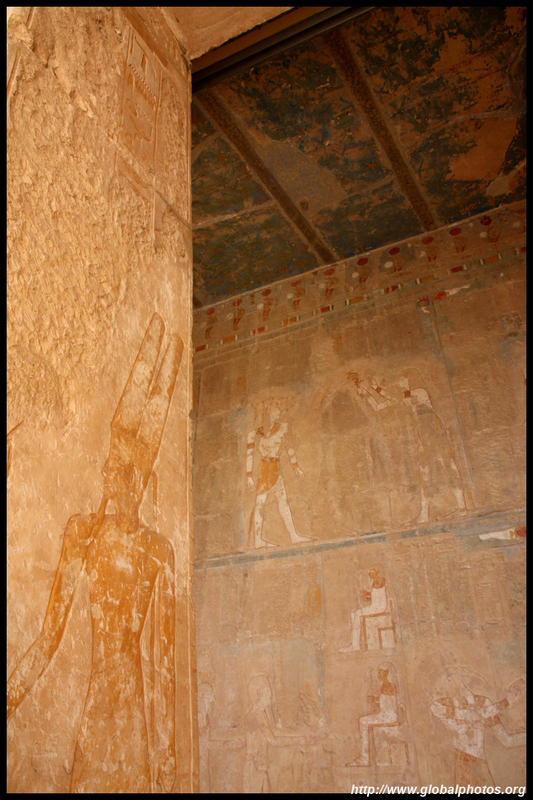 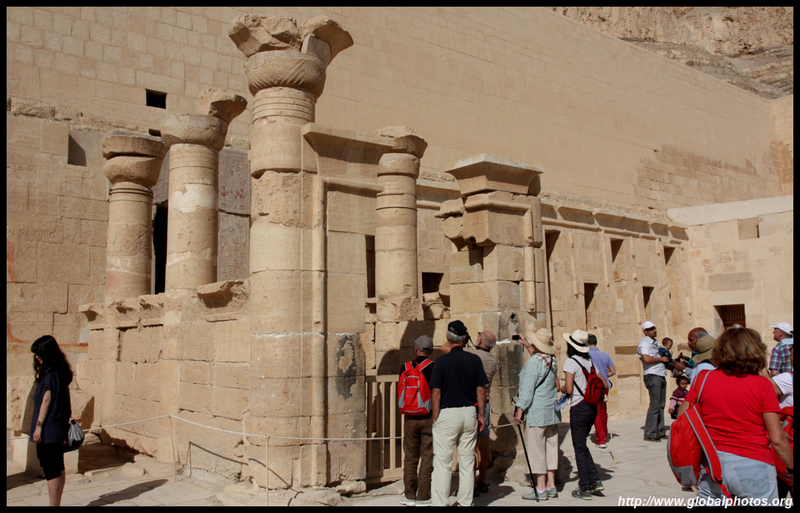 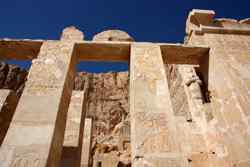 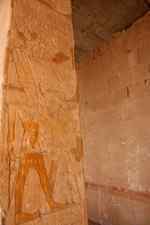 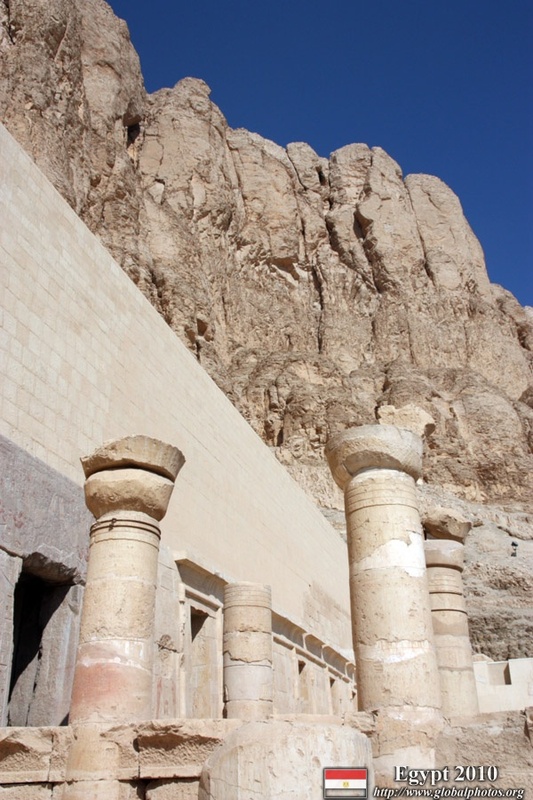 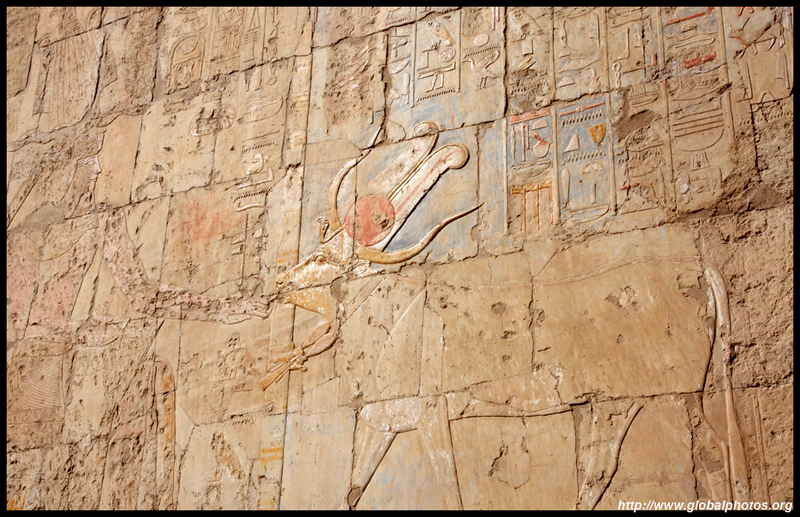 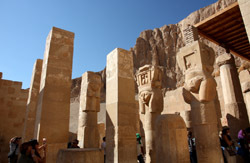 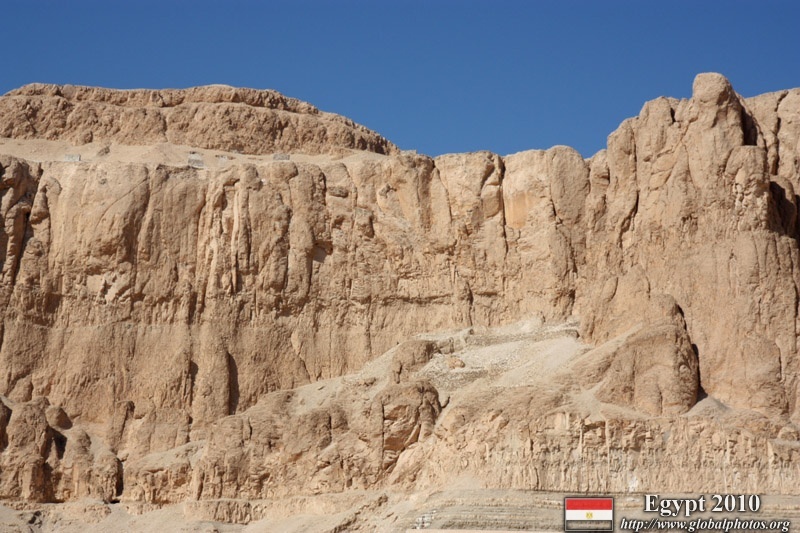 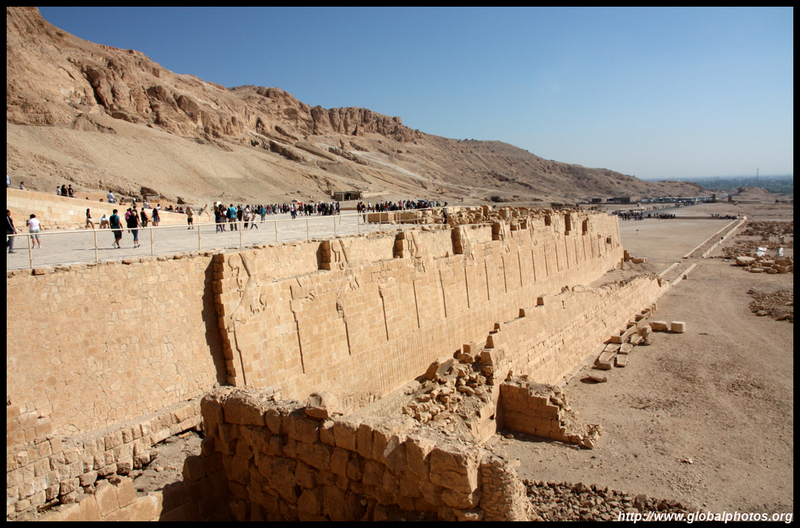 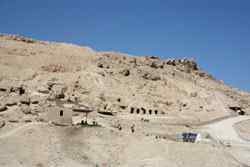 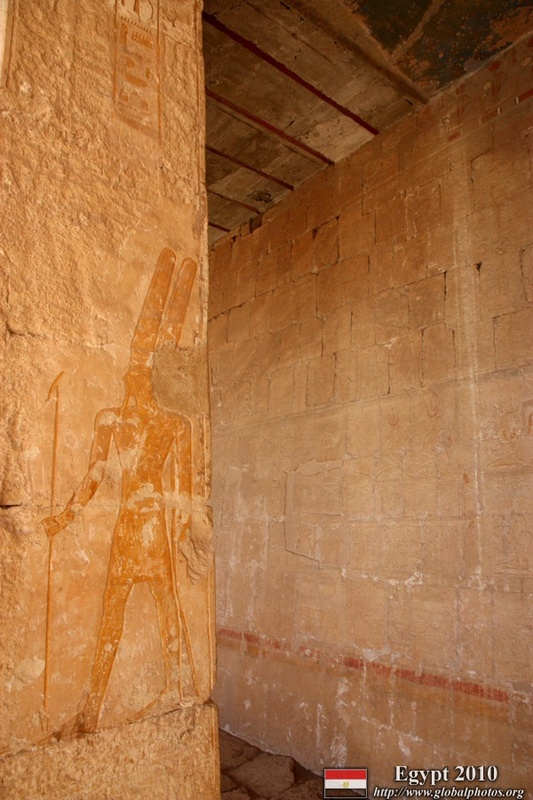 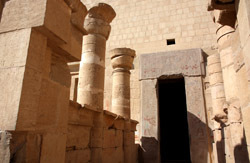 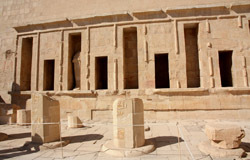 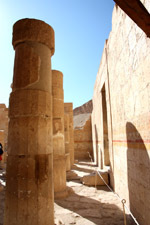 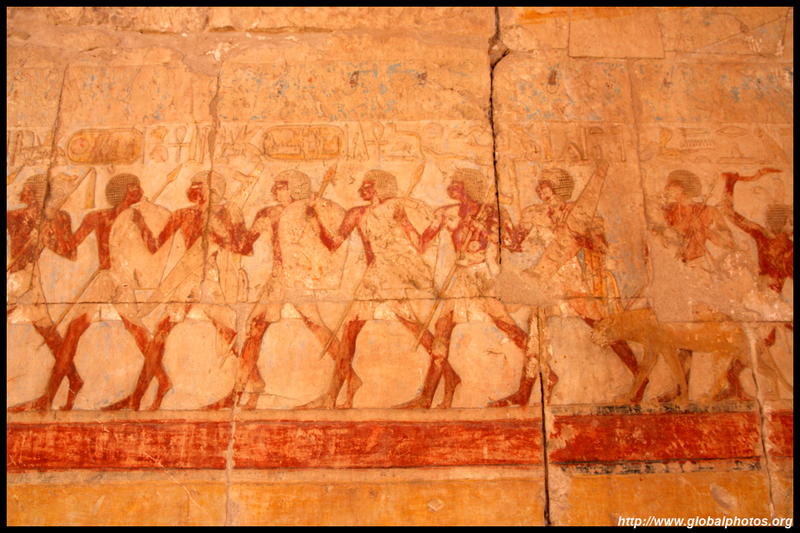 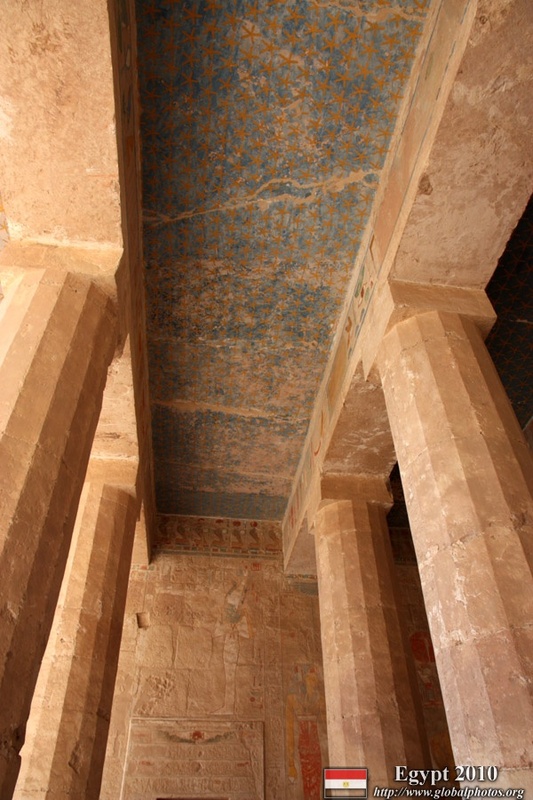 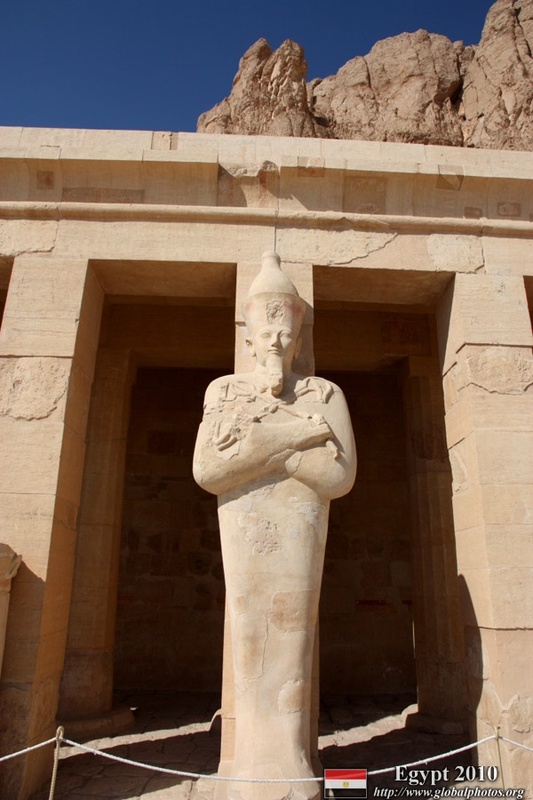 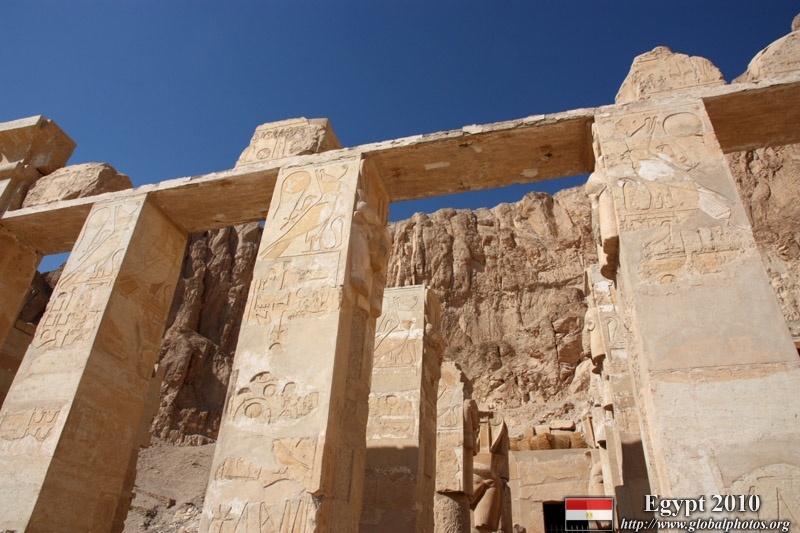 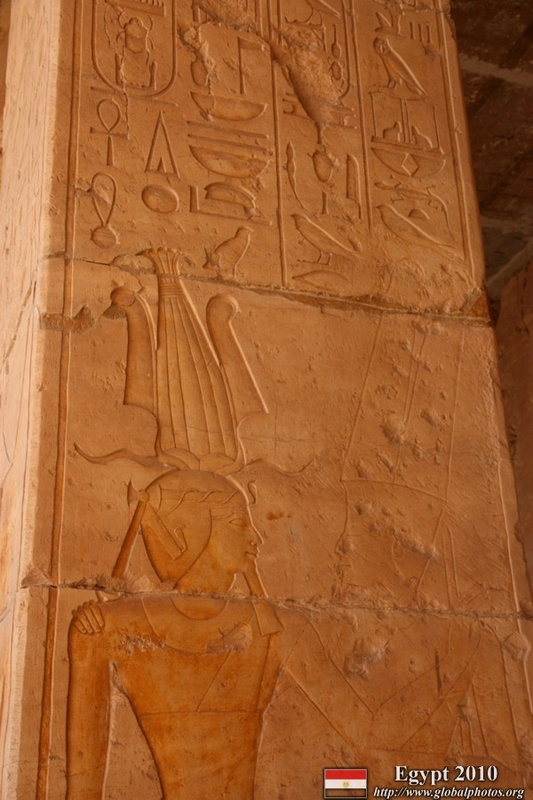 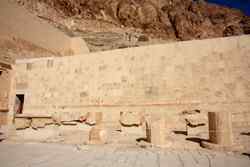 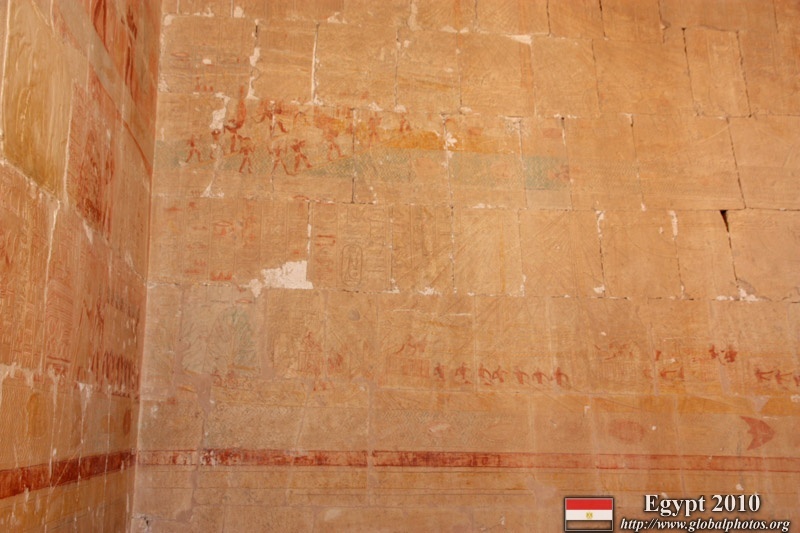 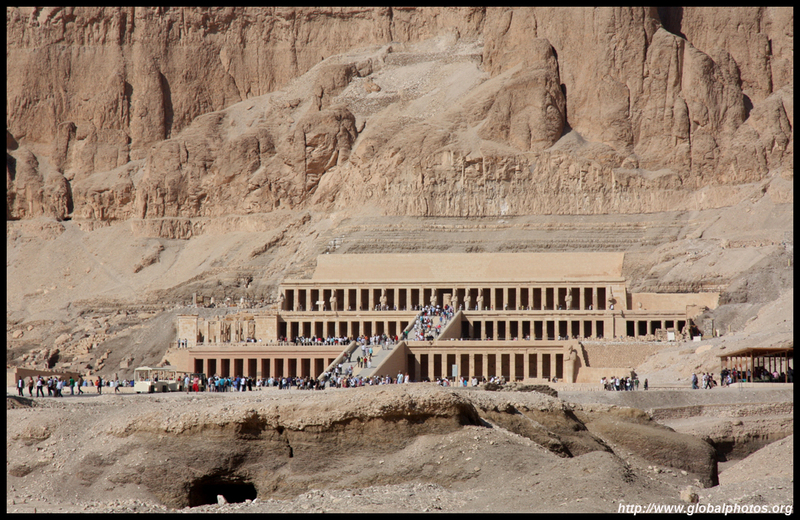 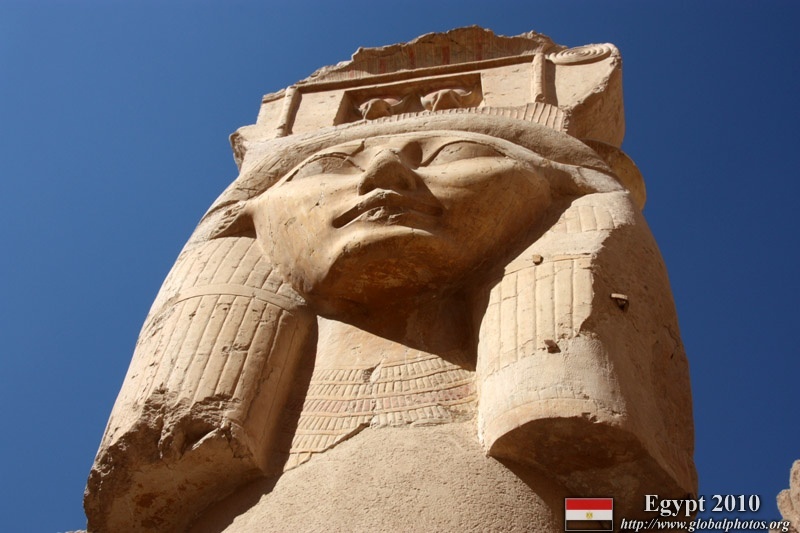 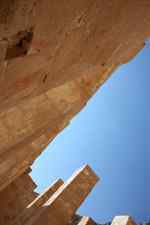 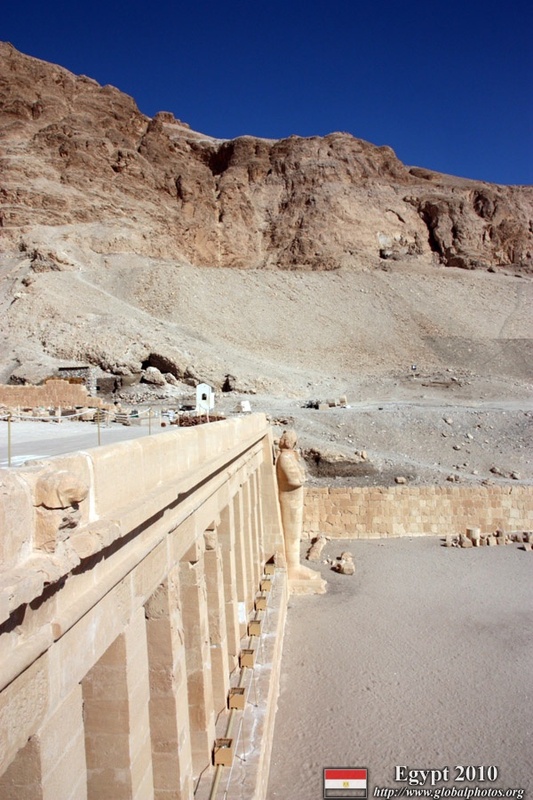 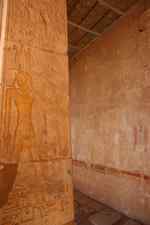 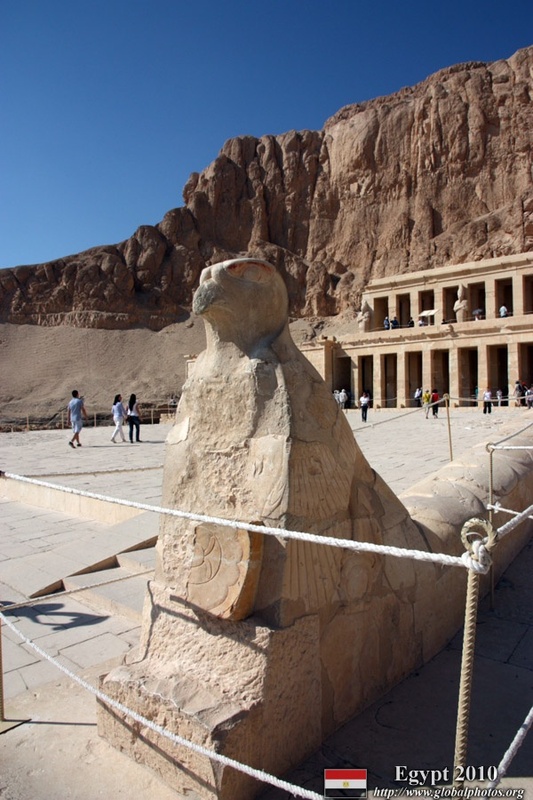 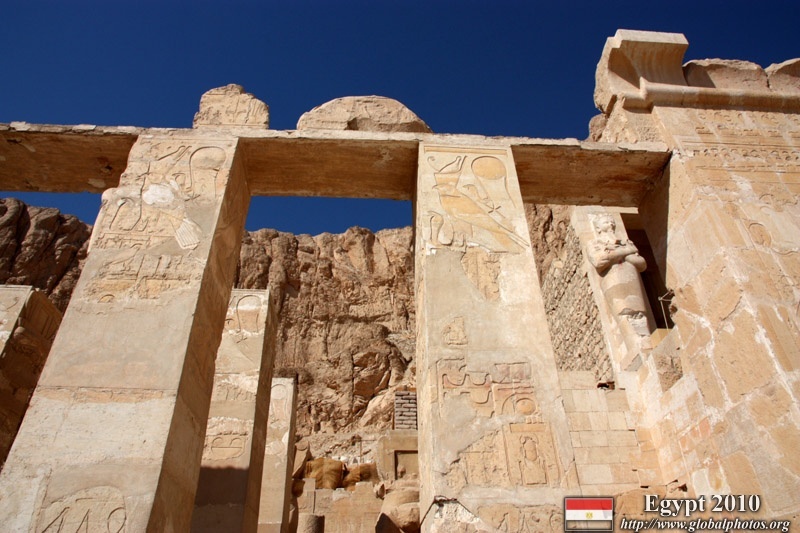 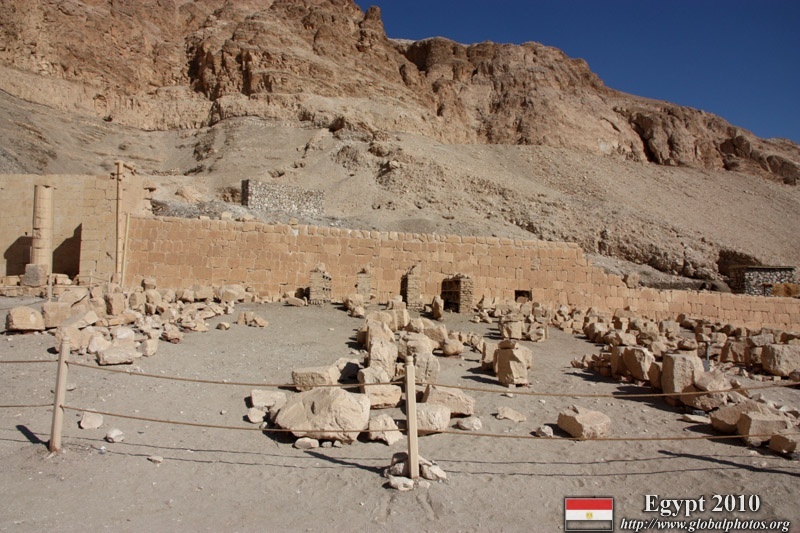 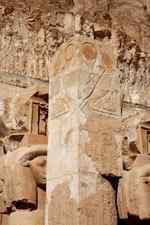 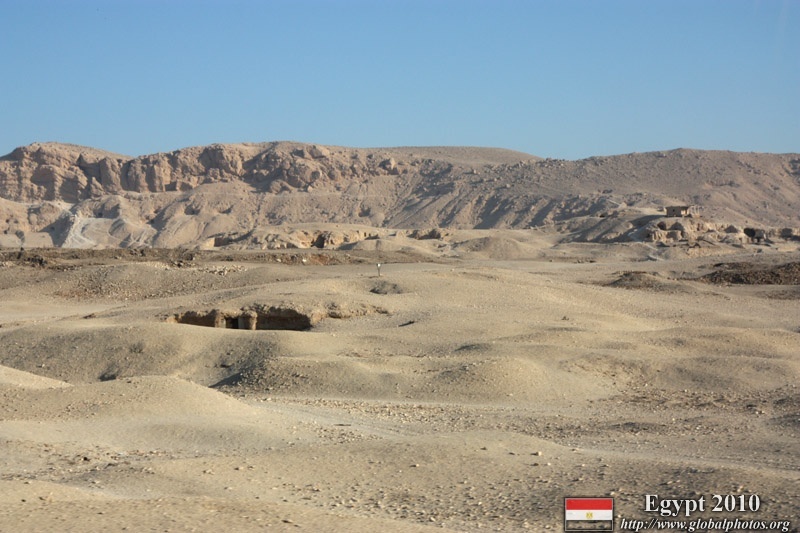 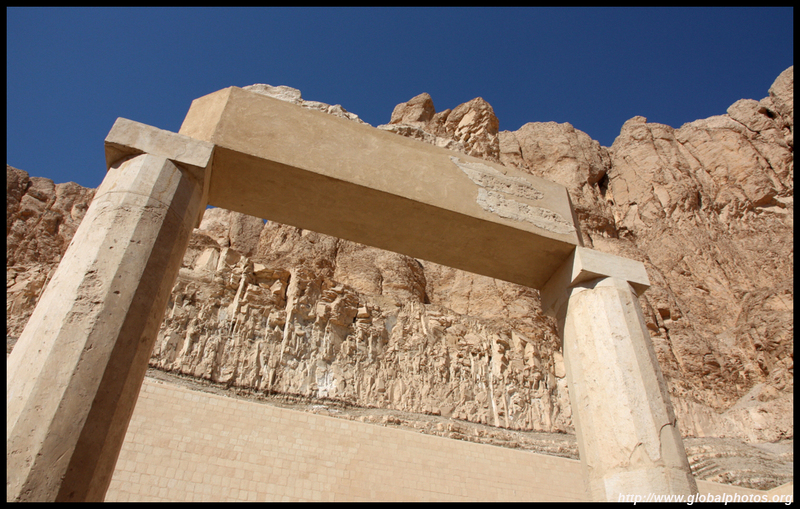 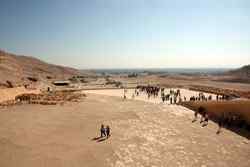 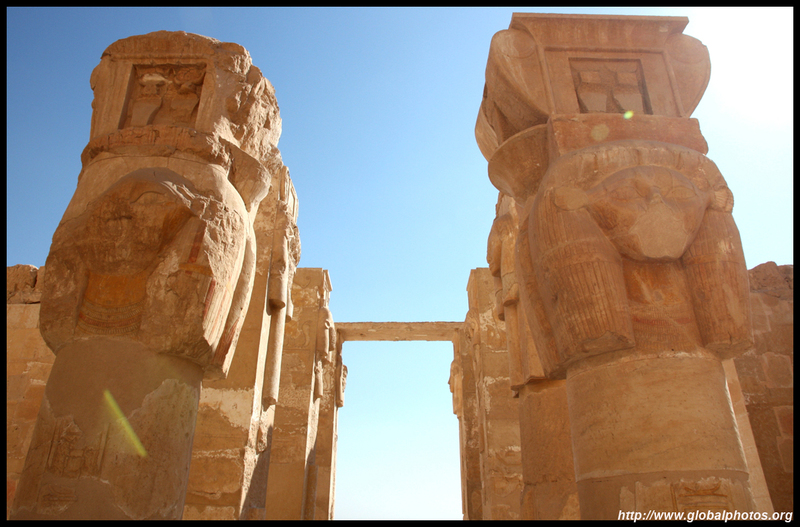 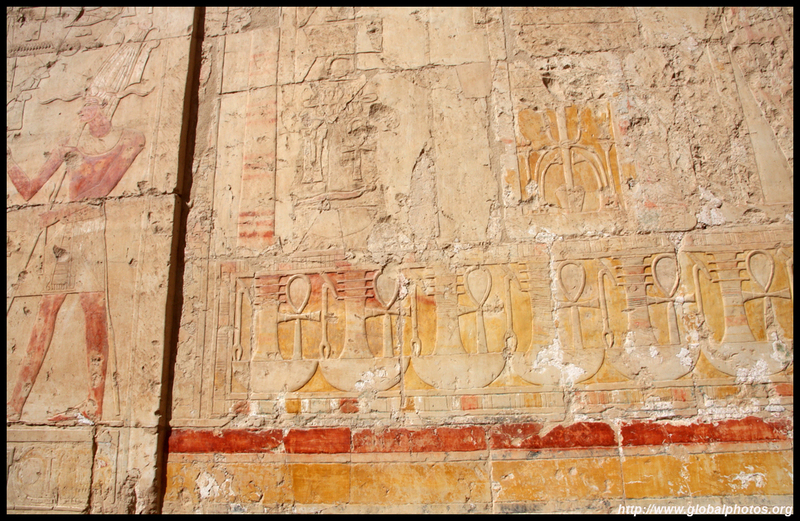 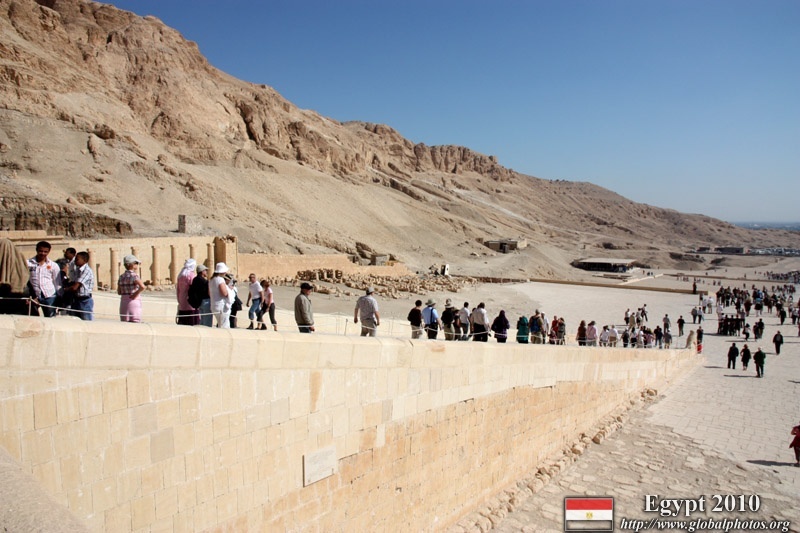 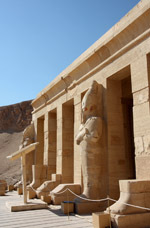 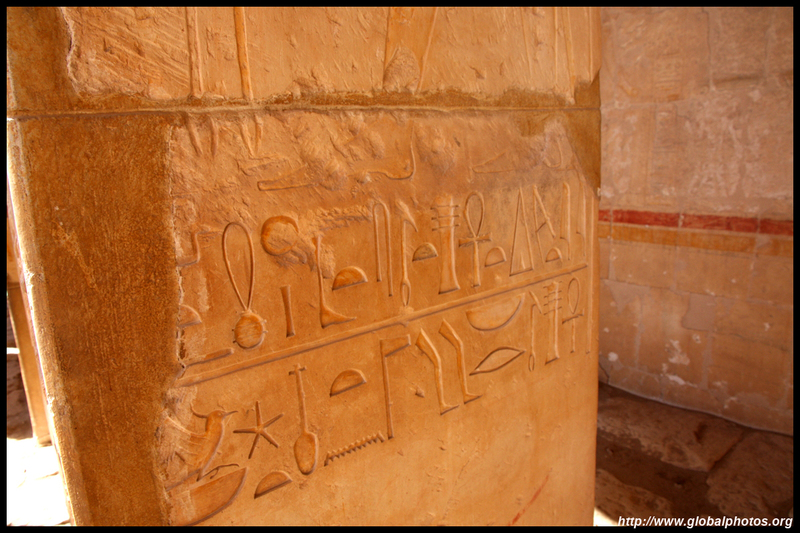 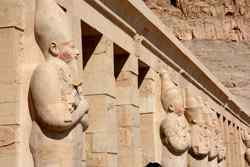 The Temple of Hatshepsut was purposedly vandalized to erase her mark on history. 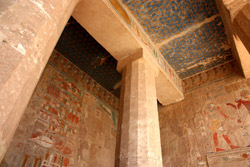 Renovations have somewhat spoiled the historic monument. 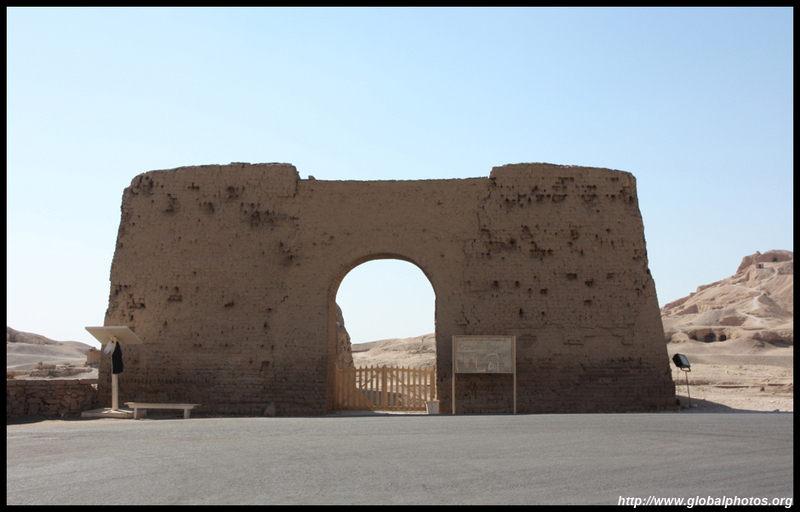 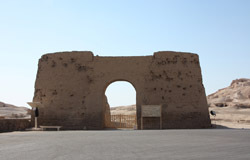 It doesn't look very much like a three thousand year-old structure anymore. 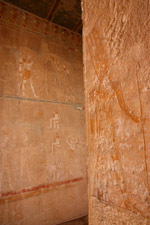 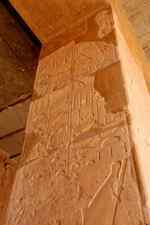 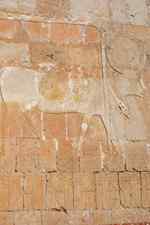 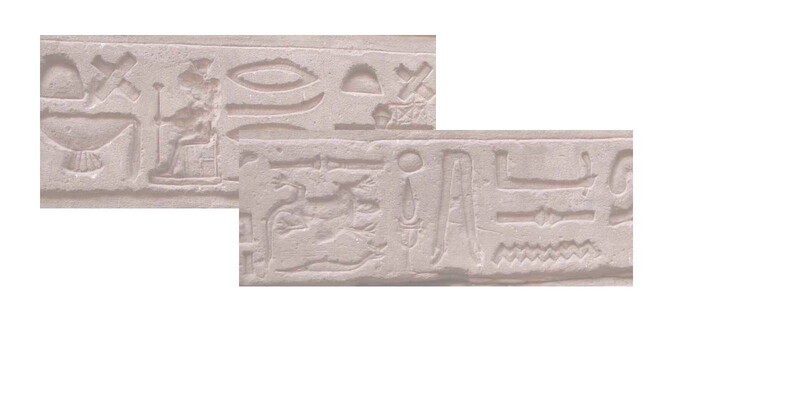 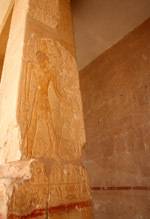 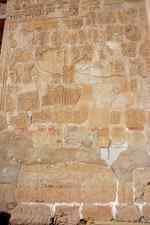 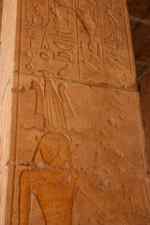 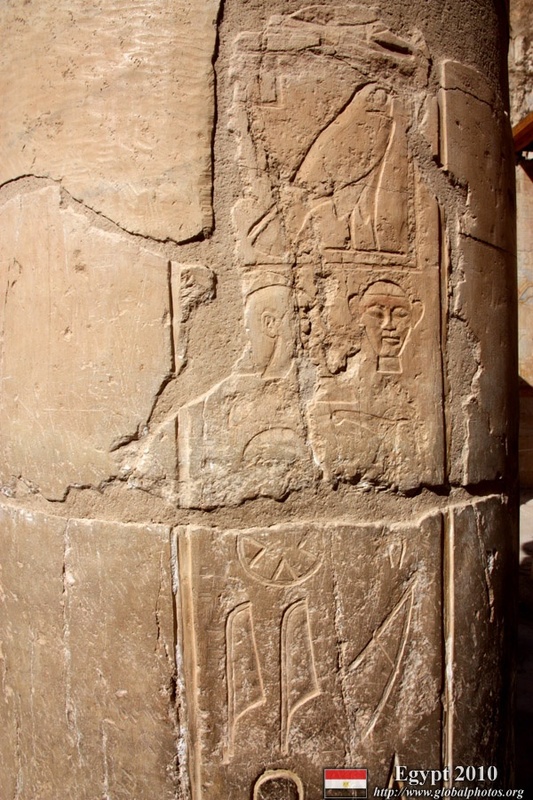 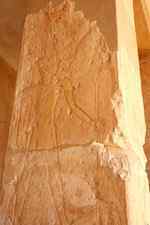 However, the carvings are still visible. 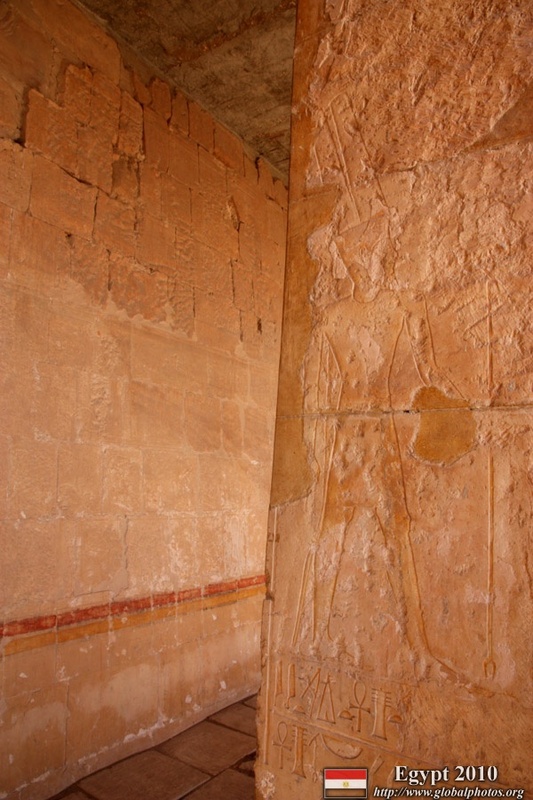 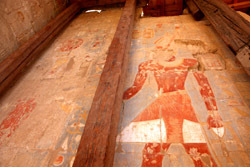 There was a section of the temple where statues have survived in a mix of different shades of good condition. Outside, the landscape is barren and the sun is out. 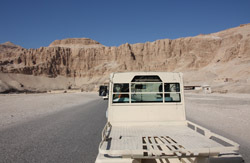 Vehicles ply the short distance between the temple and the entrance. 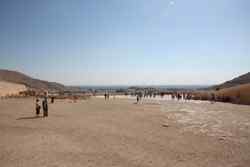 It's actually not a very long walk at all. 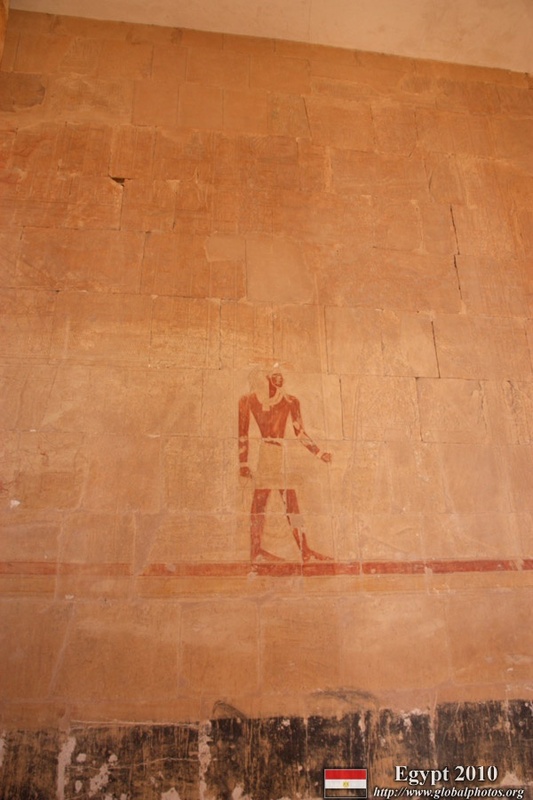 Photography is forbidden in the Valley of Kings itself. 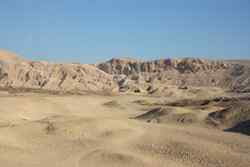 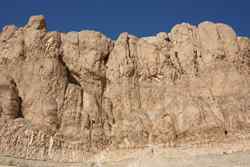 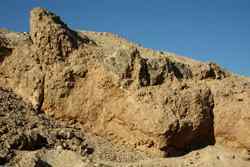 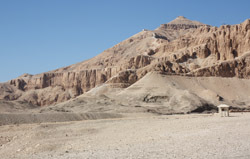 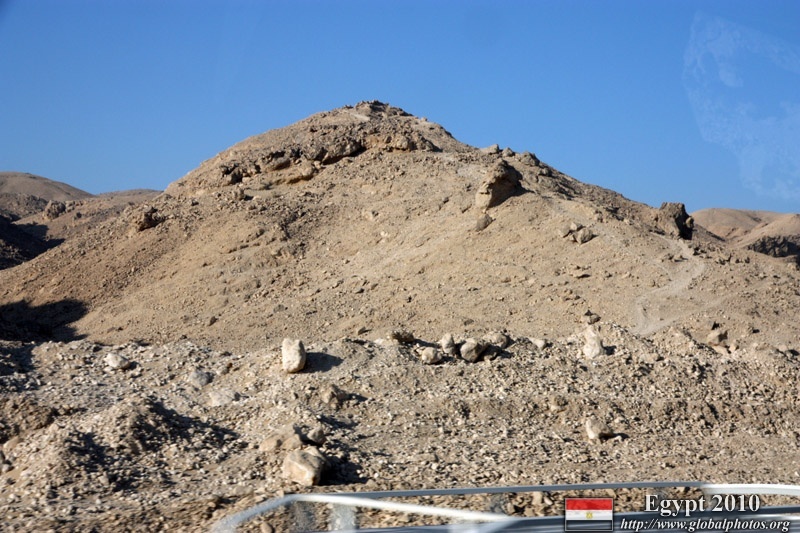 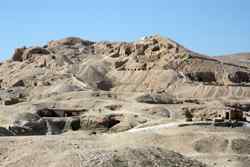 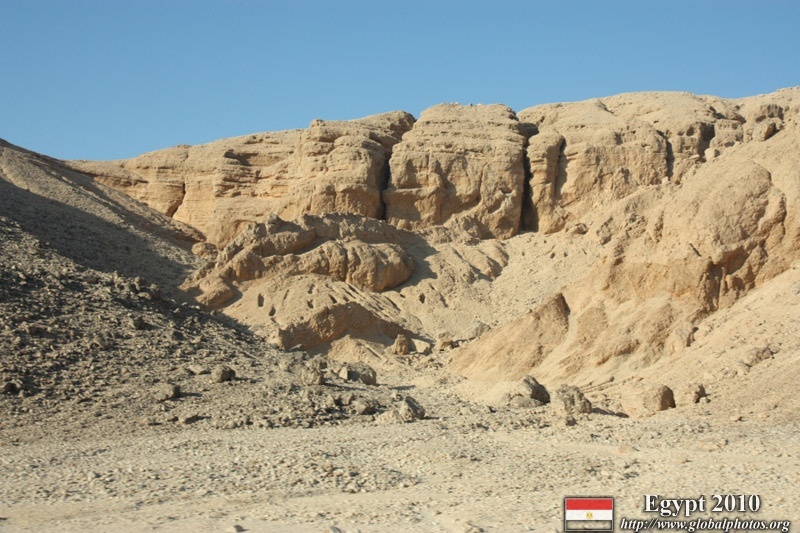 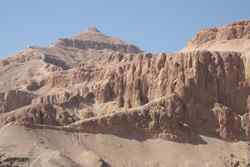 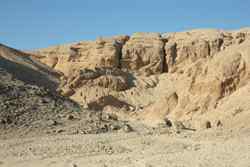 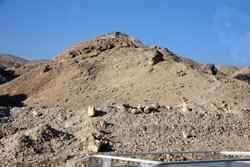 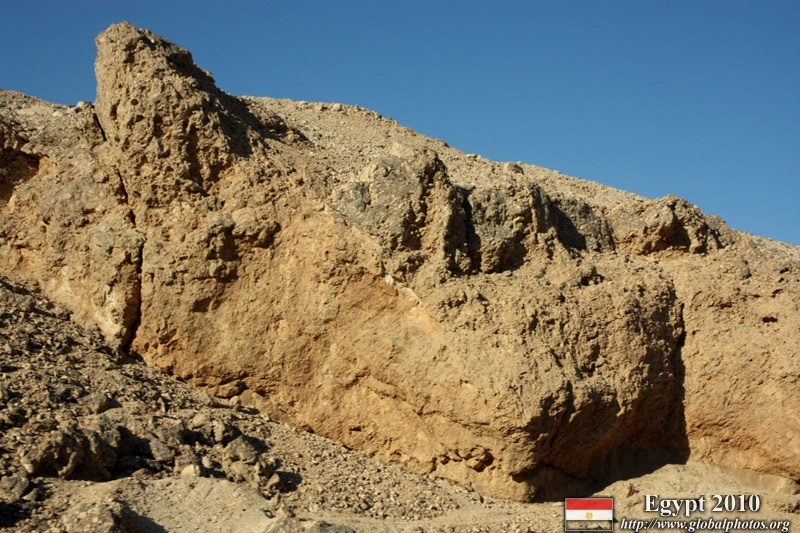 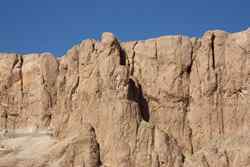 The scenery is one of hills, desert, and rocks. 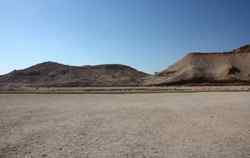 Here are some photos from the surrounding areas.